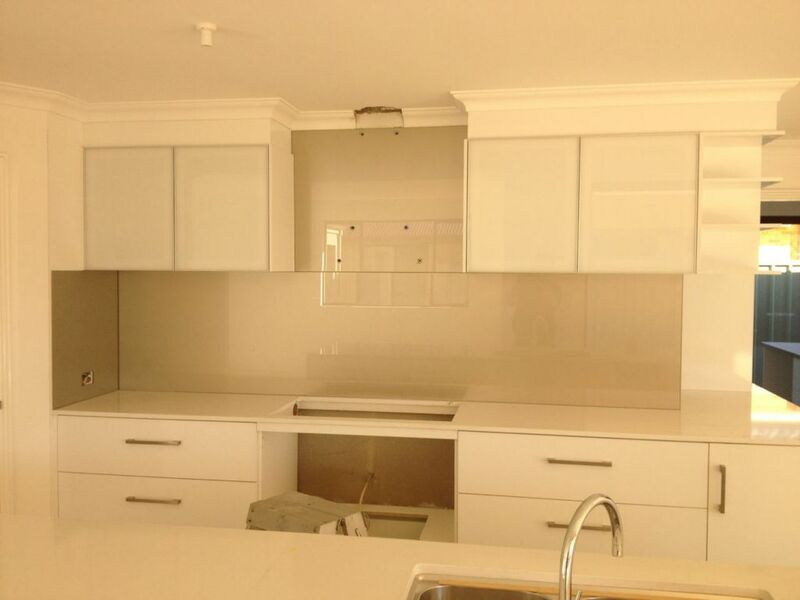 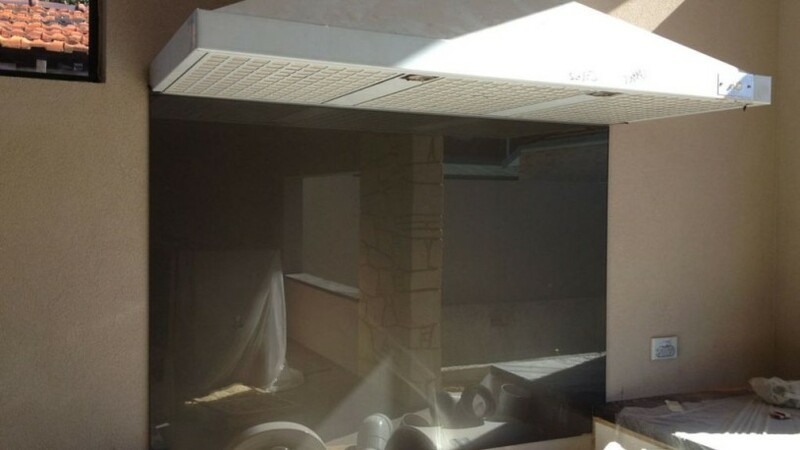 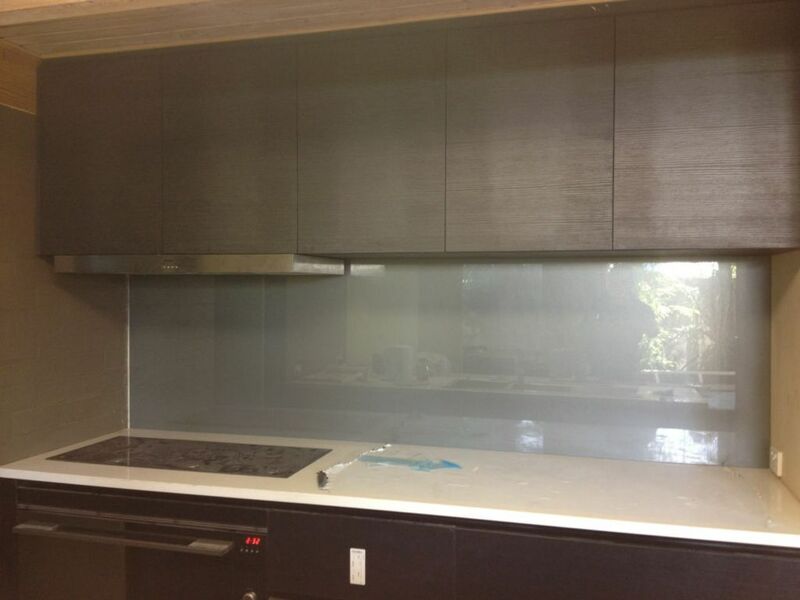 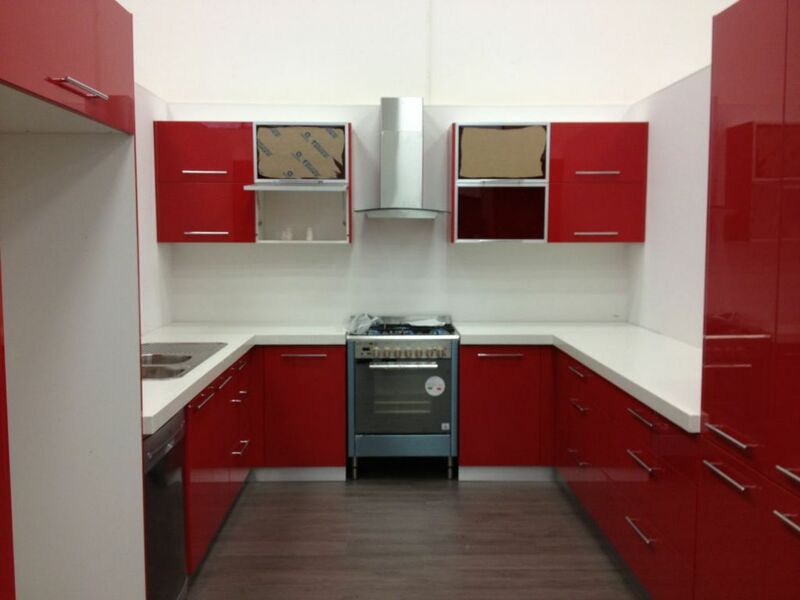 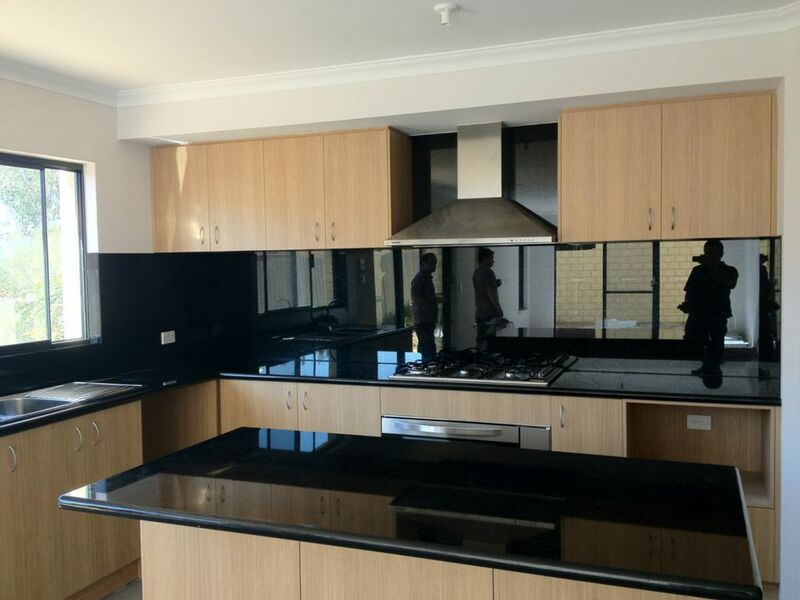 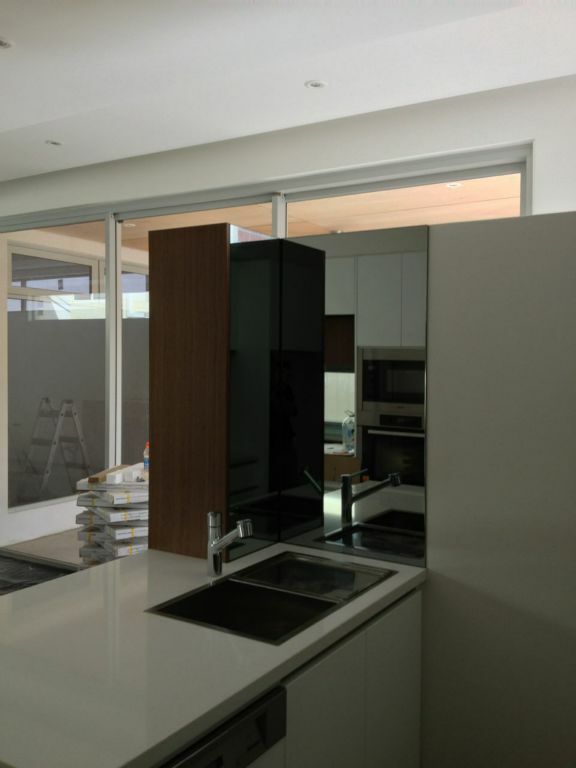 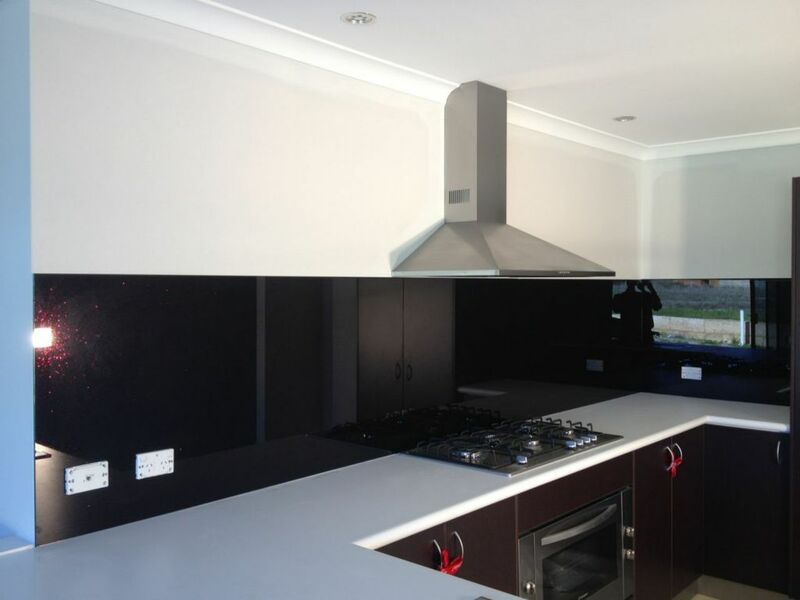 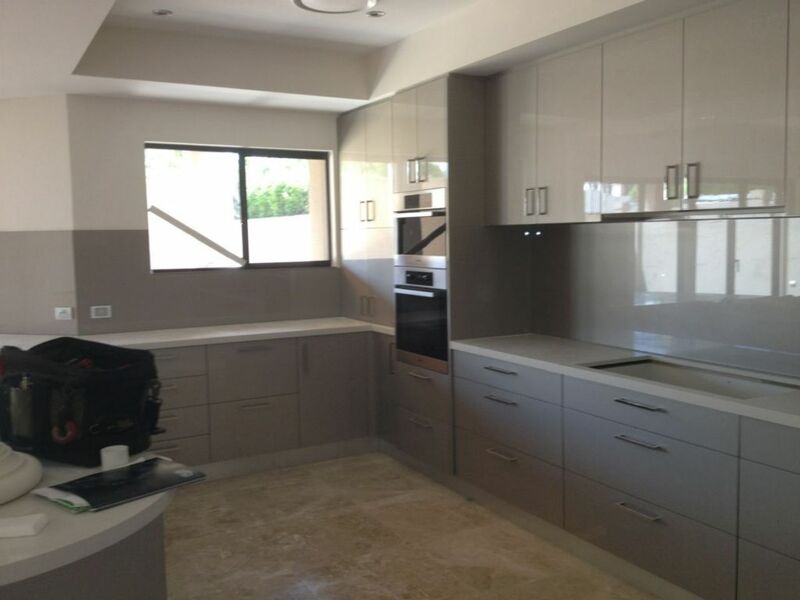 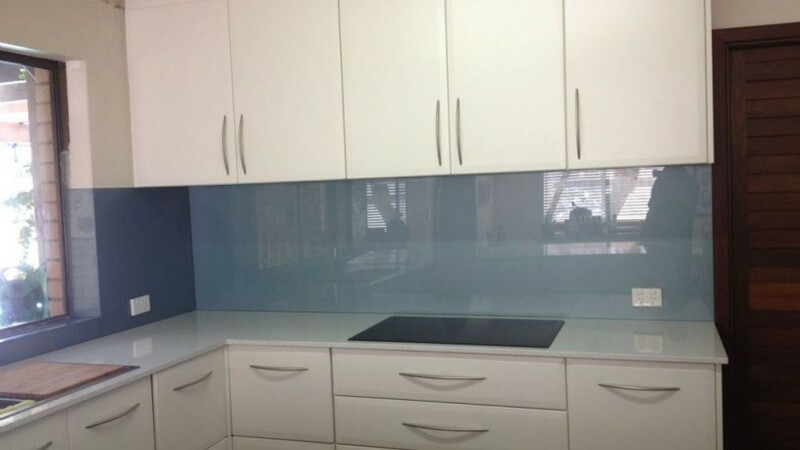 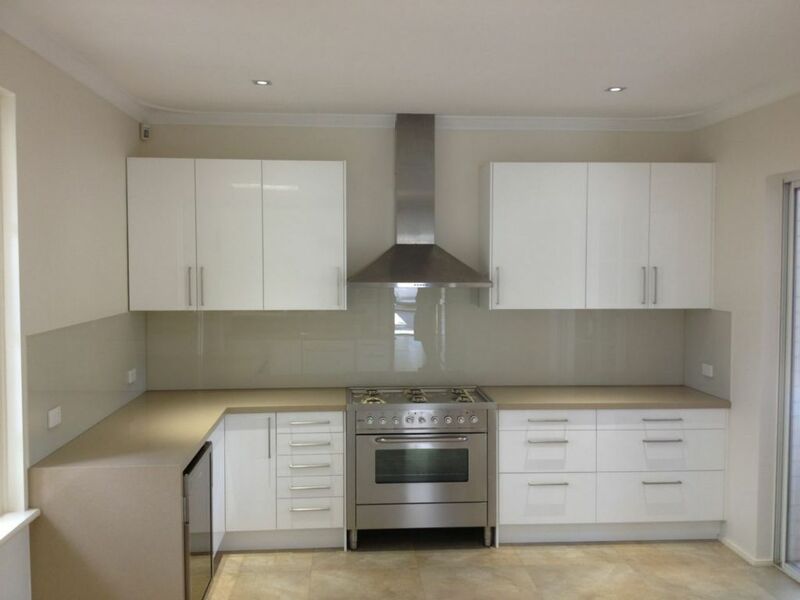 WA Custom Glass specializes in the installation of custom designed Splashbacks for new and renovated homes in the Perth Metro Area. 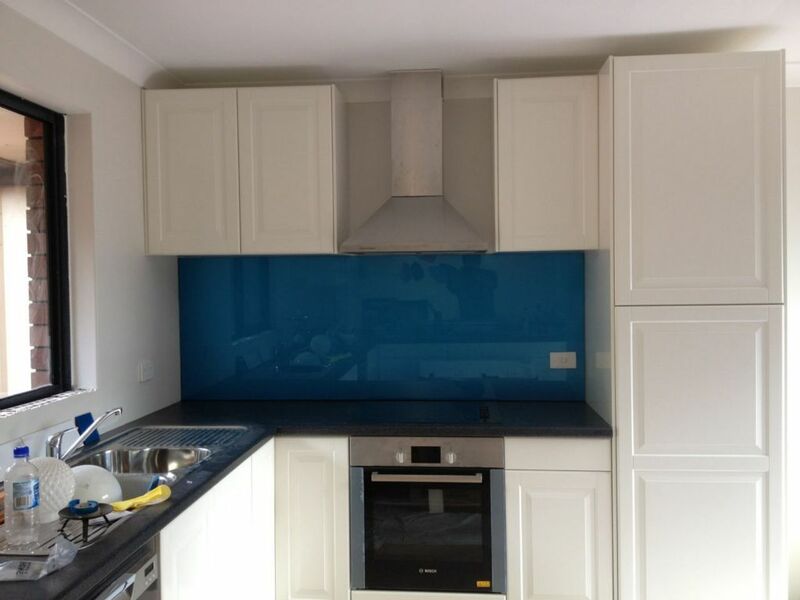 Our highly trained Glaziers have the most experience installing glass splashbacks in the business and use the state of the art crosshair laser system to guarantee a perfect fit. 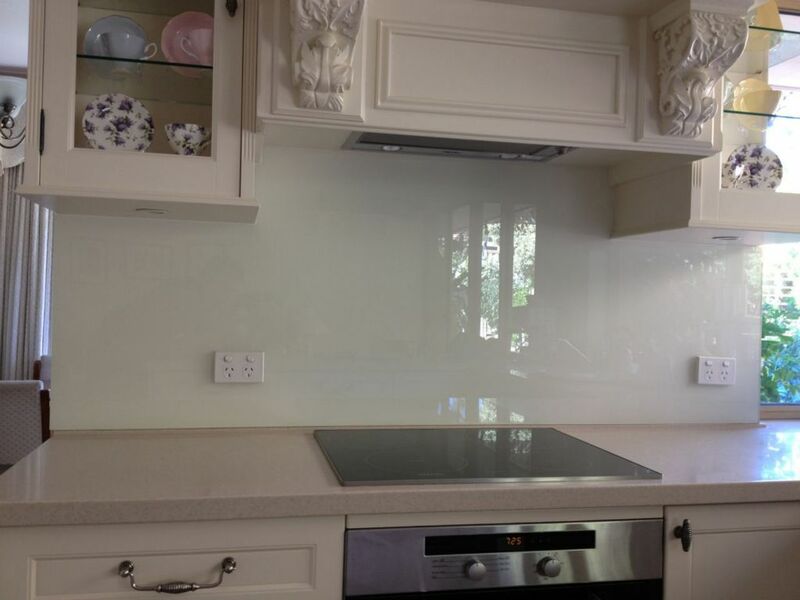 Our glass is always Grade A toughened safety glass, this highly durable glass not only prevents cracking or chipping, but also allows us to install pieces behind stove tops or other areas that might face extreme heat stress. 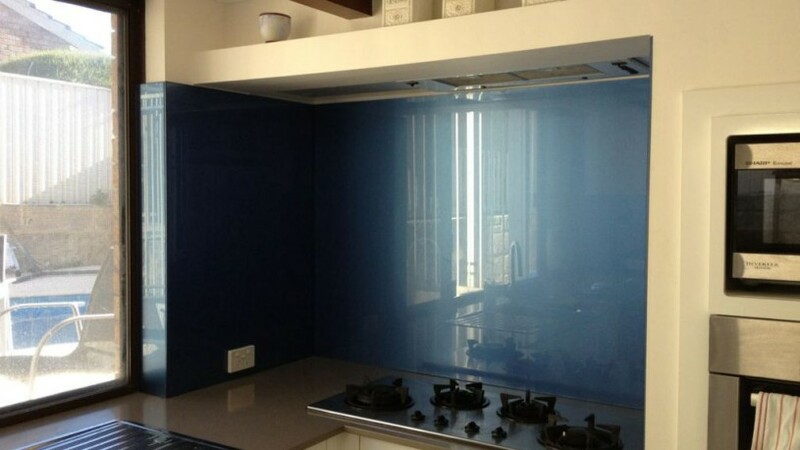 Our specially designed paint that binds to the glass is guaranteed to not fade or warp. 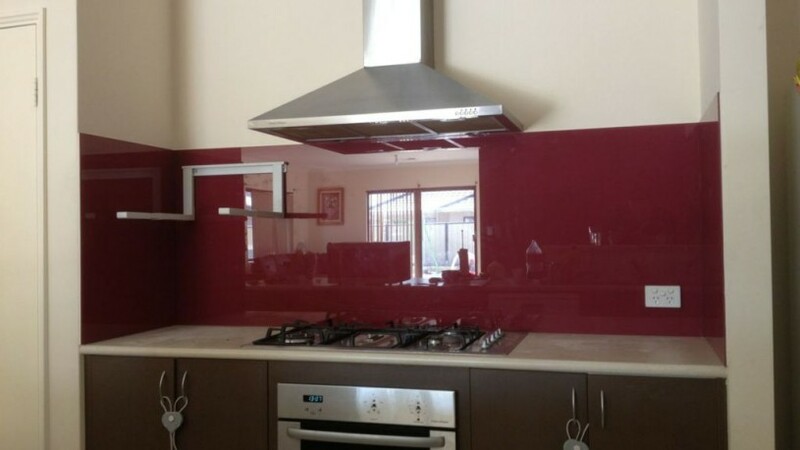 We offer the highest colour selection in the area because each order can custom mixed to your specifications; for an additional fee your colour selection is limited only by what you can imagine. 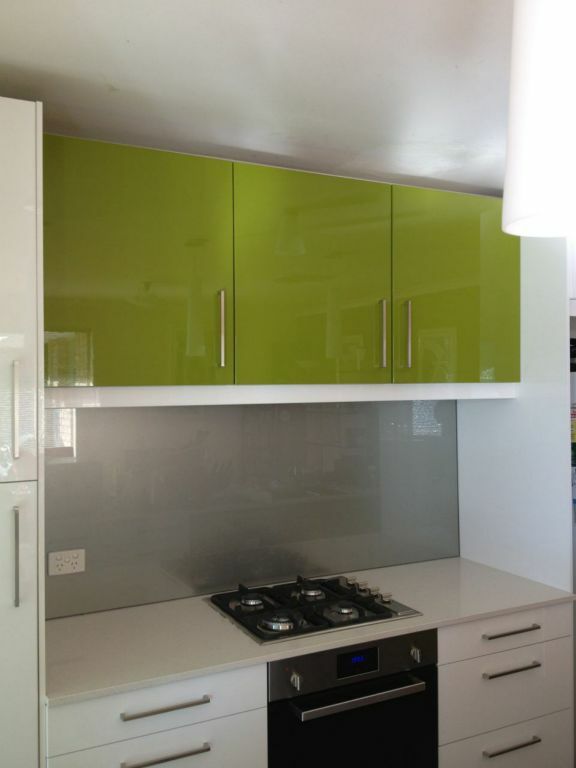 Or for a more cost effective choice you may select from our large collection of standard colour range. 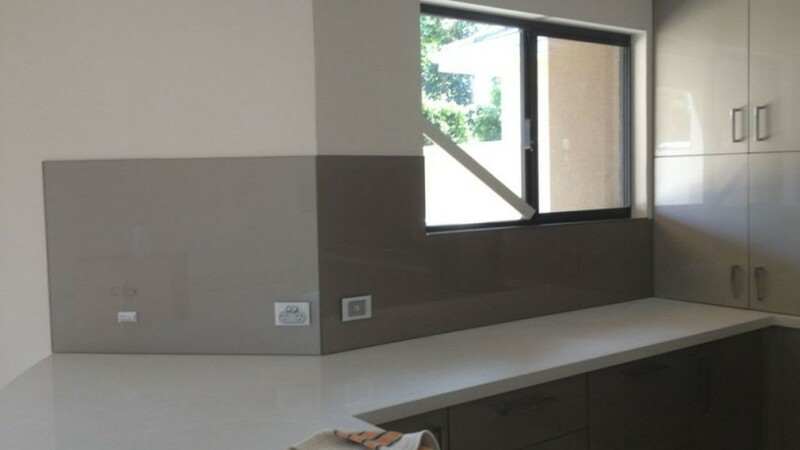 For a free, no obligation quote, please call our sales team at 9418 6222 or stop by our show room at 2/14 Hydro Rise in Bibra Lake. 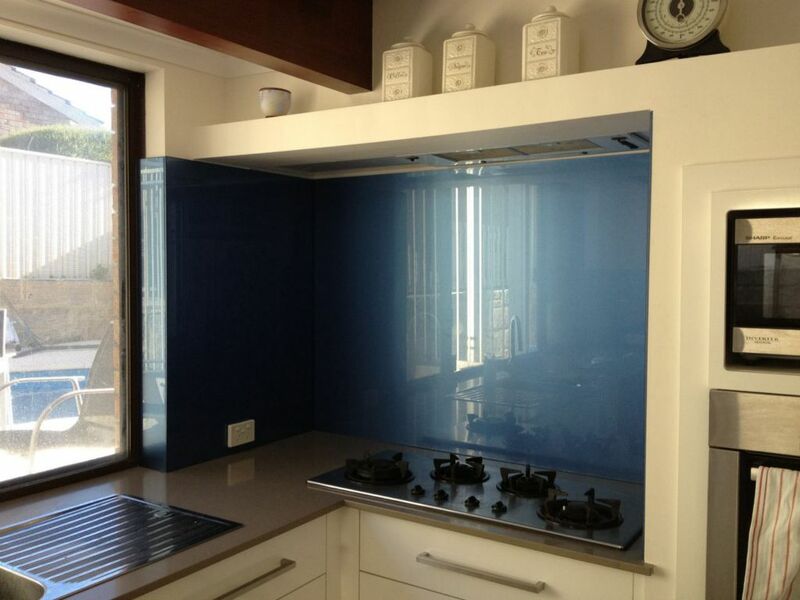 During the process of making glass, small amounts of Iron are used in the solution. 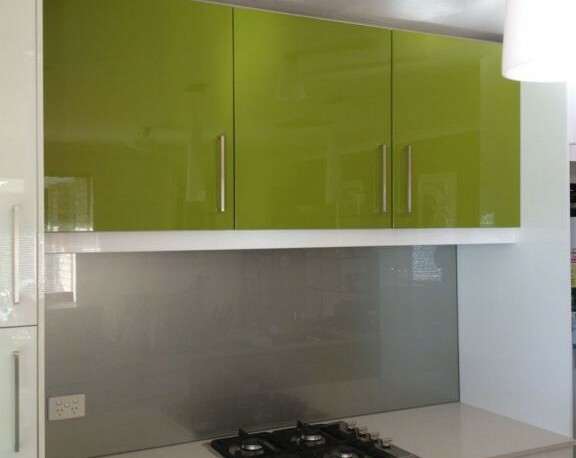 Because of this, Standard Glass has a natural green hue. 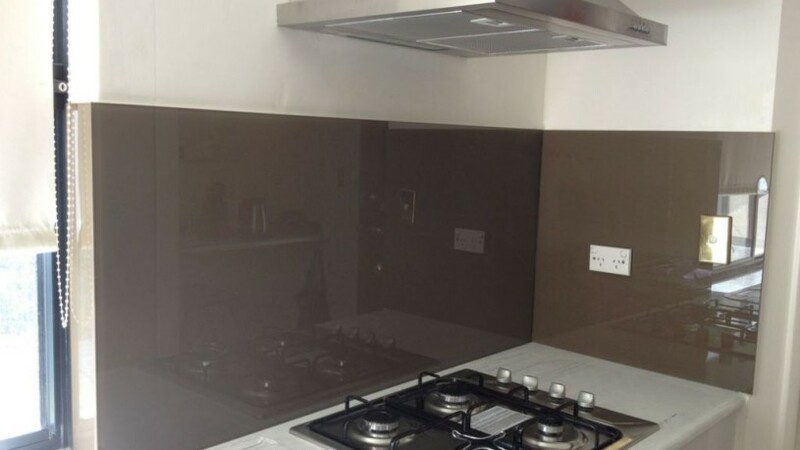 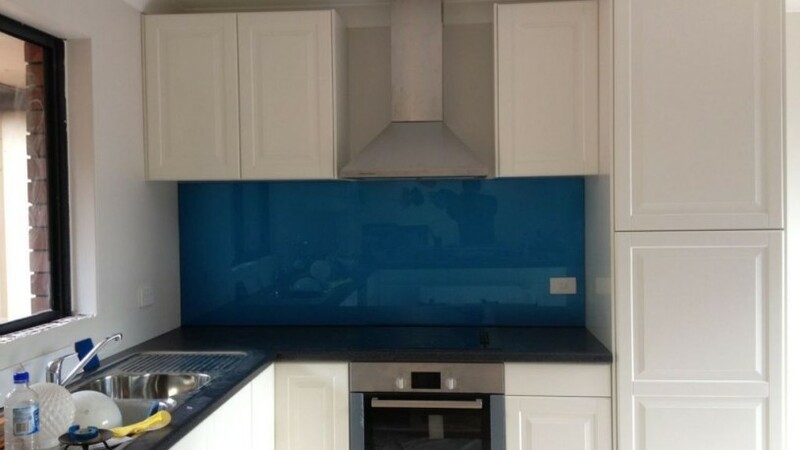 This slight colour variation in standard glass may distort lighter coloured paint on Splashbacks but does not affect darker colour selections. 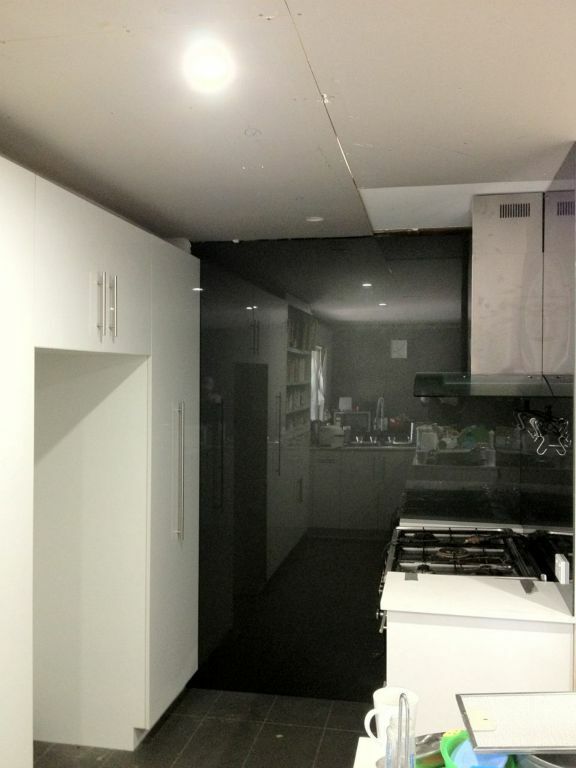 If you want to remove the risk of colour distortion with a light coloured paint then Ultra Clear may be your best option. 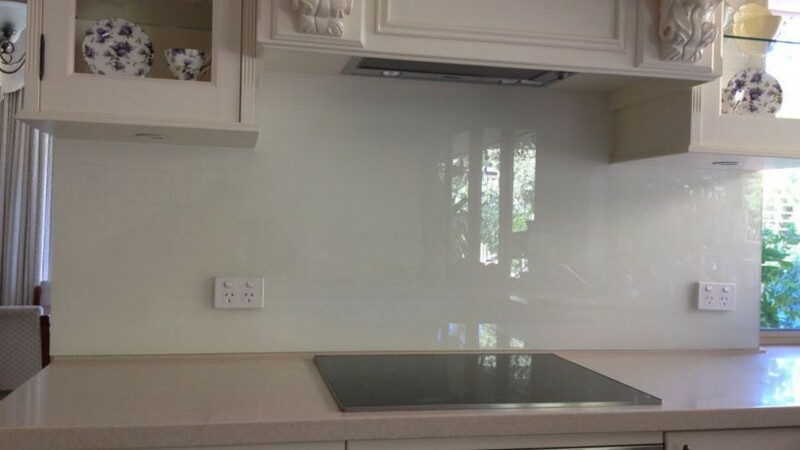 Ultra Clear goes through an additional process which removes a high percentage of the iron from the glass, leaving the glass as clear as possible. 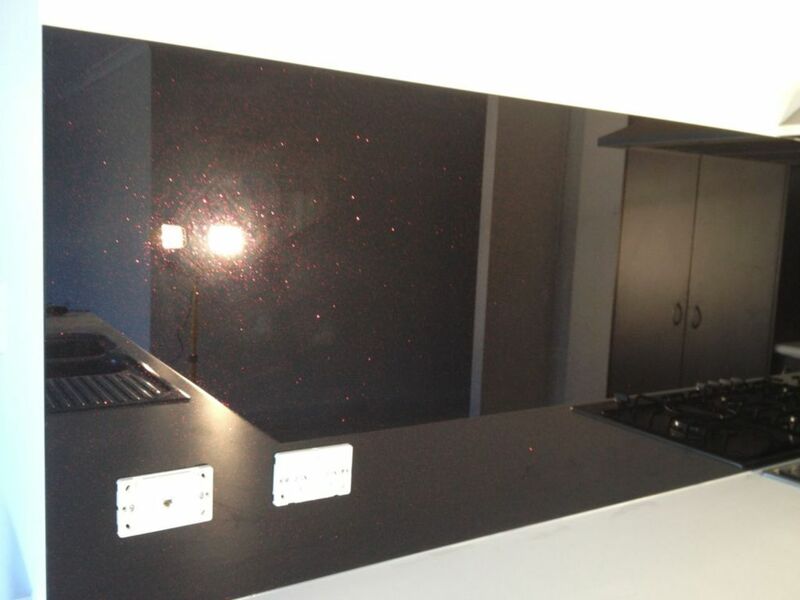 This process improves colour representation and will give you an accurate depiction of the colour you have selected. 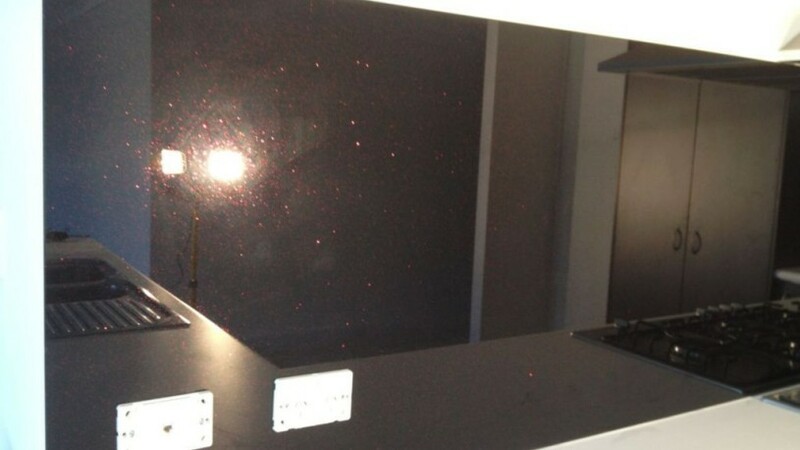 Solar mirrored glass, unlike a regular mirror, is actually a combination of paint coating on the glass that gives off a reflective appearance. 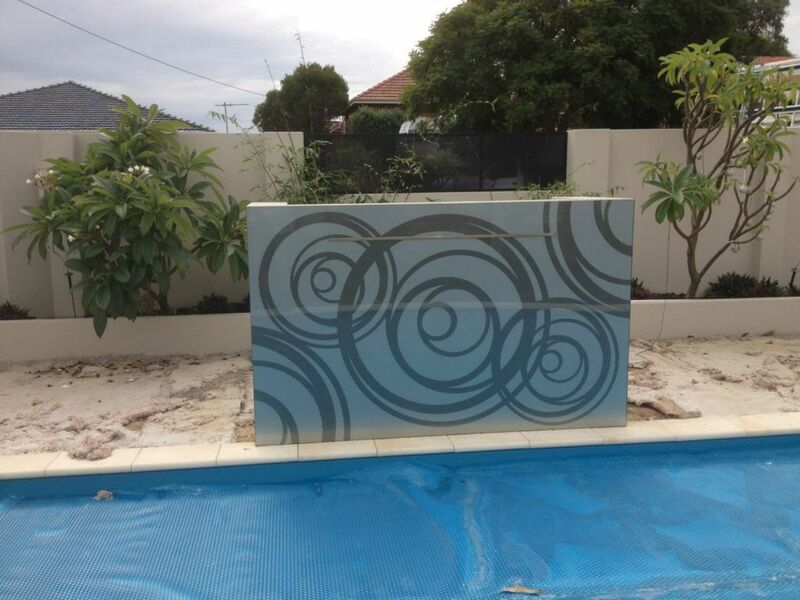 This process eliminates the paint from flaking or peeling due to weather conditions. 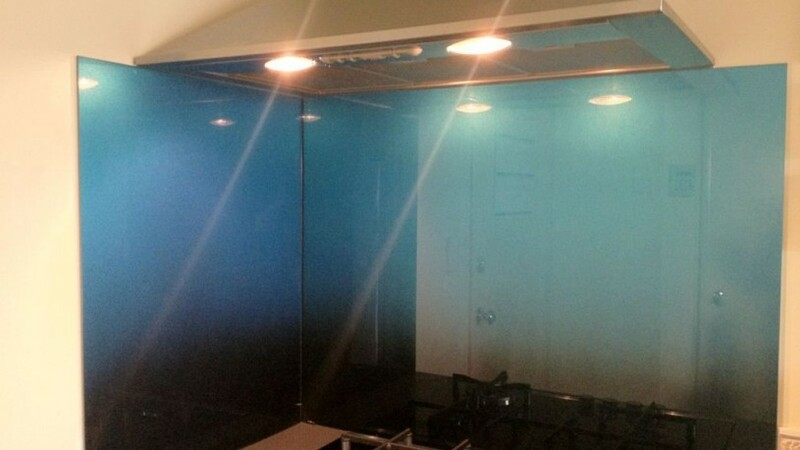 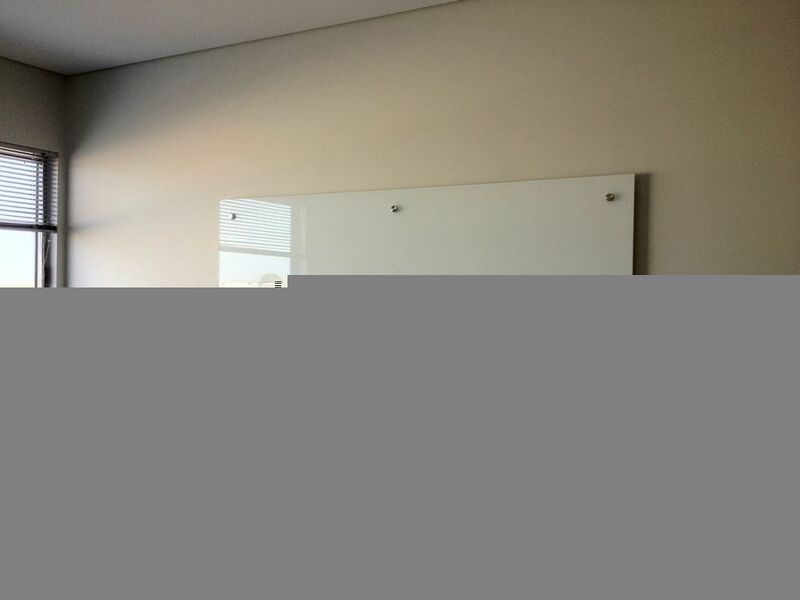 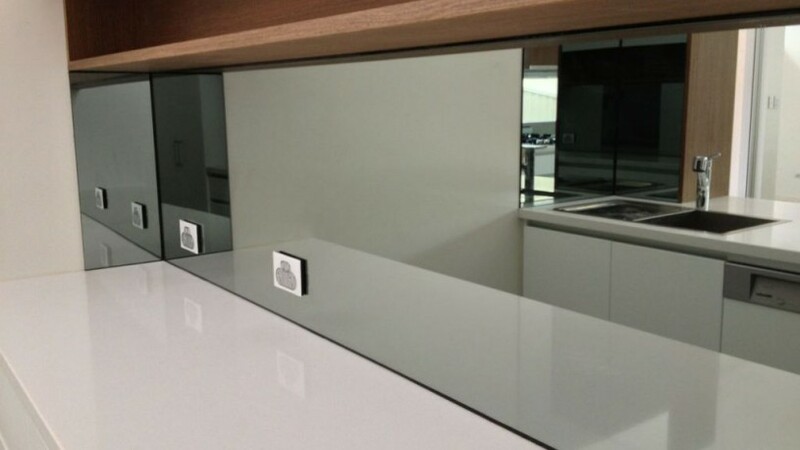 Mirrored Glass is ideal for feature pieces or for maximising the visual perception of space. 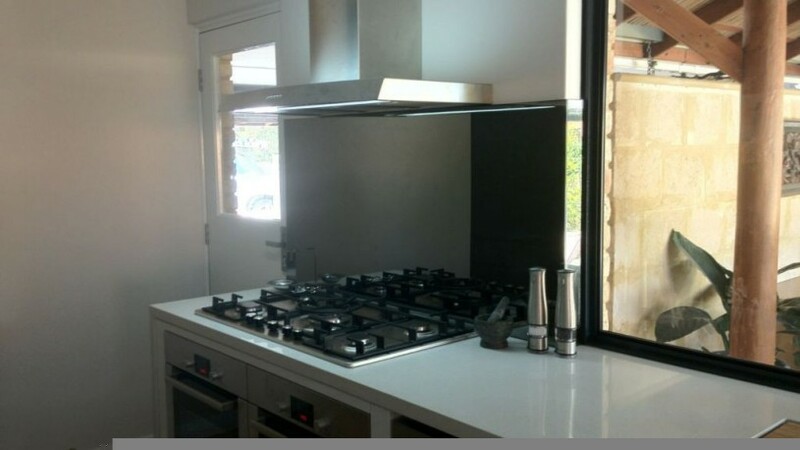 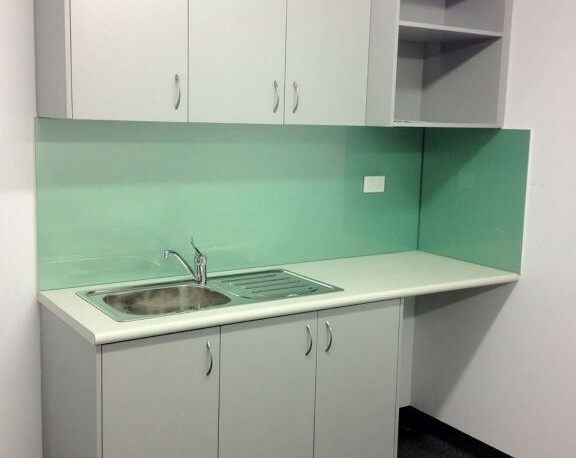 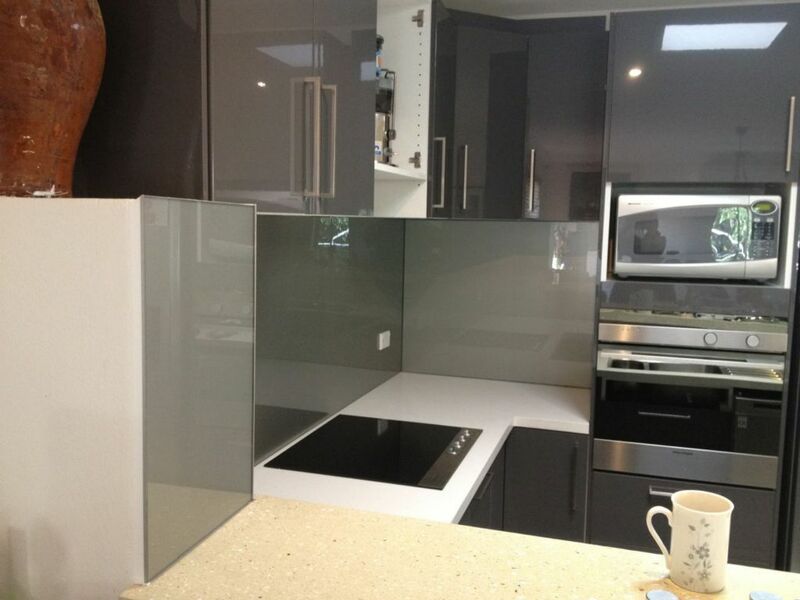 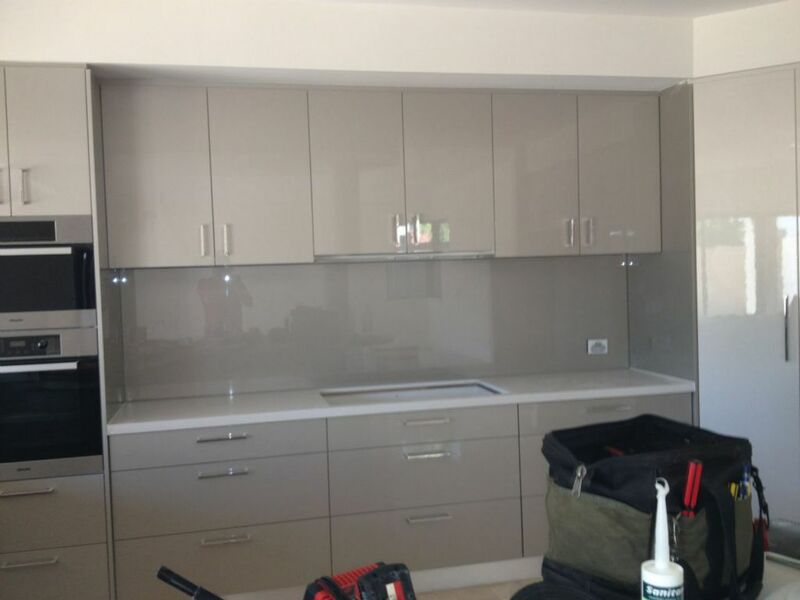 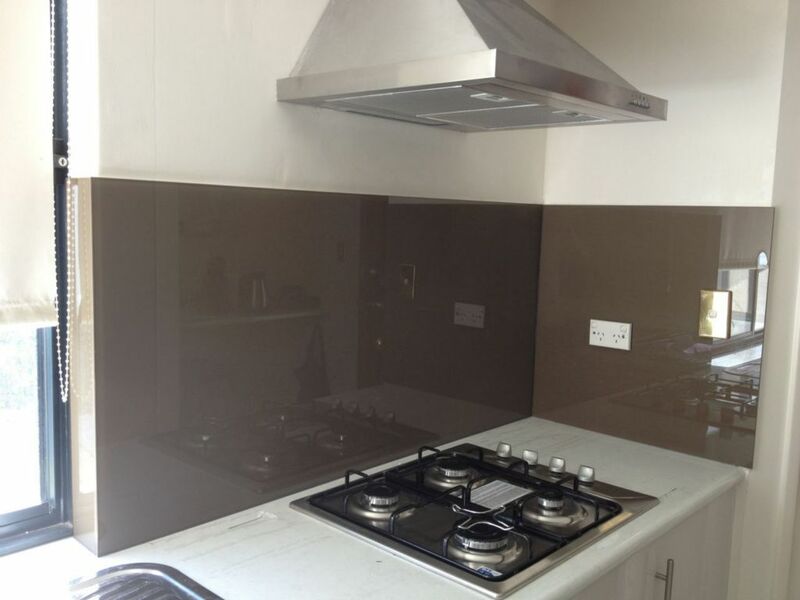 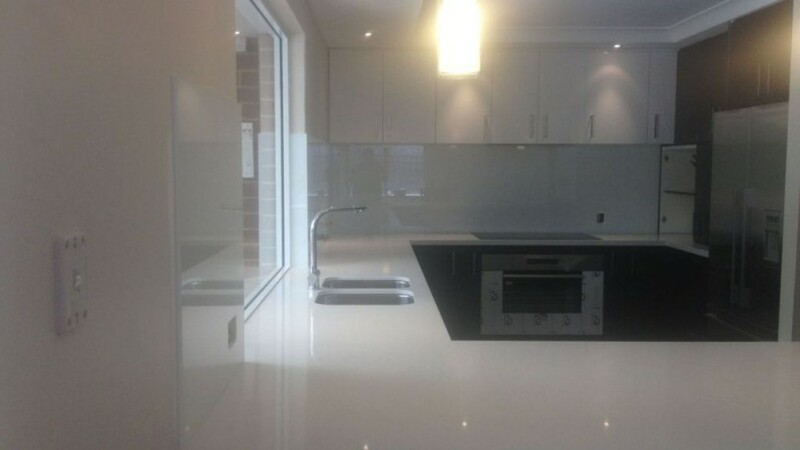 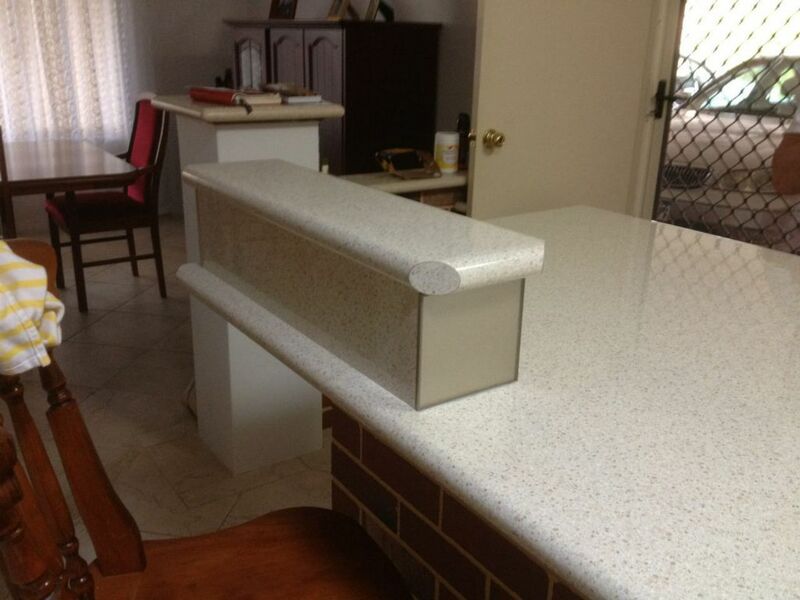 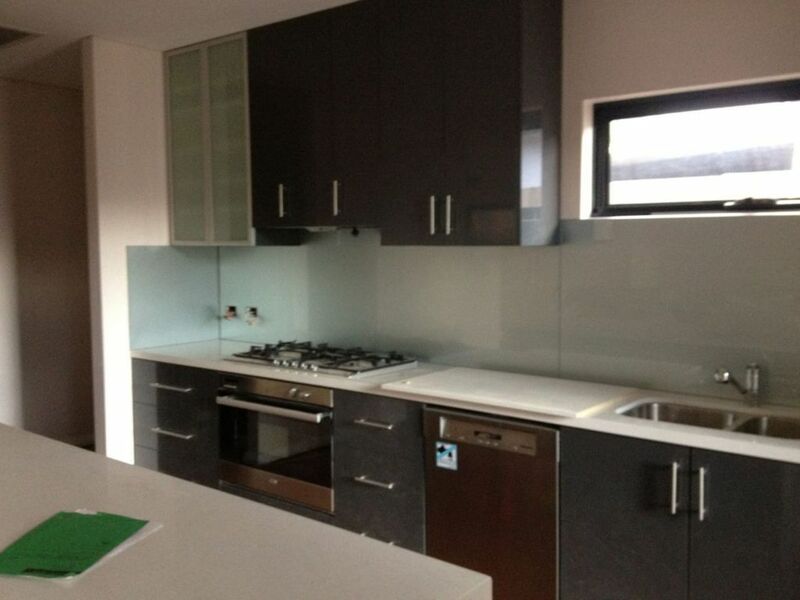 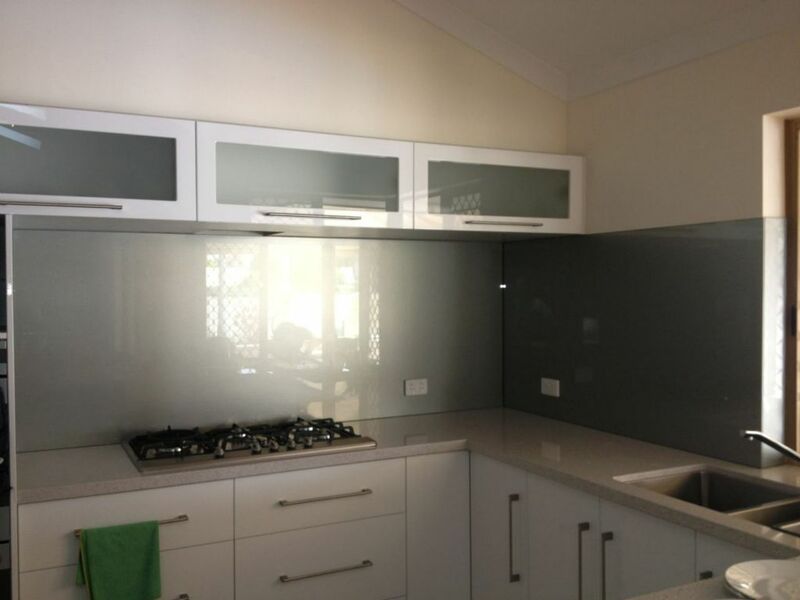 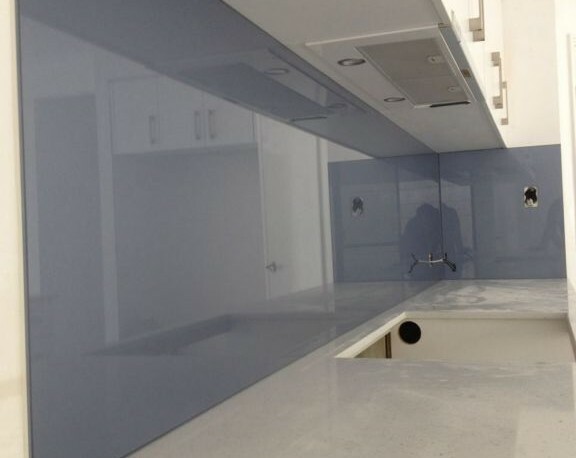 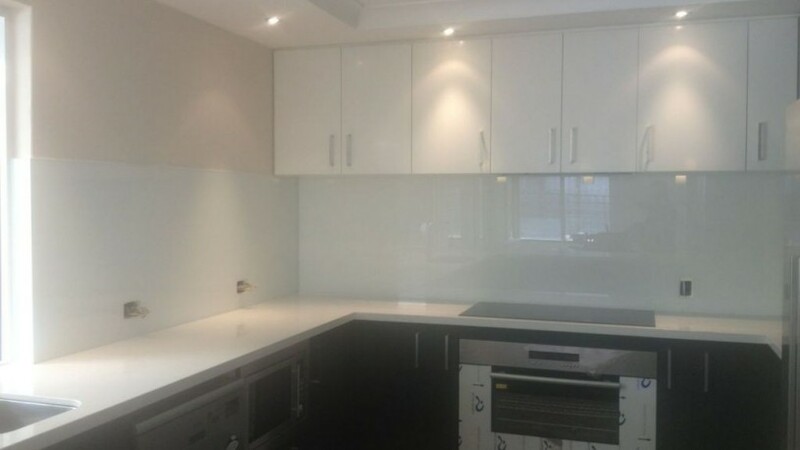 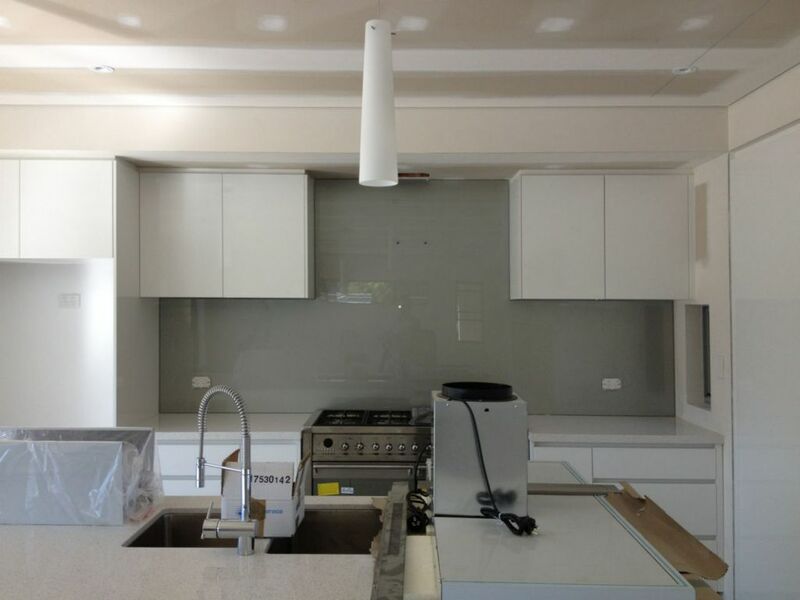 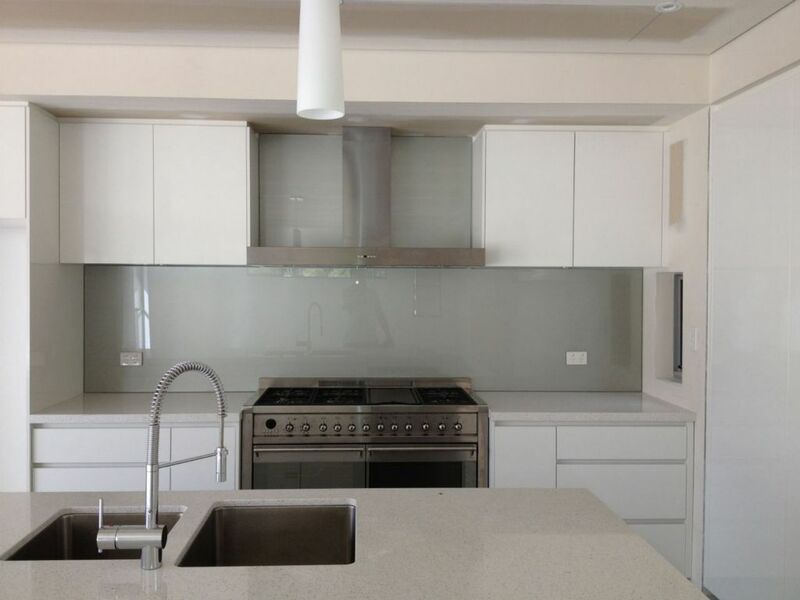 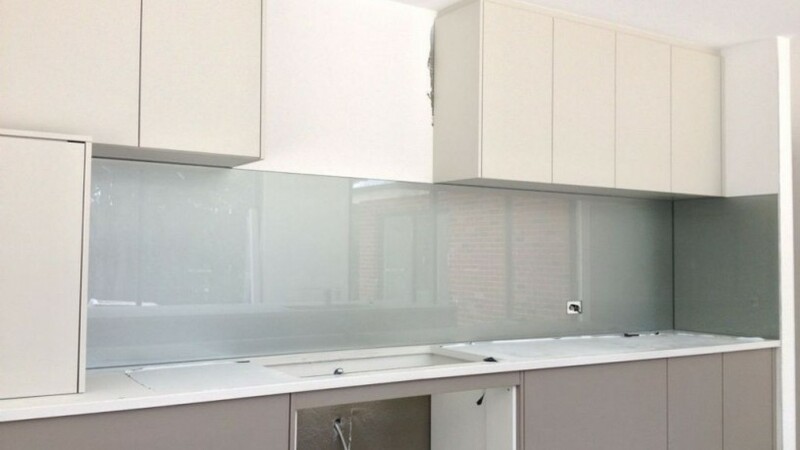 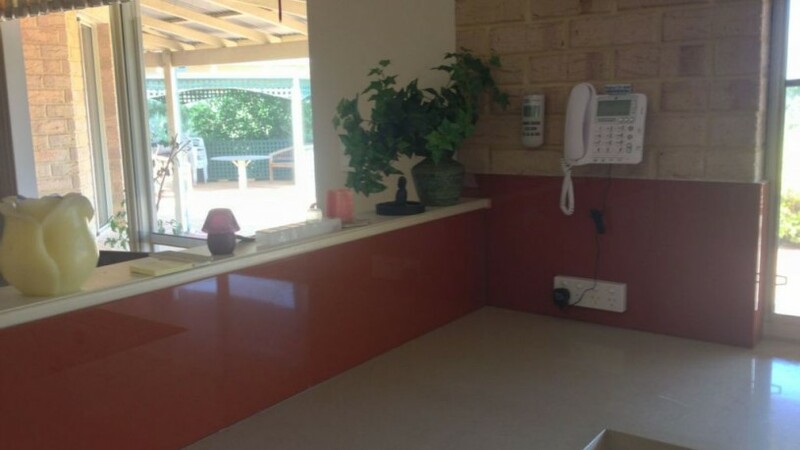 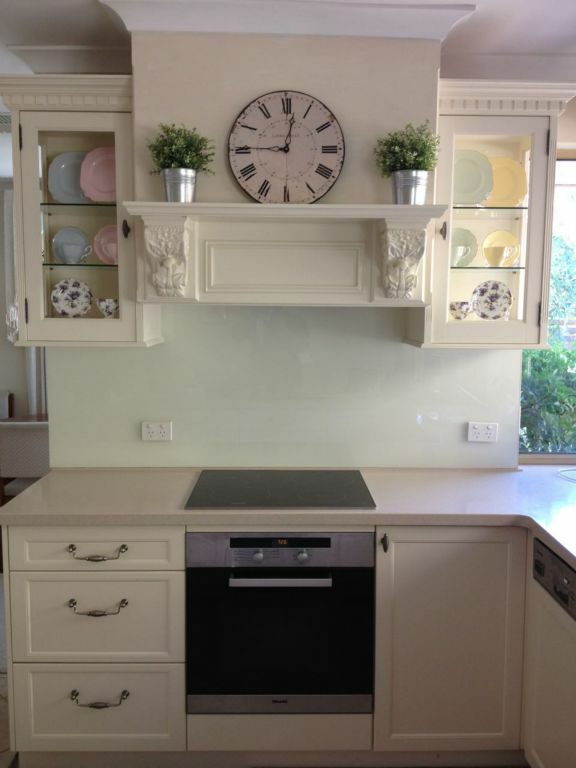 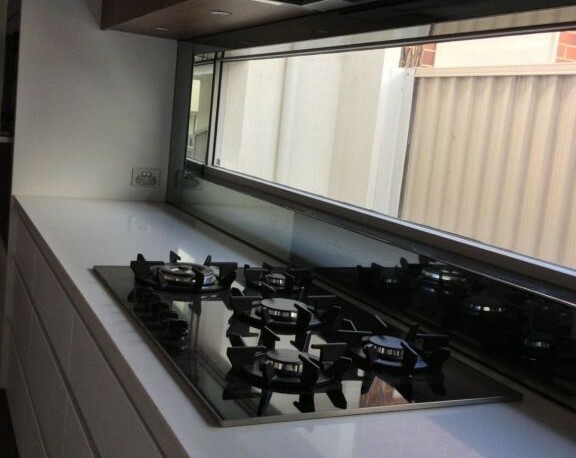 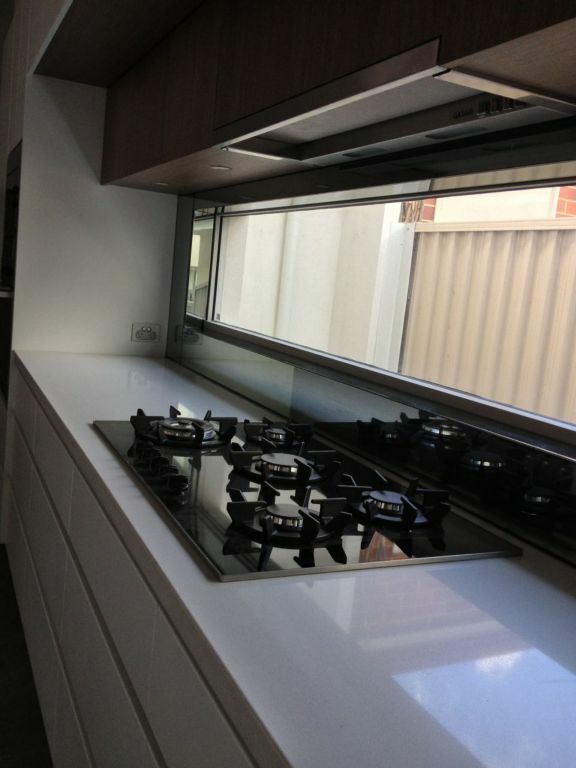 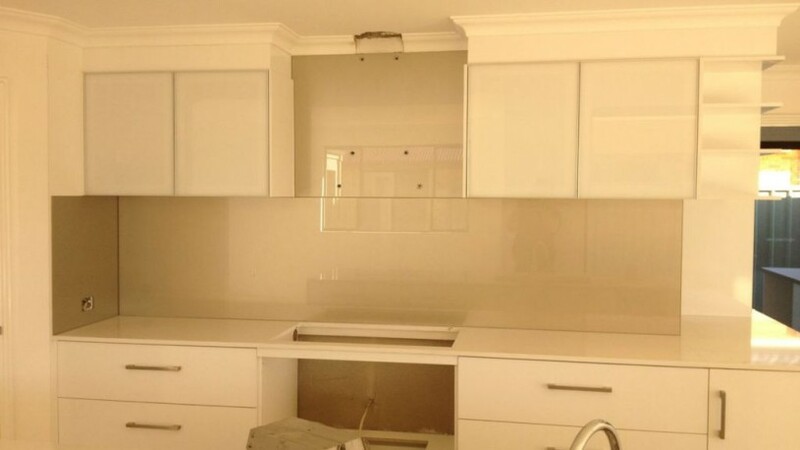 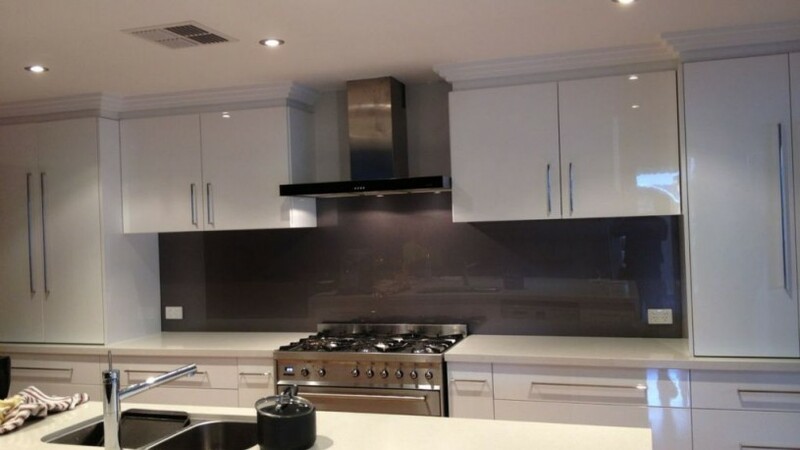 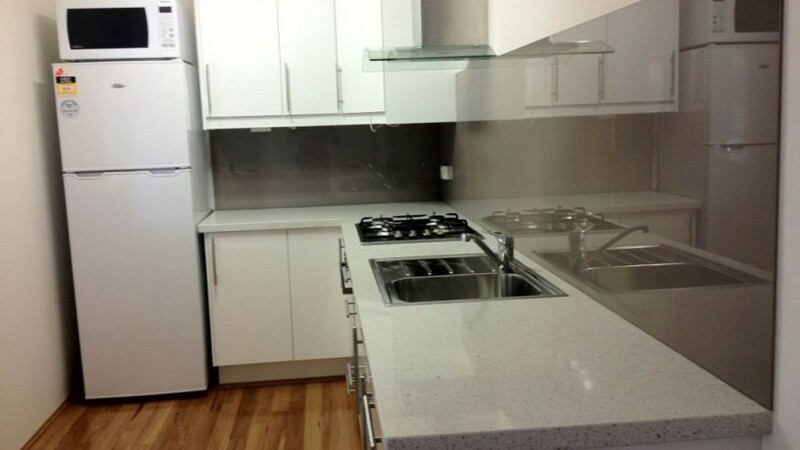 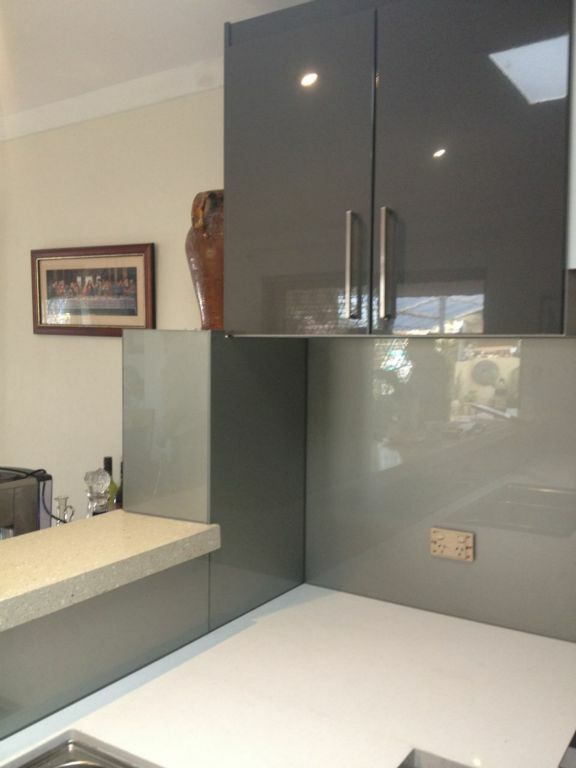 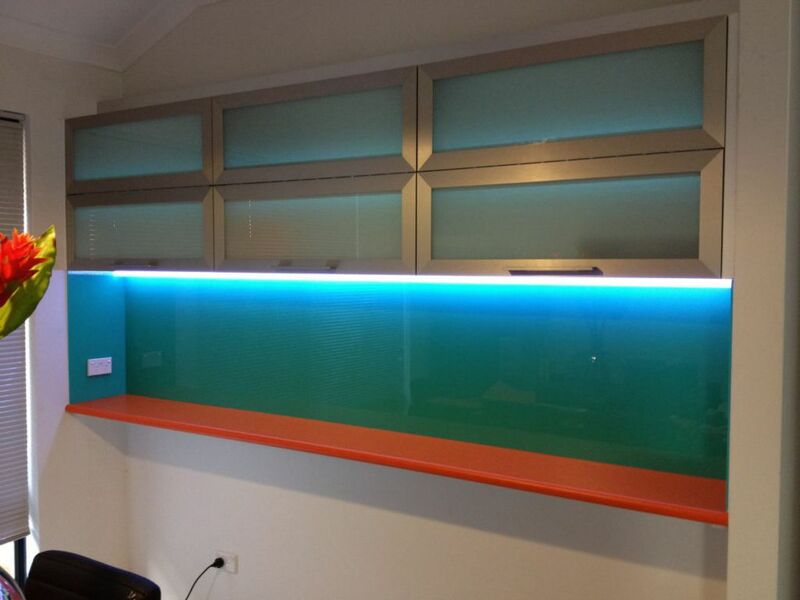 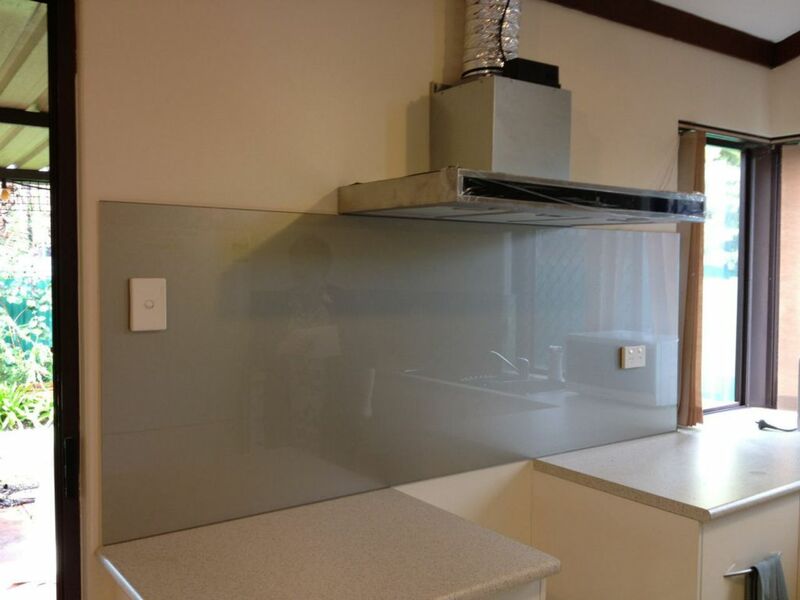 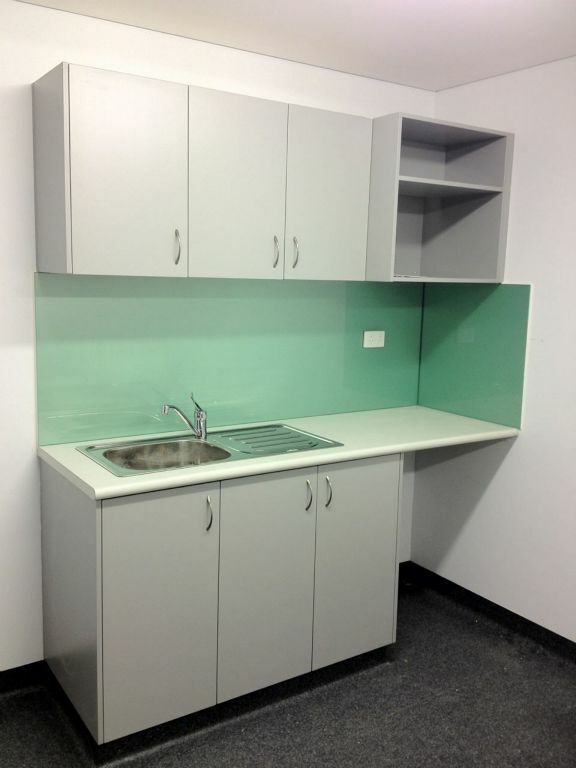 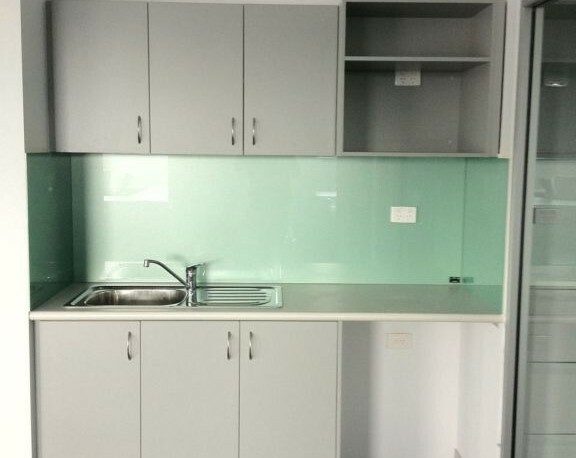 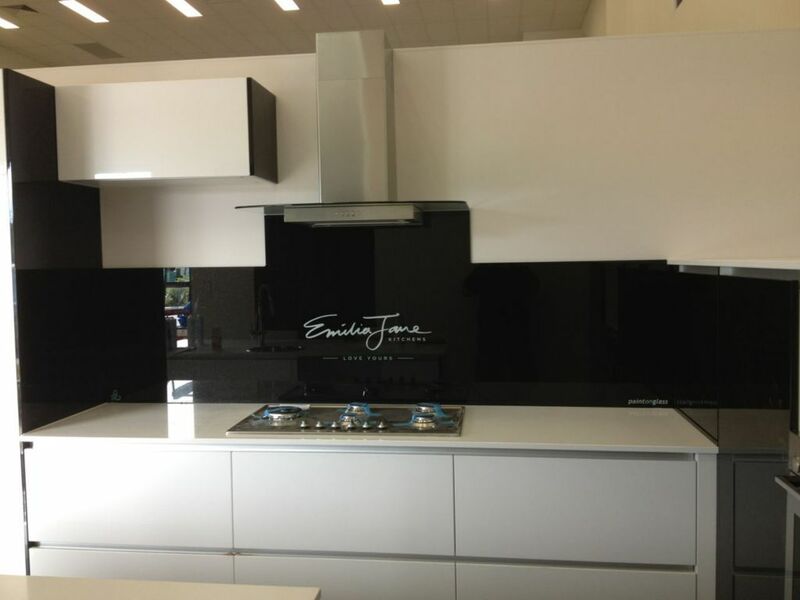 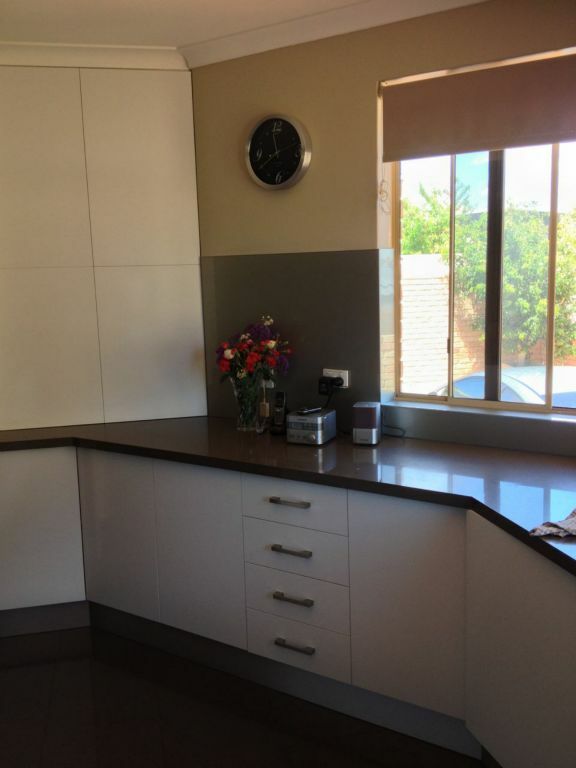 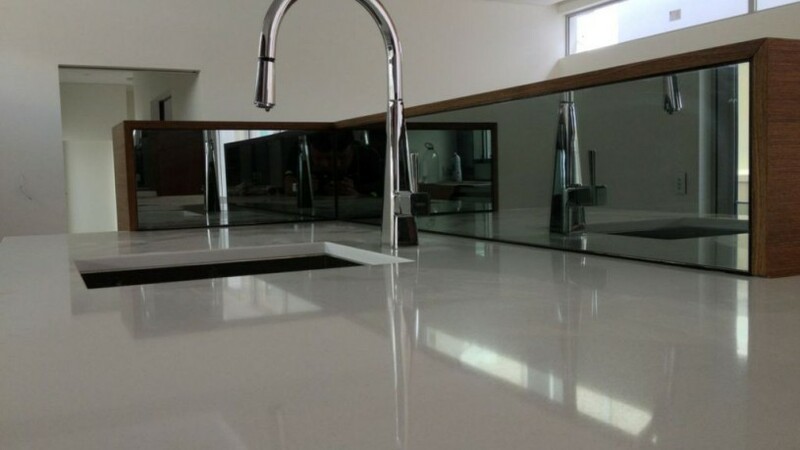 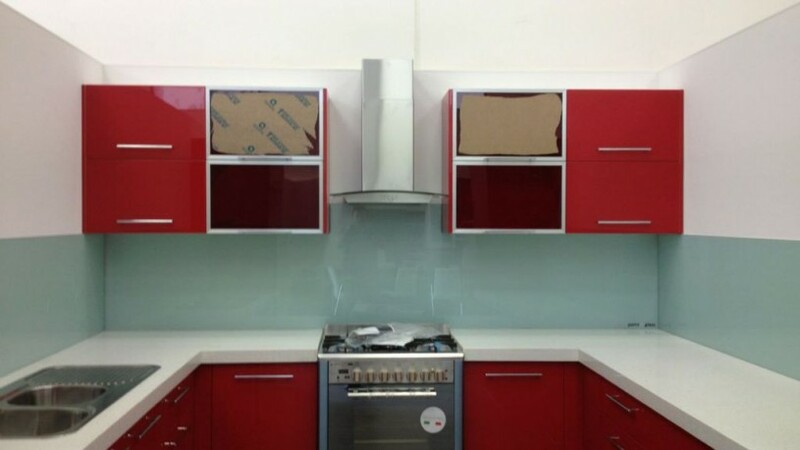 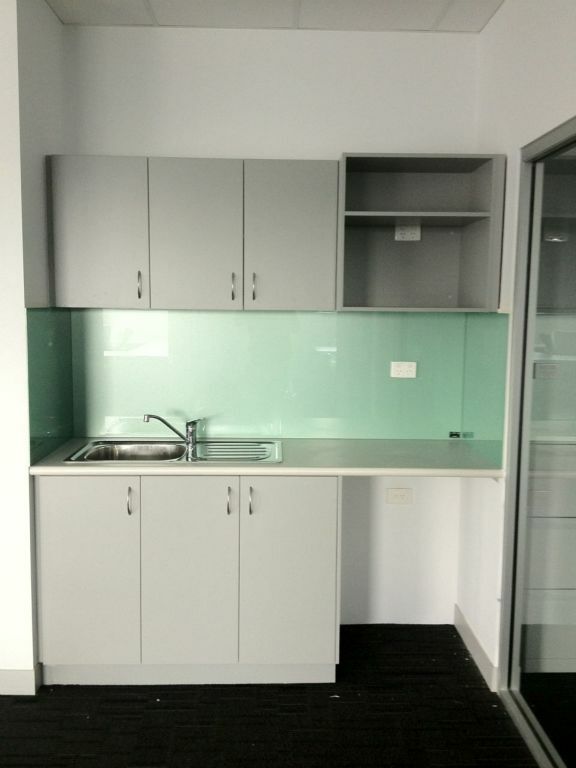 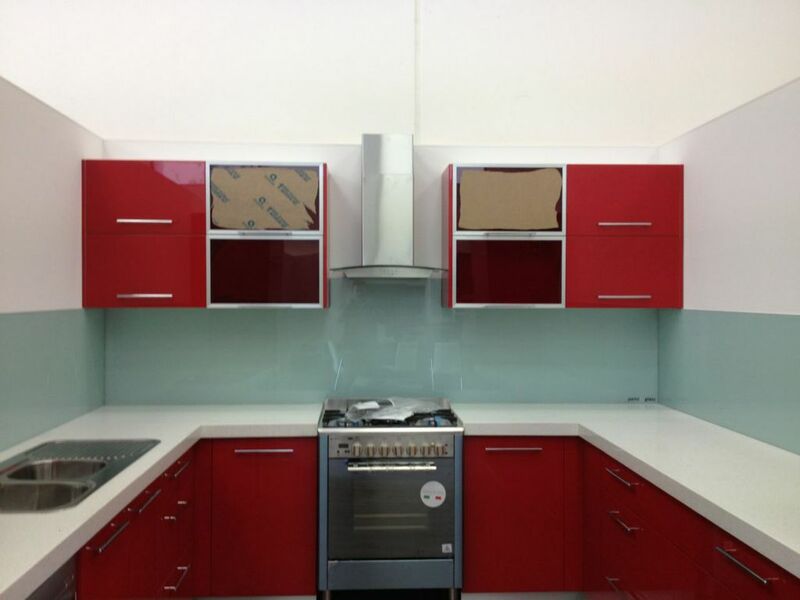 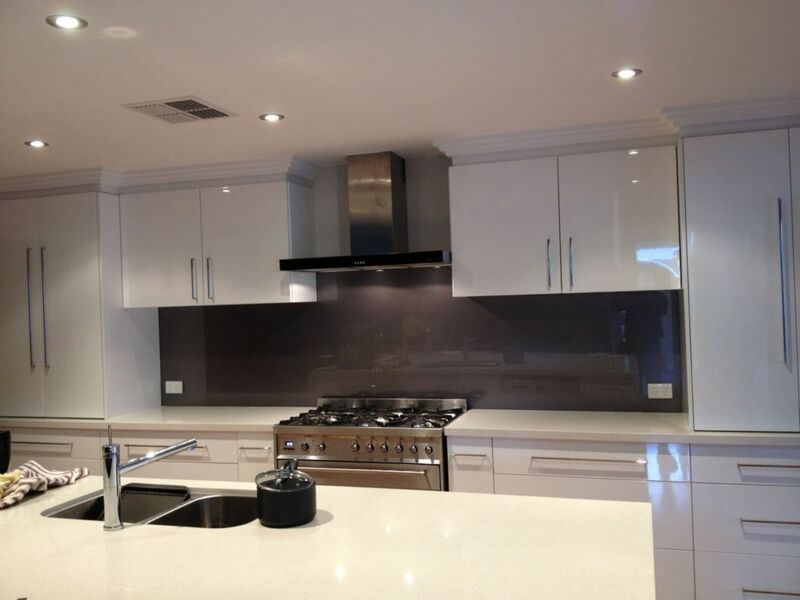 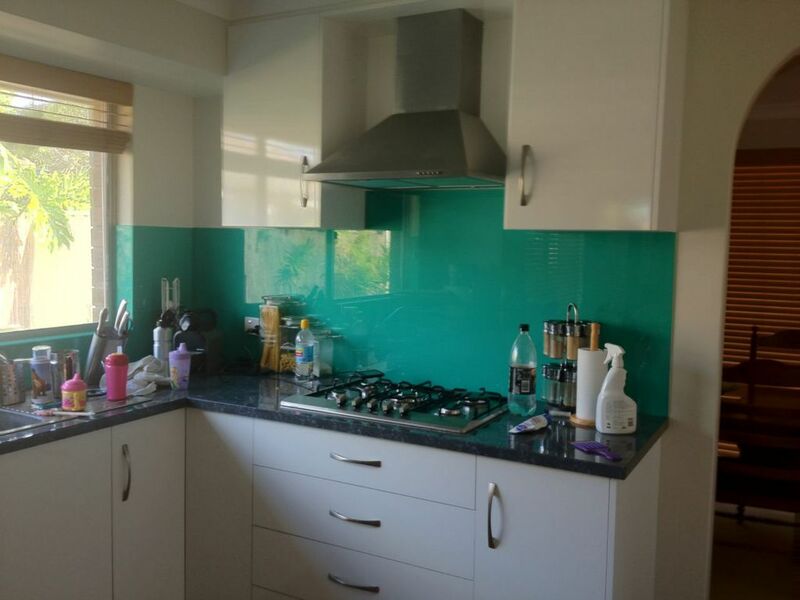 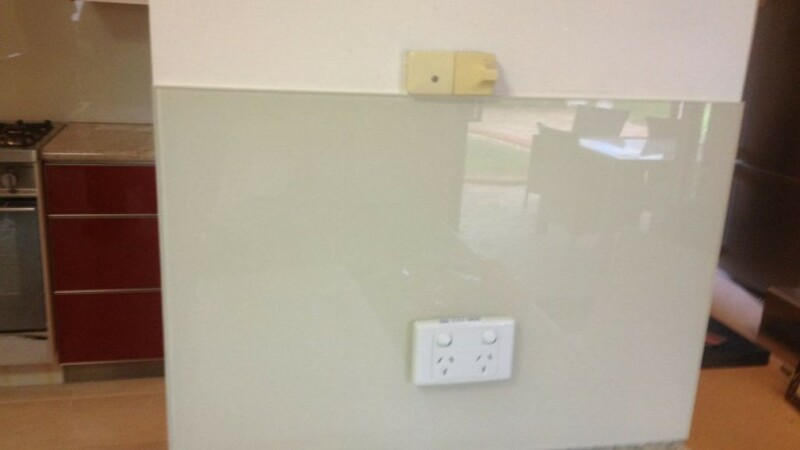 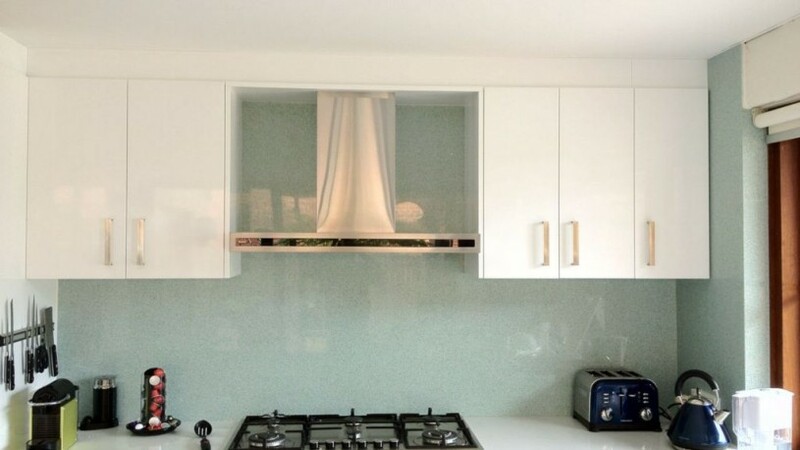 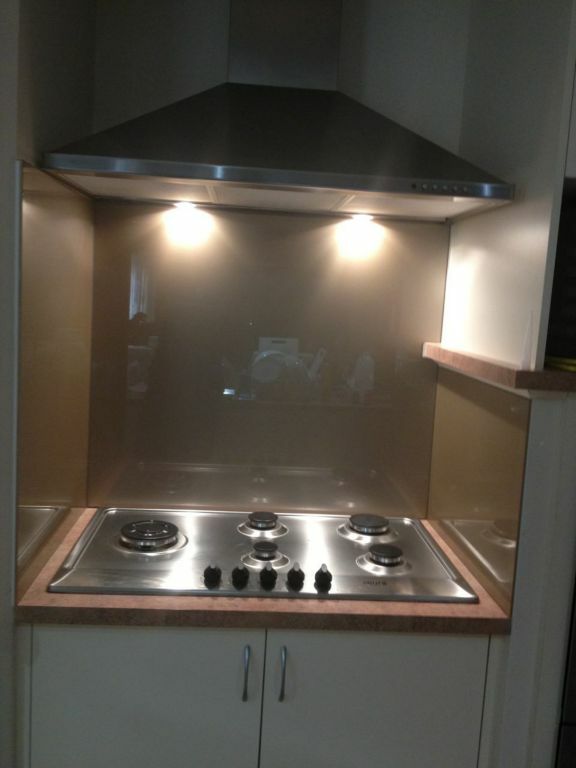 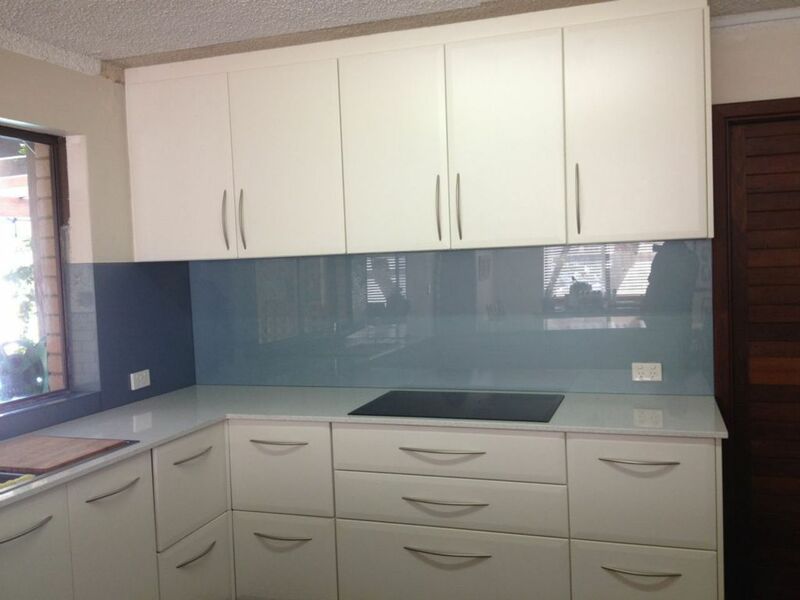 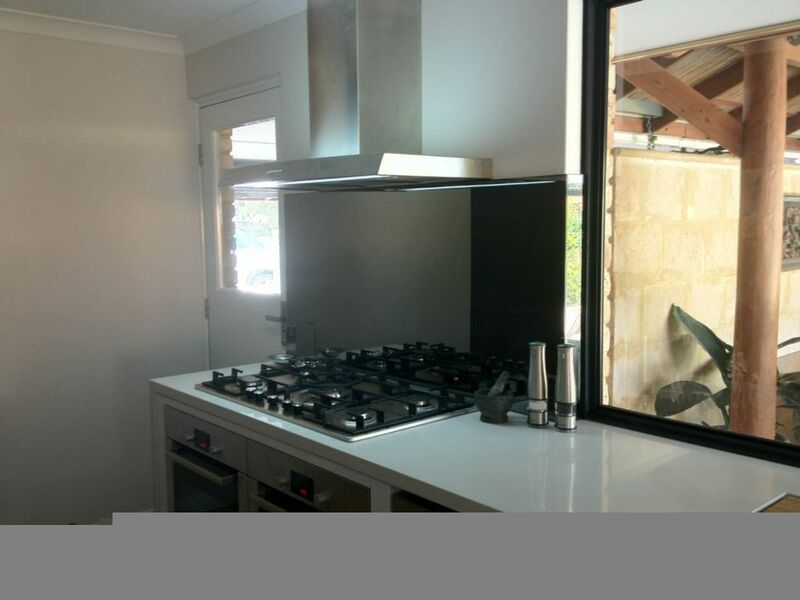 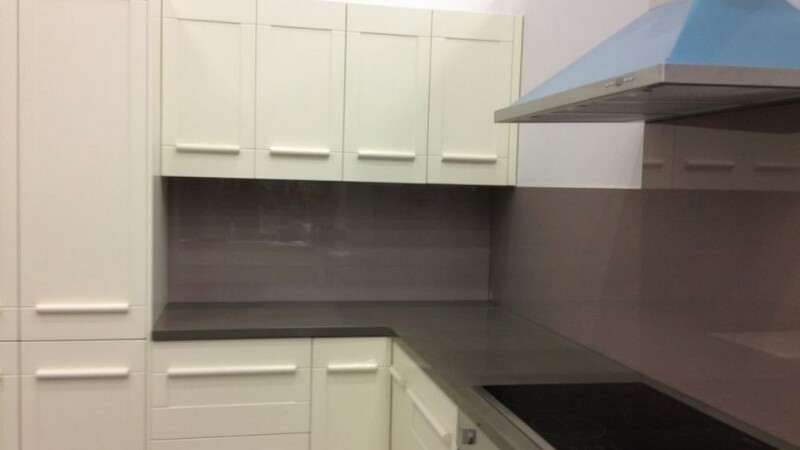 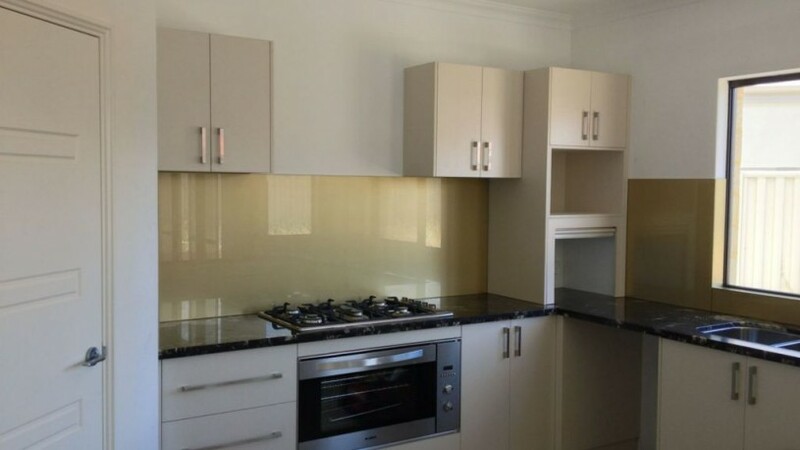 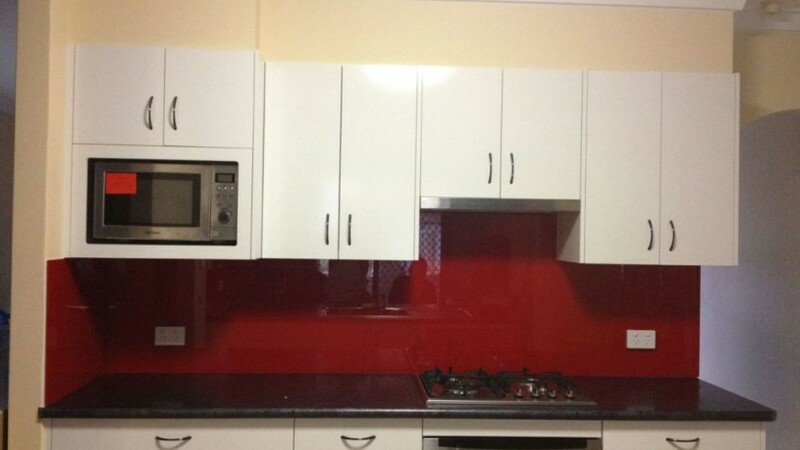 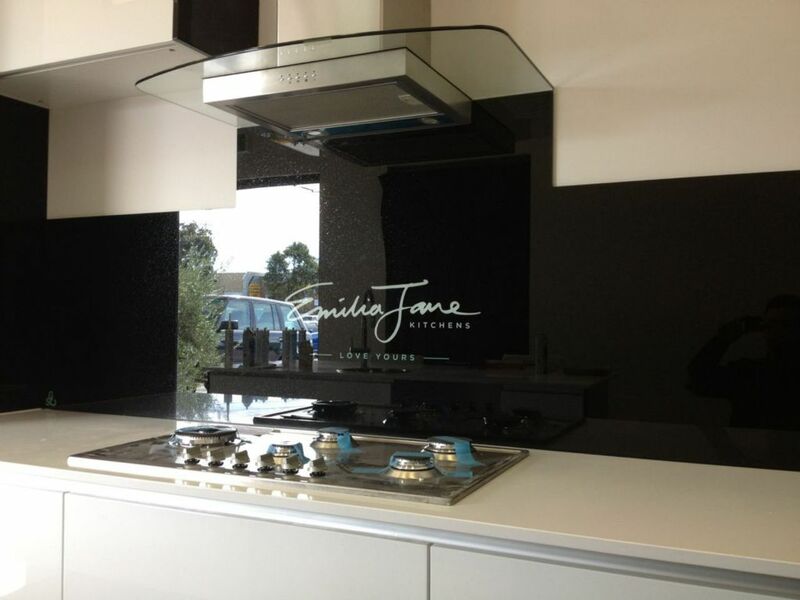 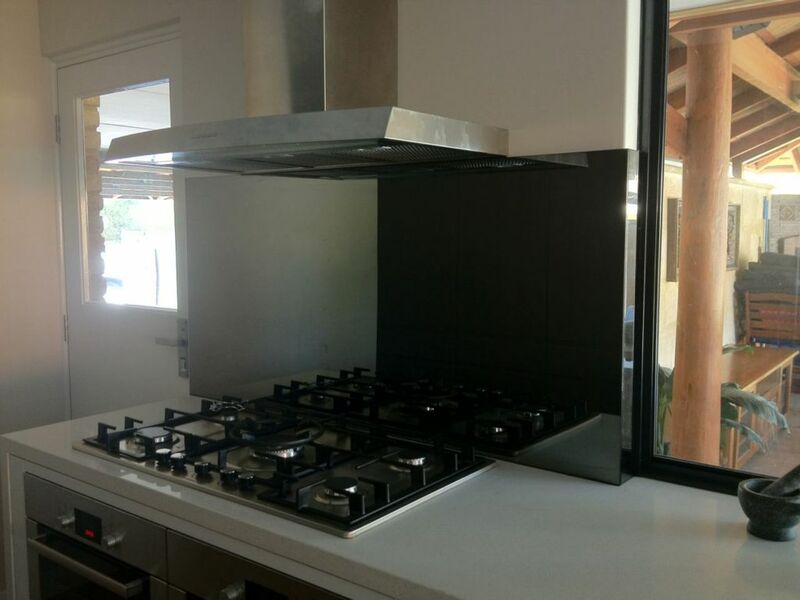 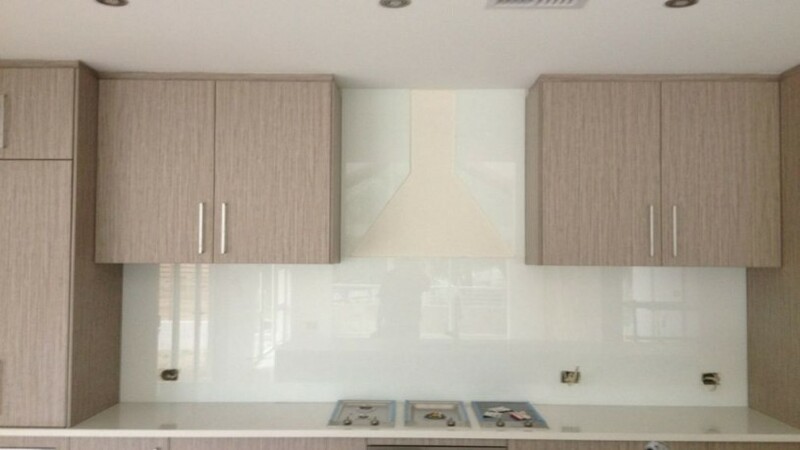 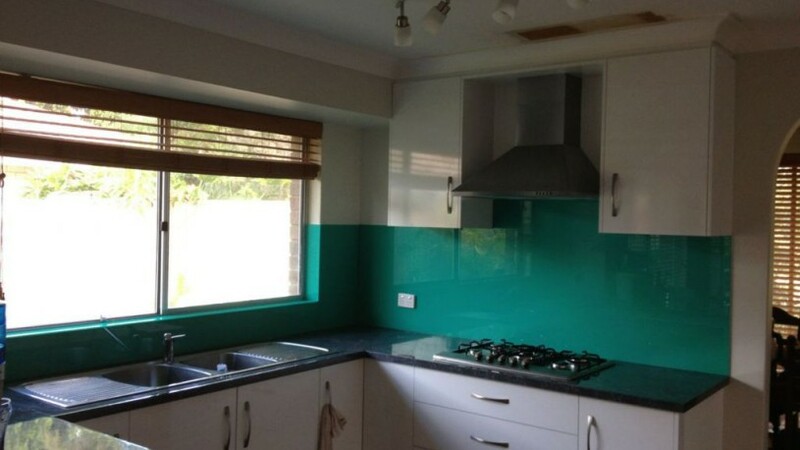 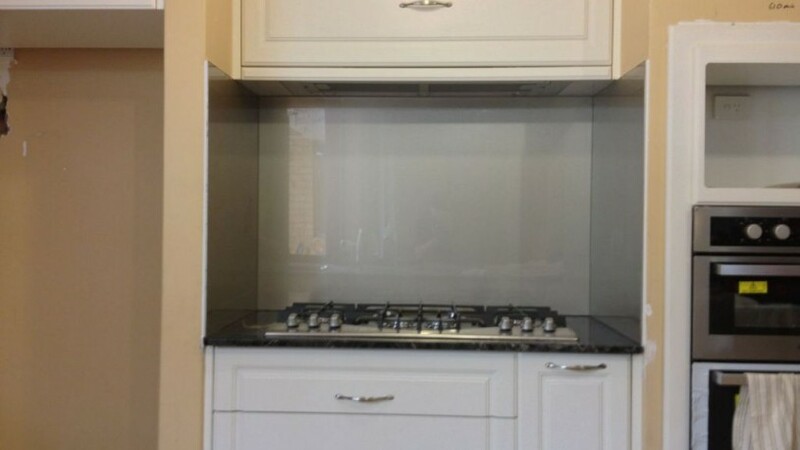 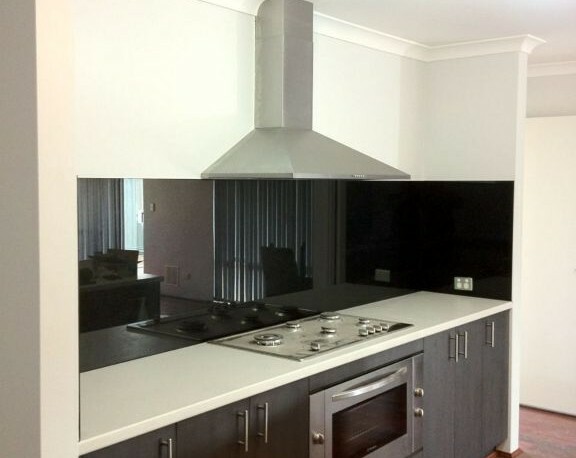 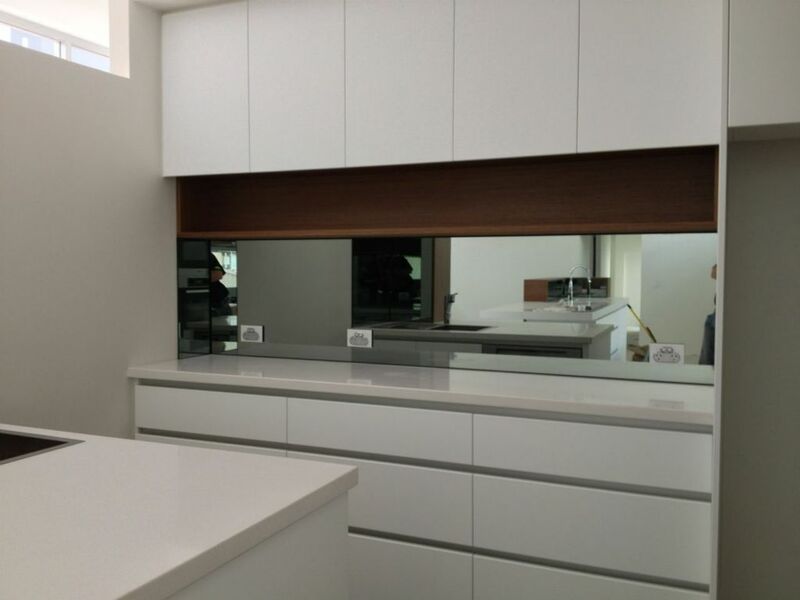 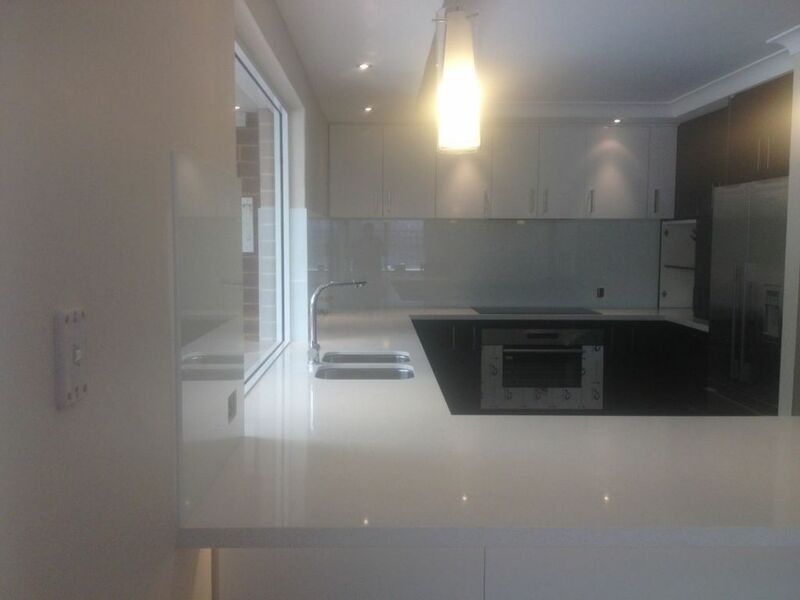 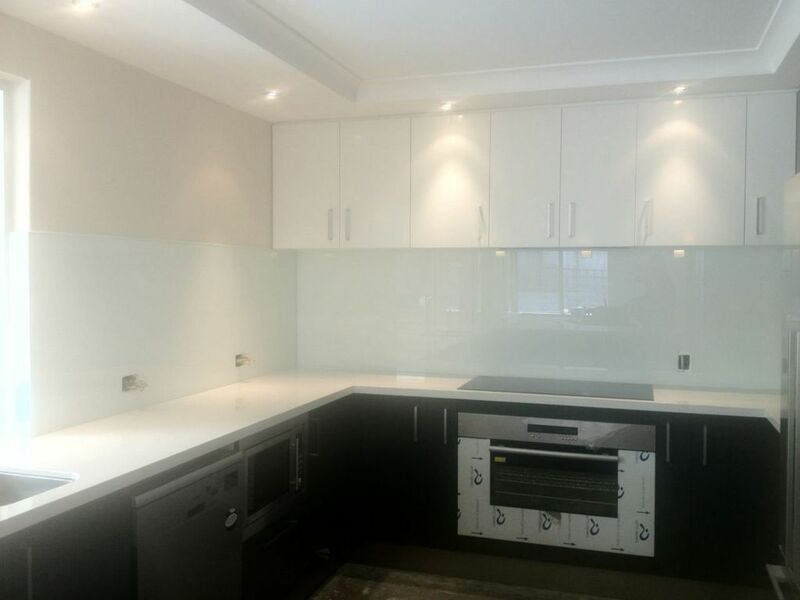 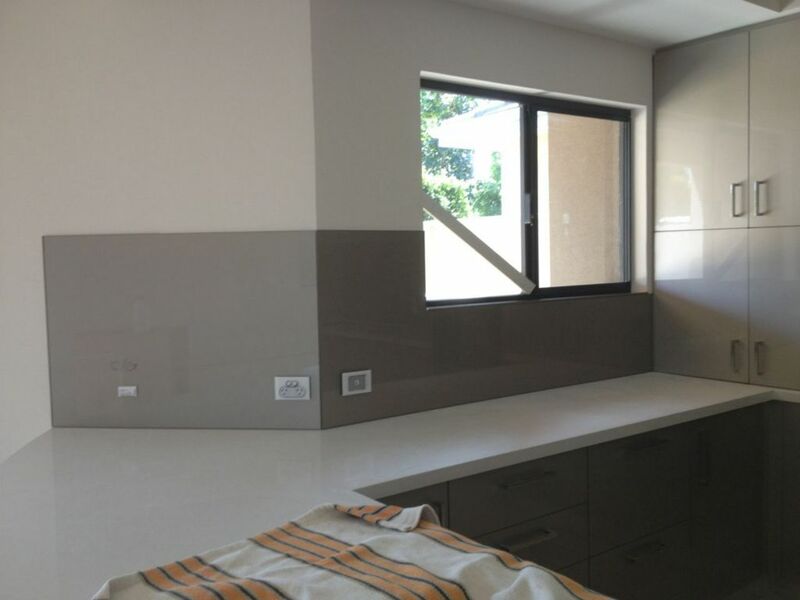 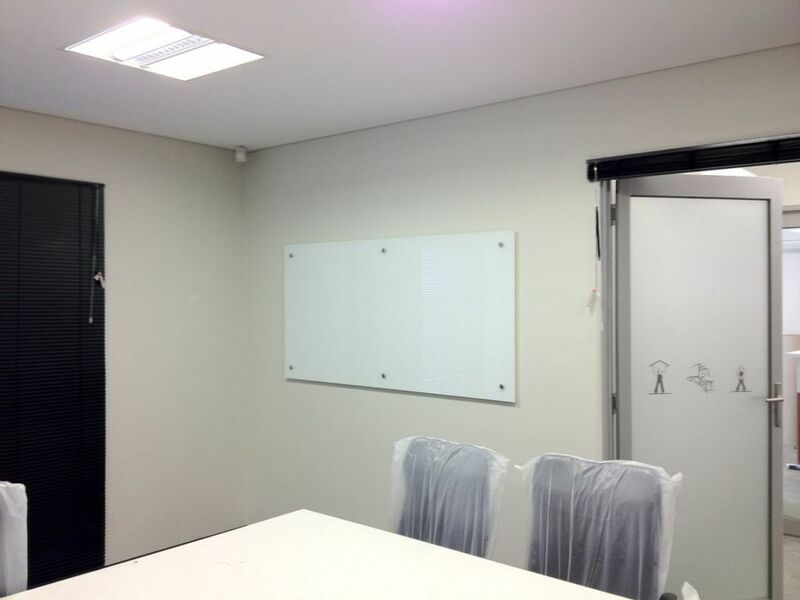 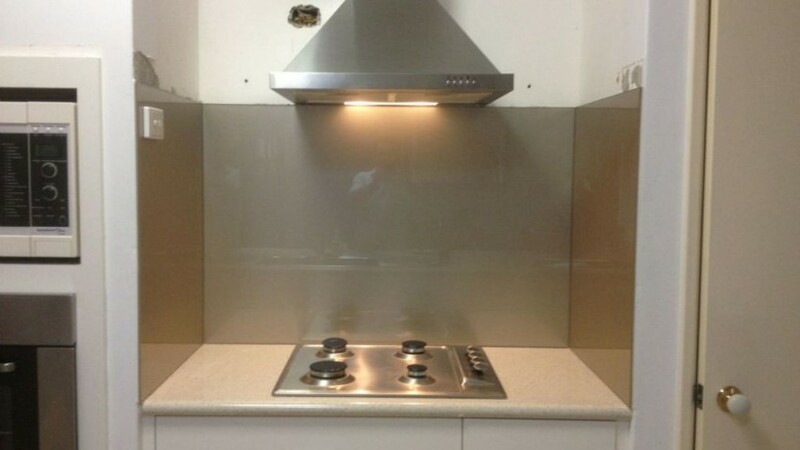 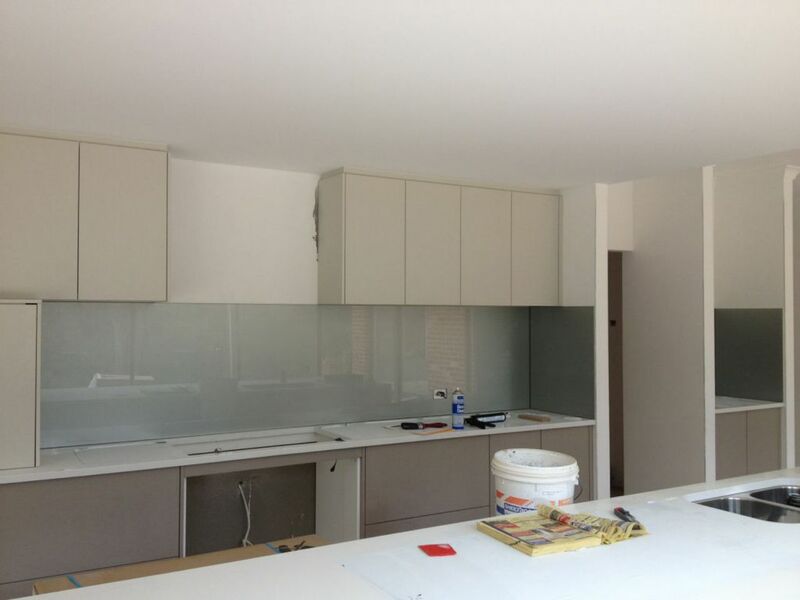 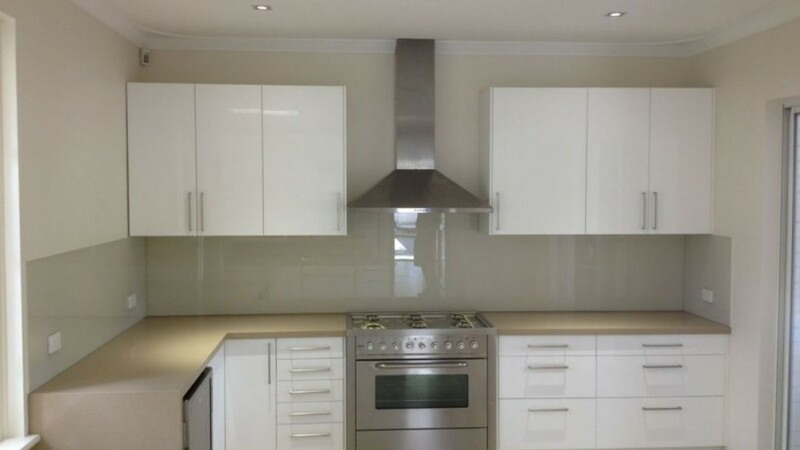 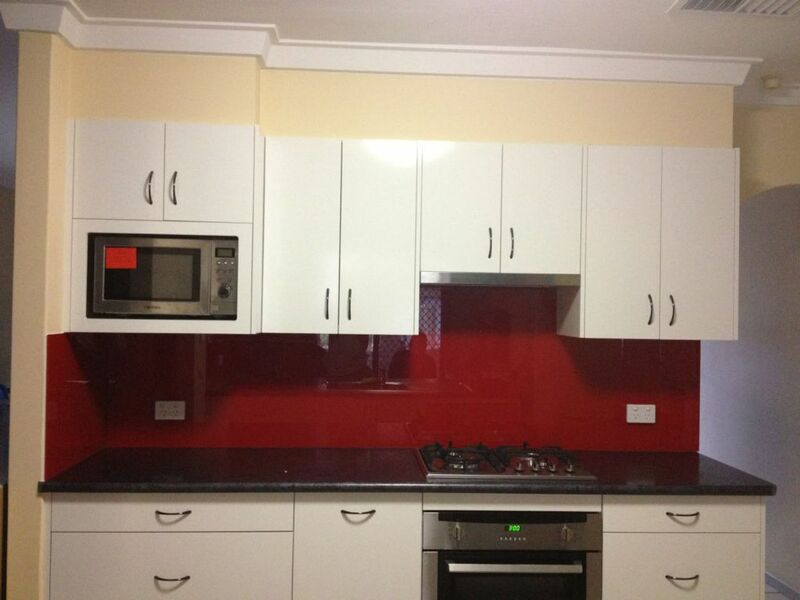 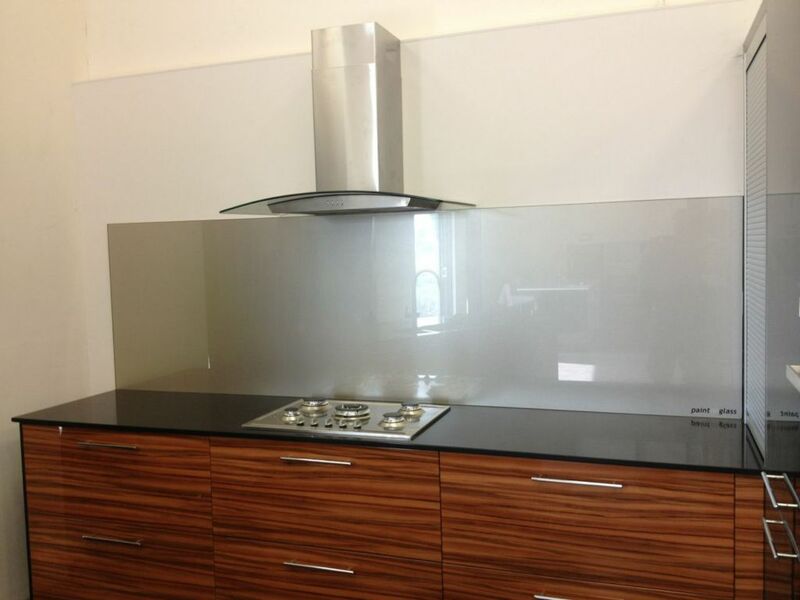 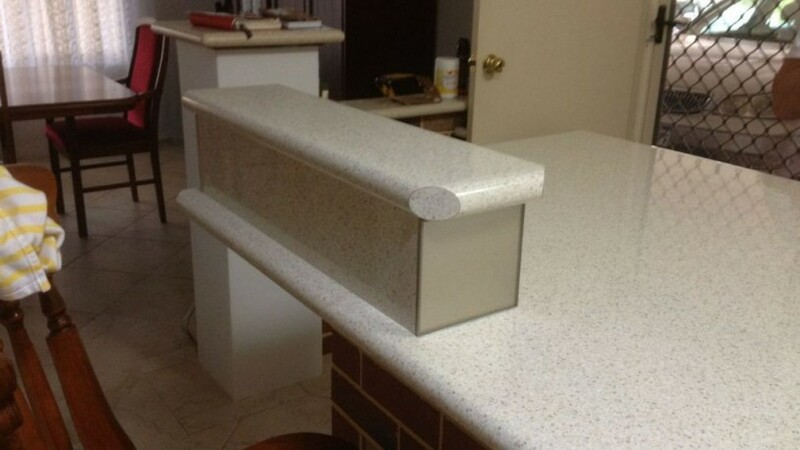 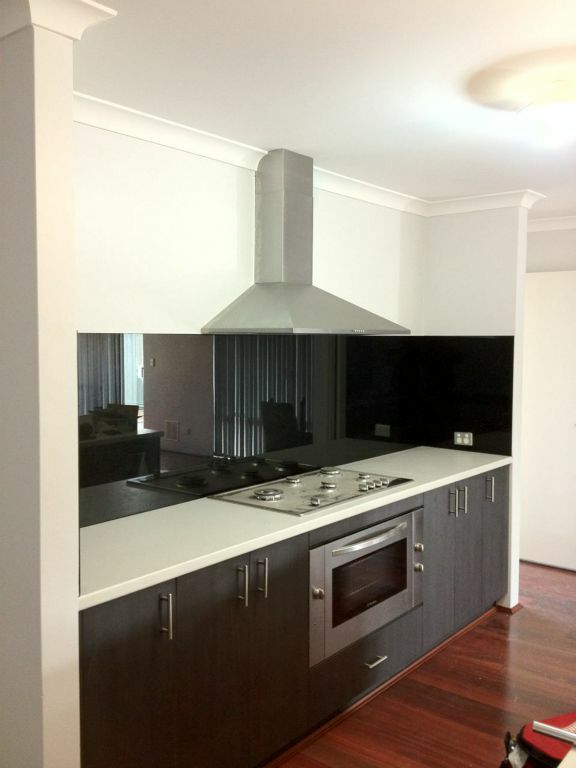 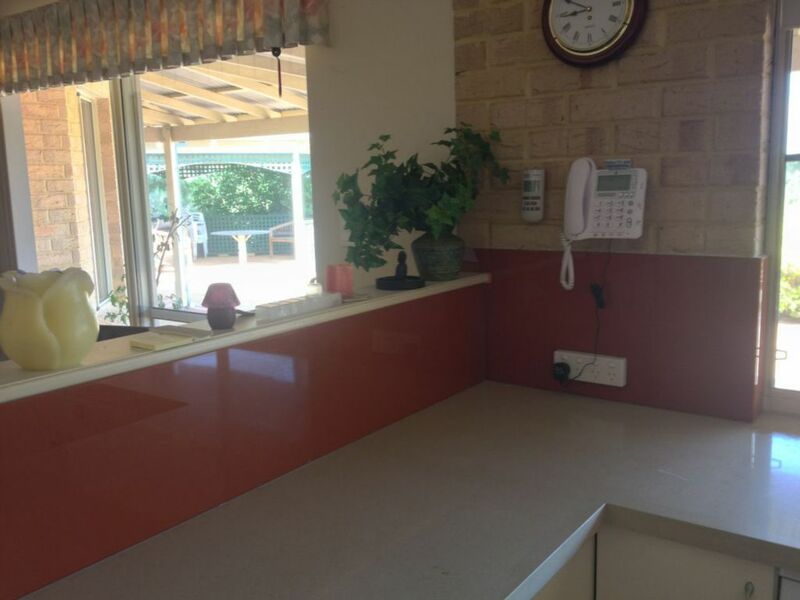 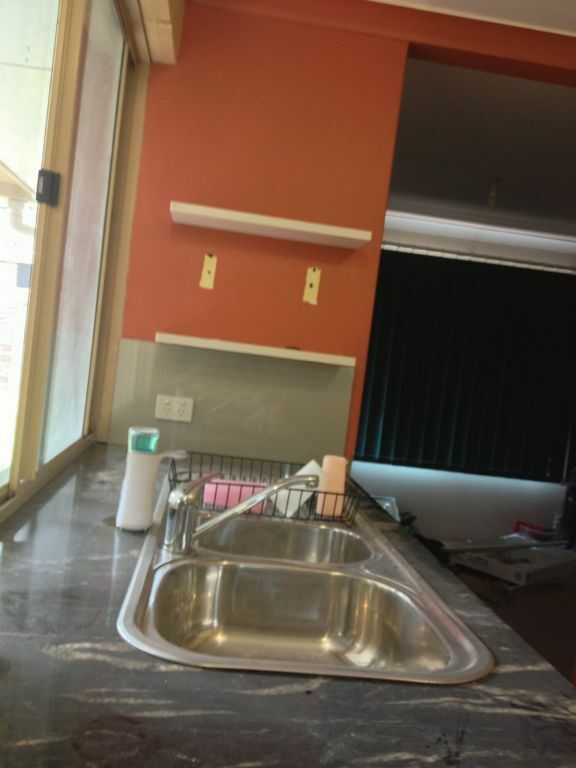 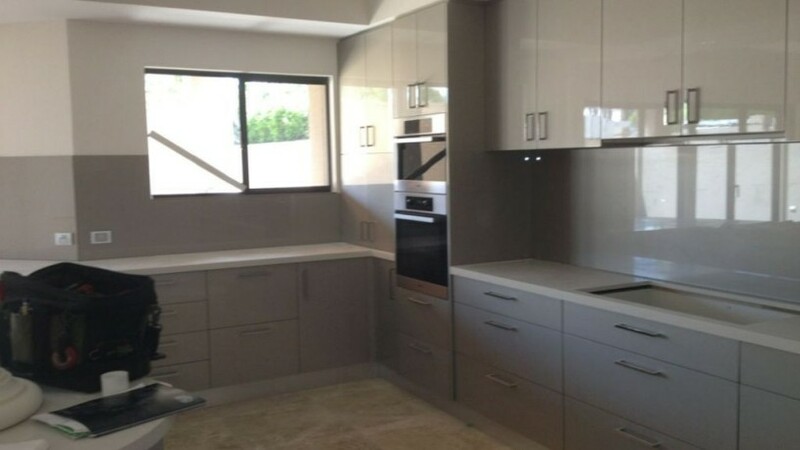 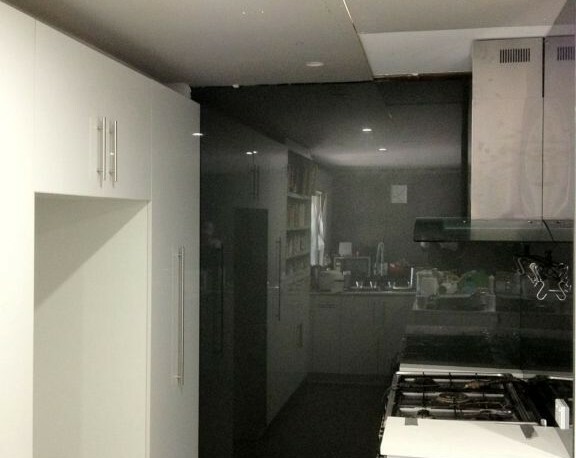 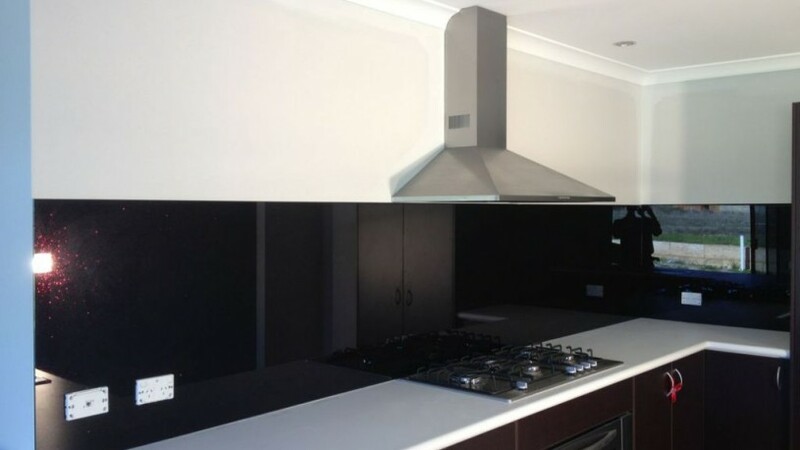 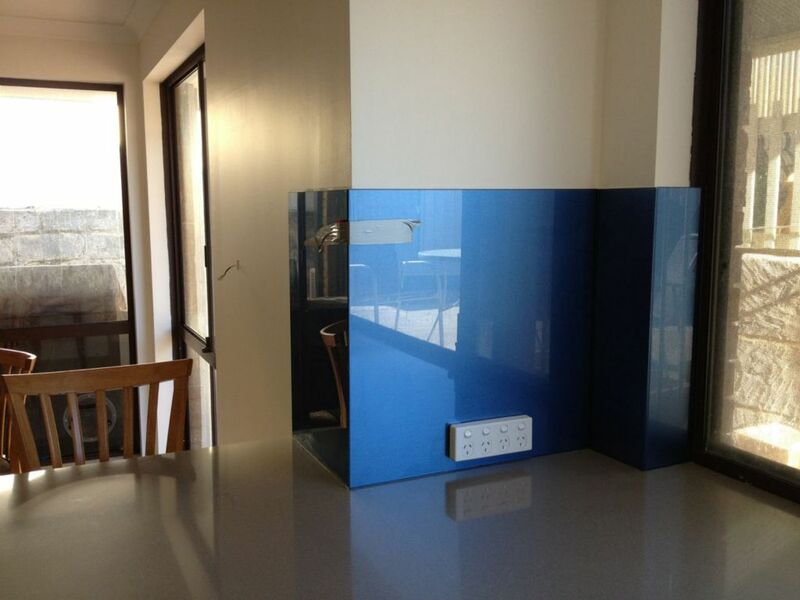 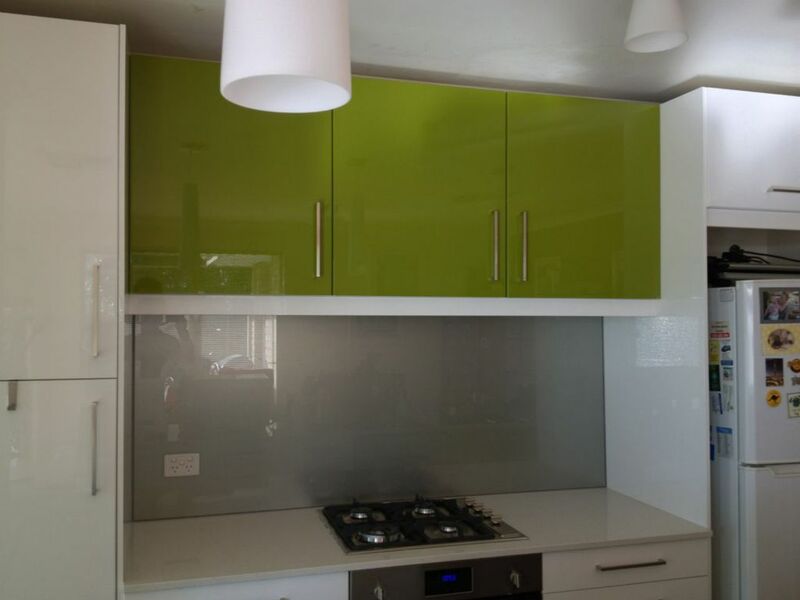 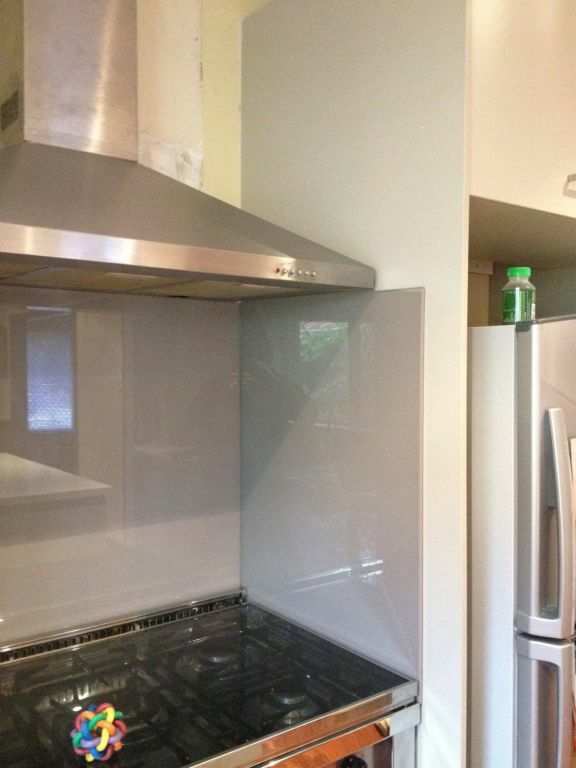 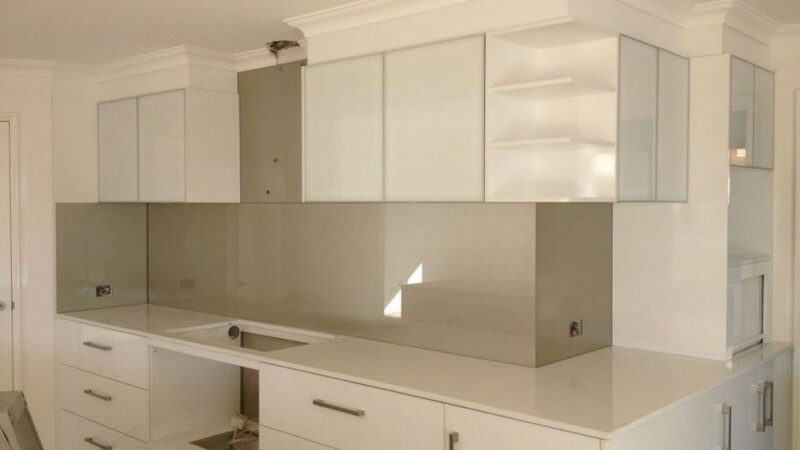 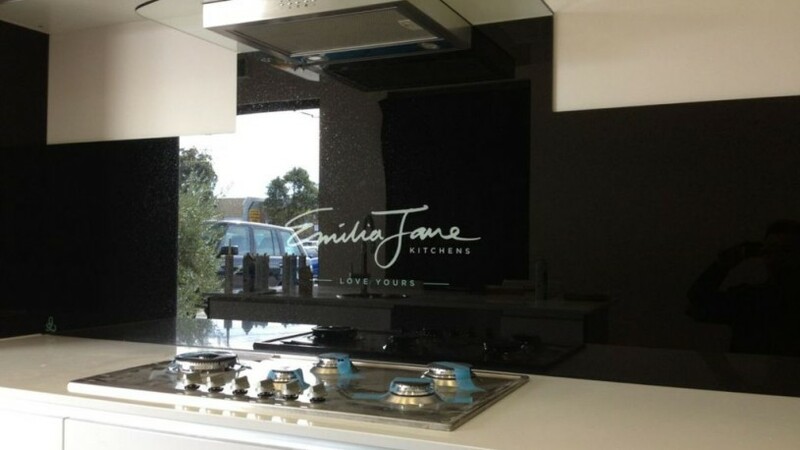 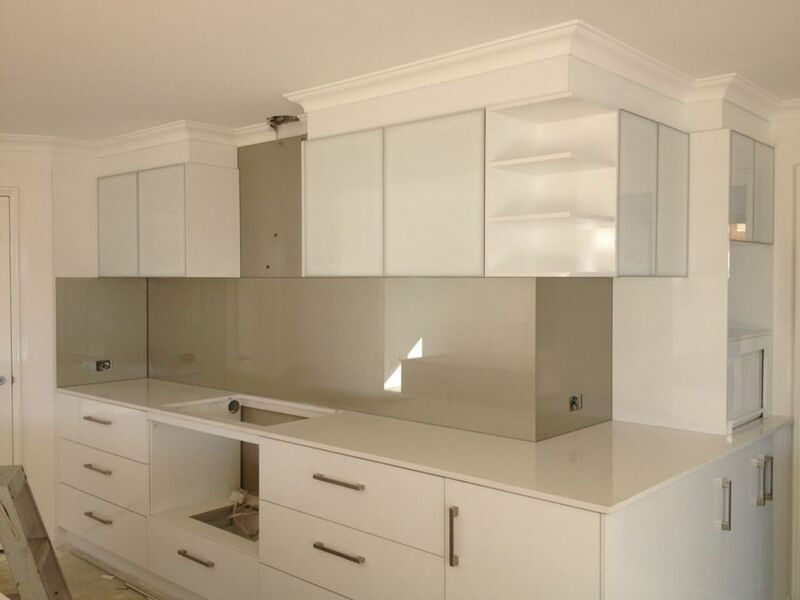 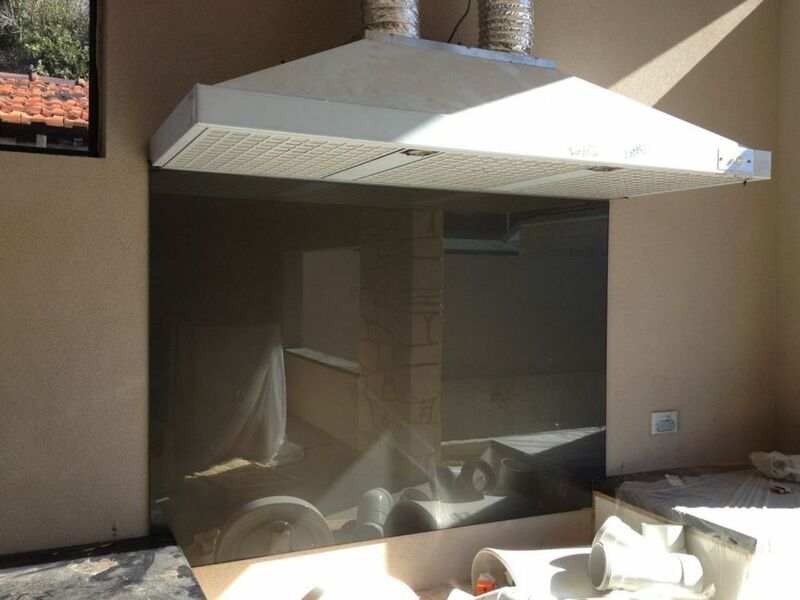 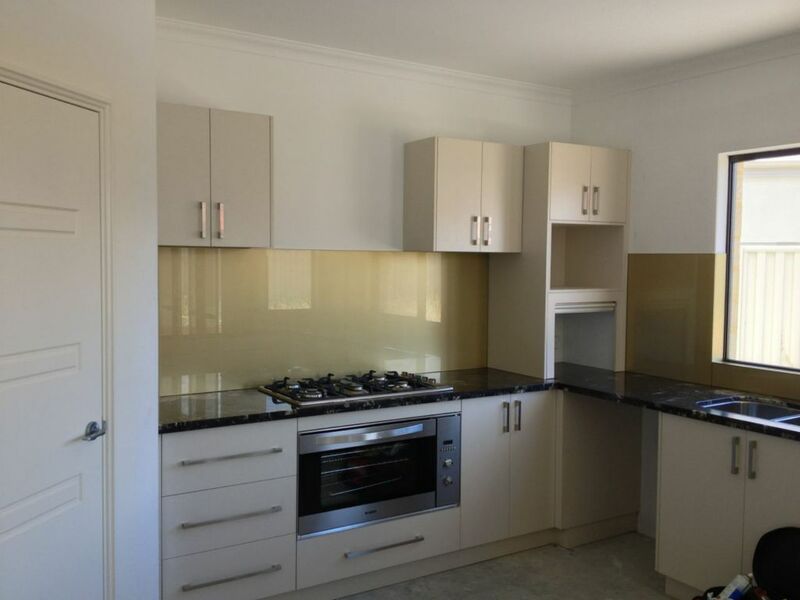 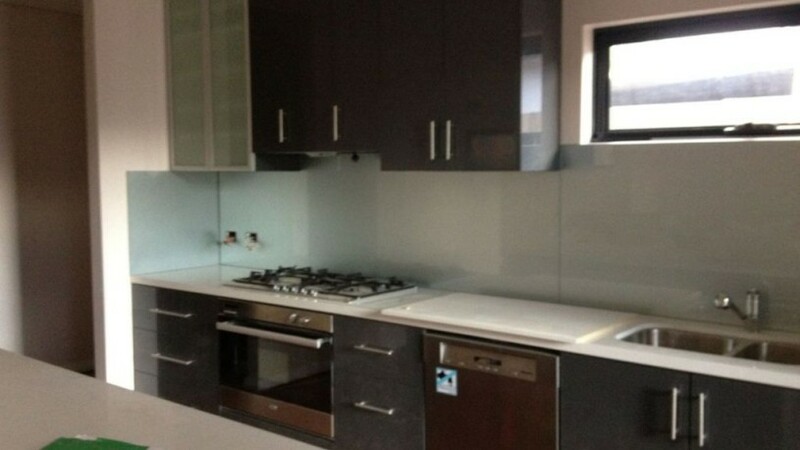 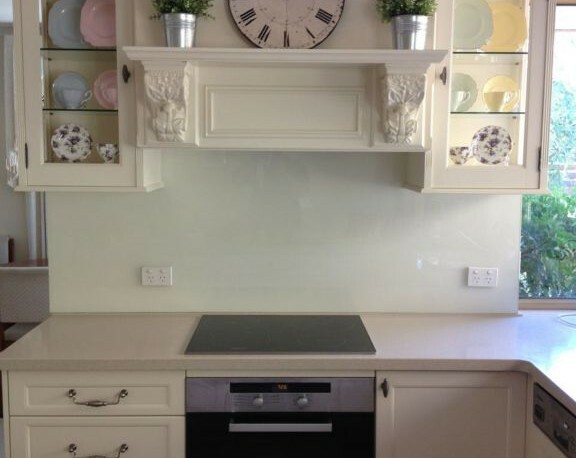 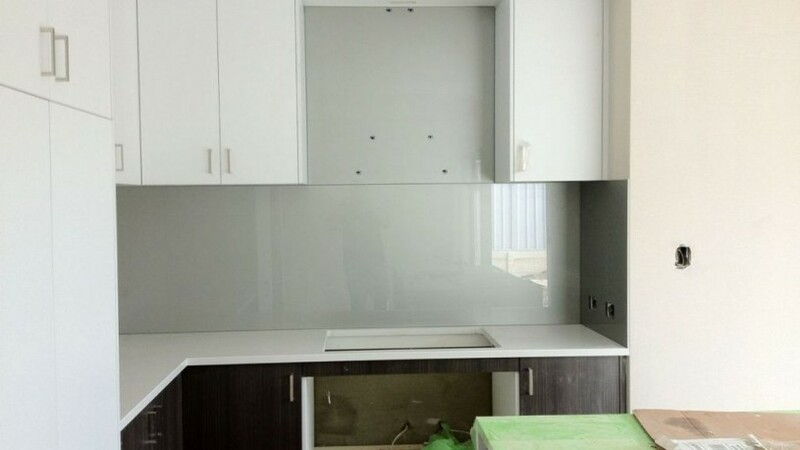 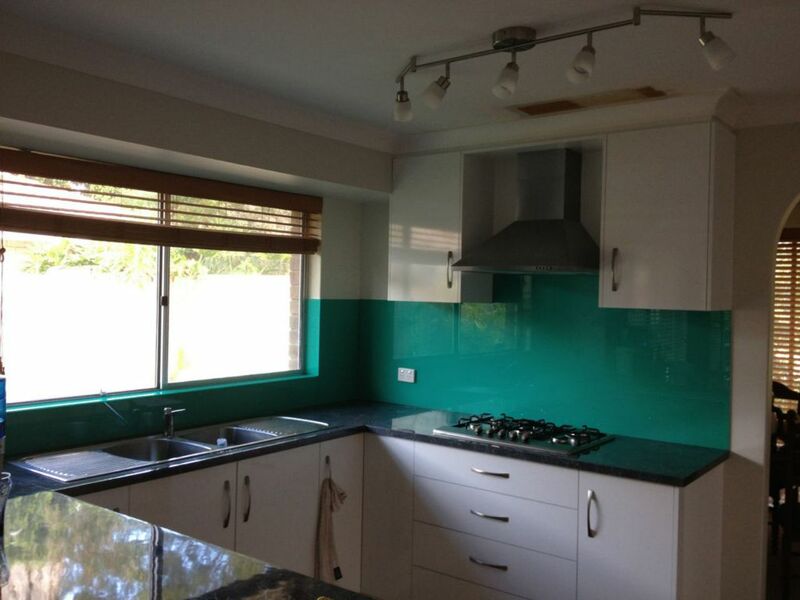 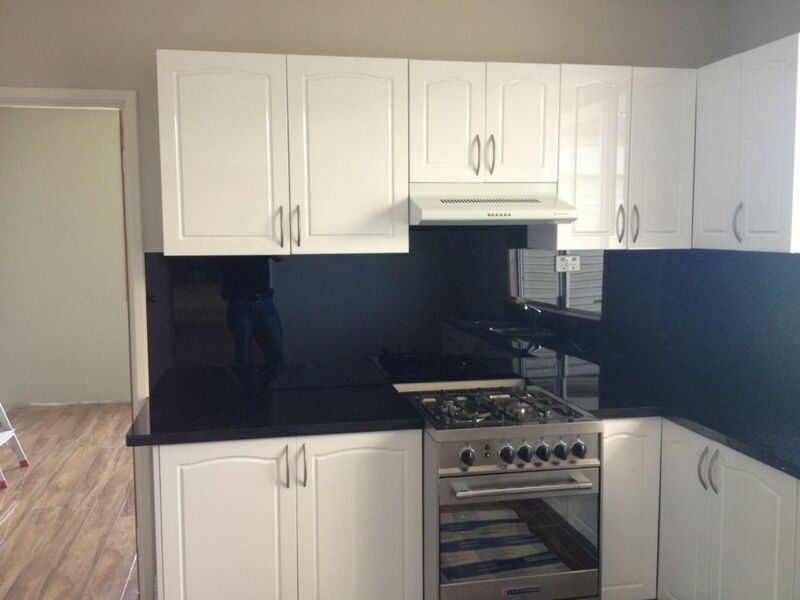 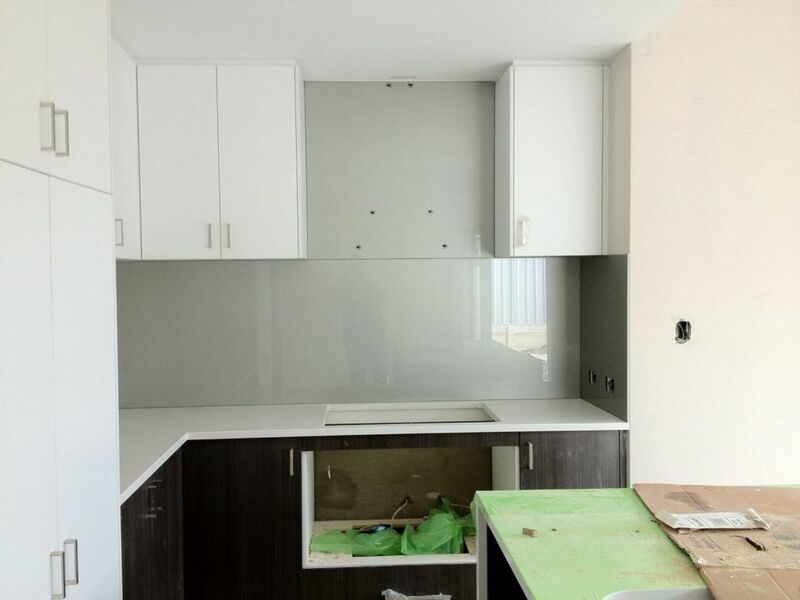 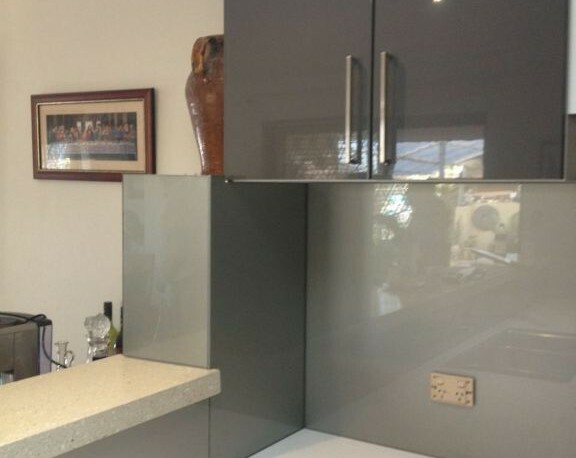 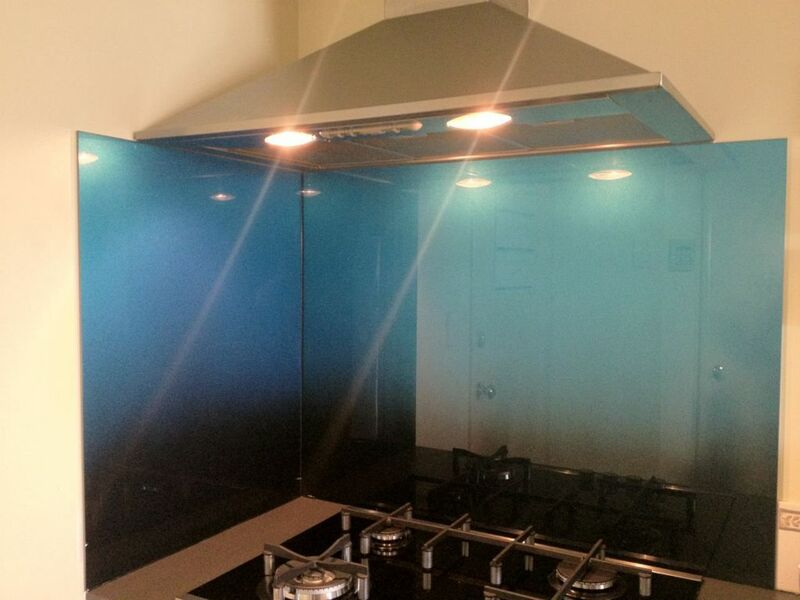 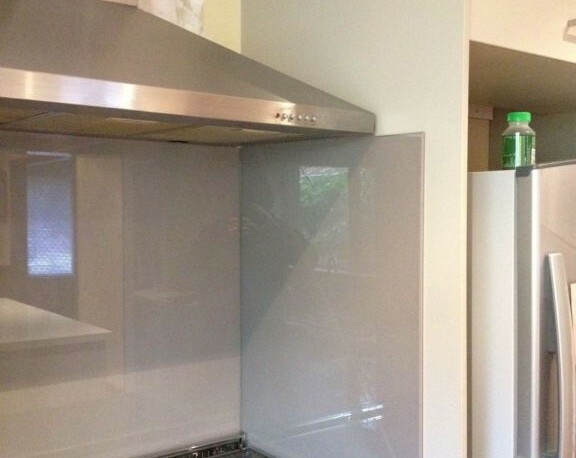 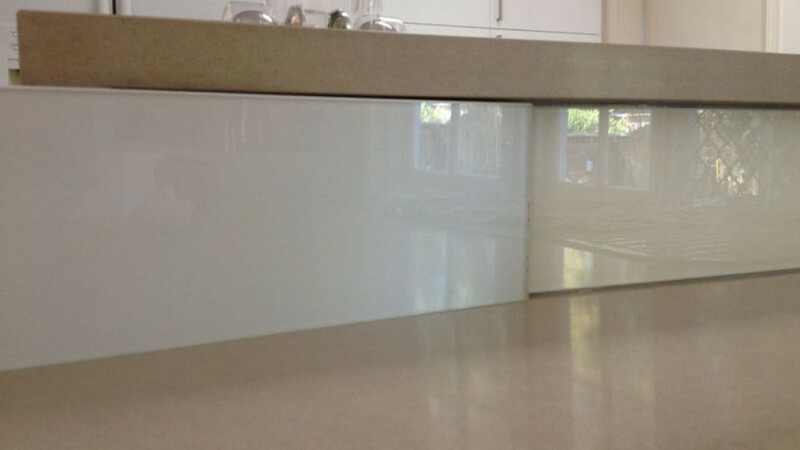 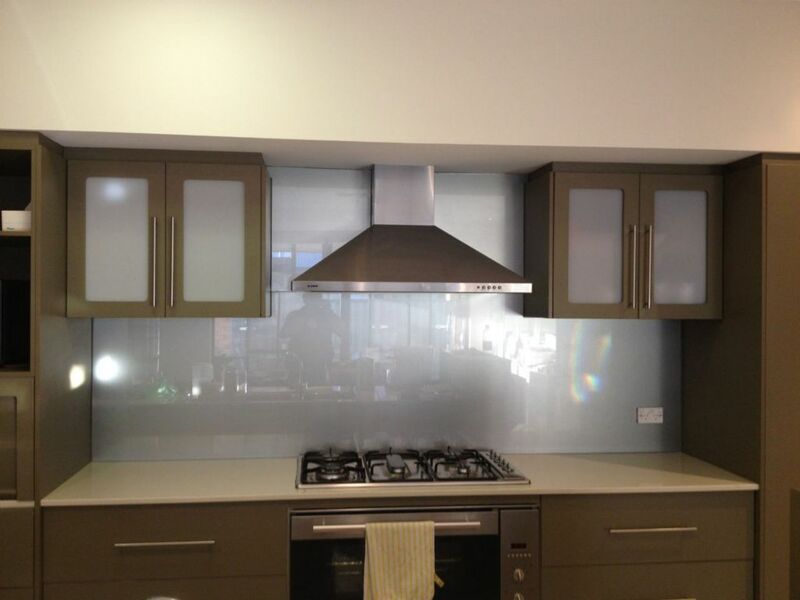 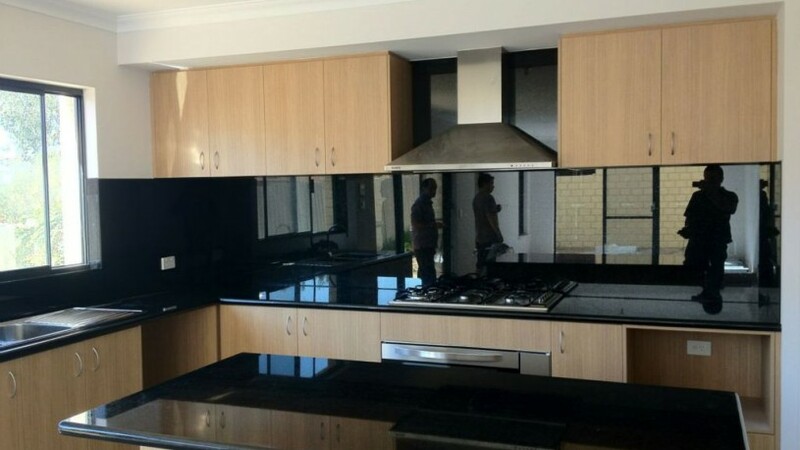 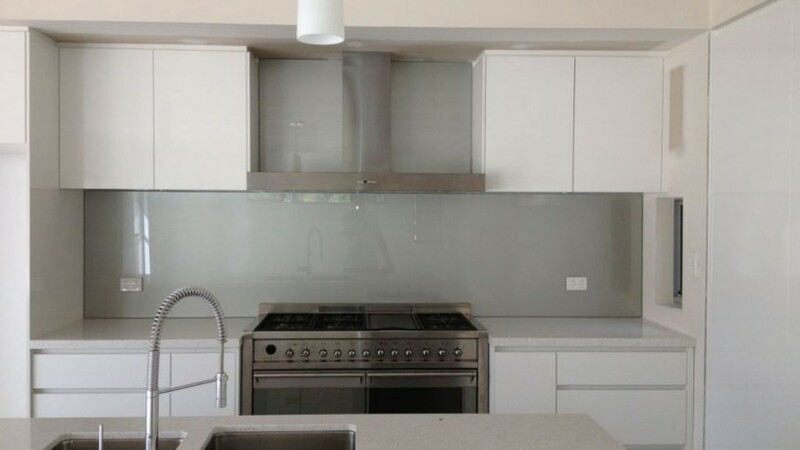 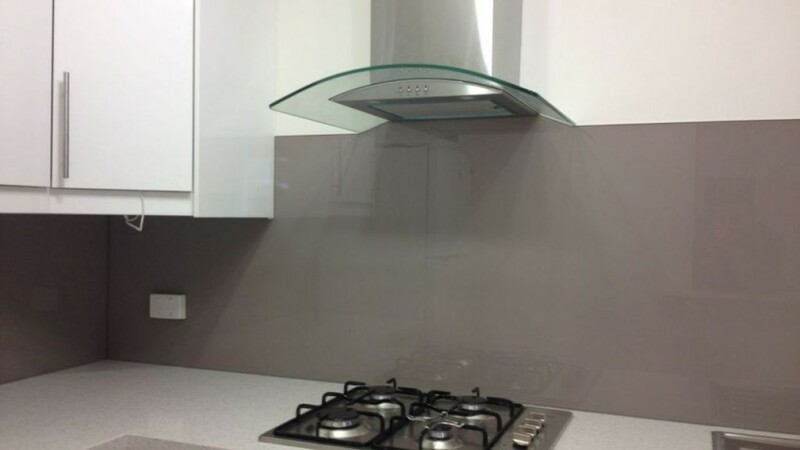 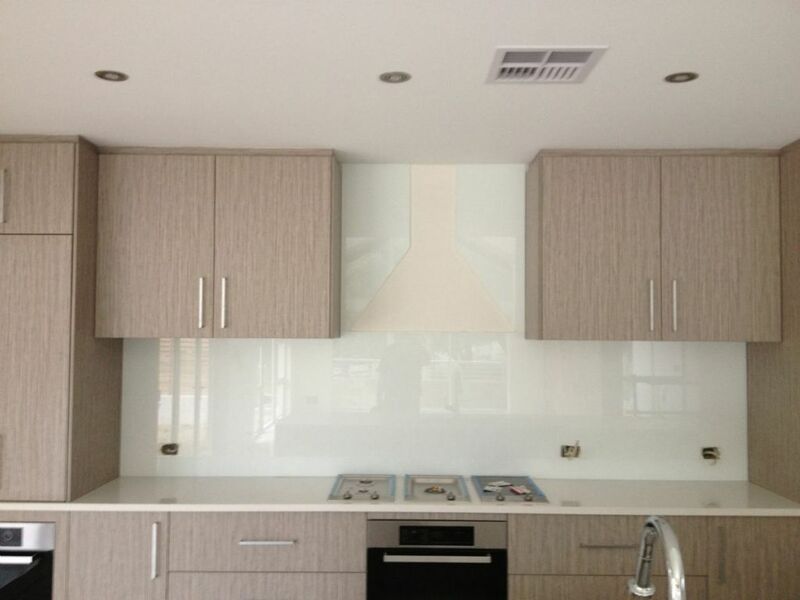 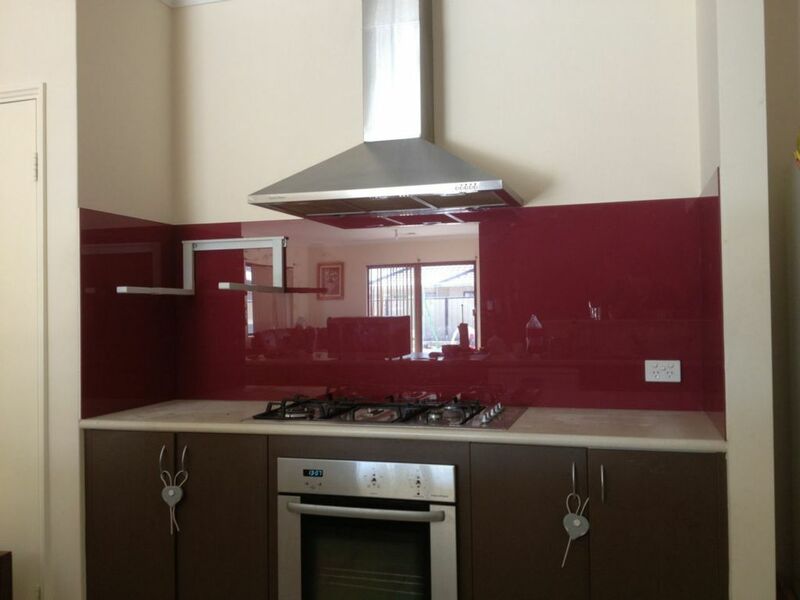 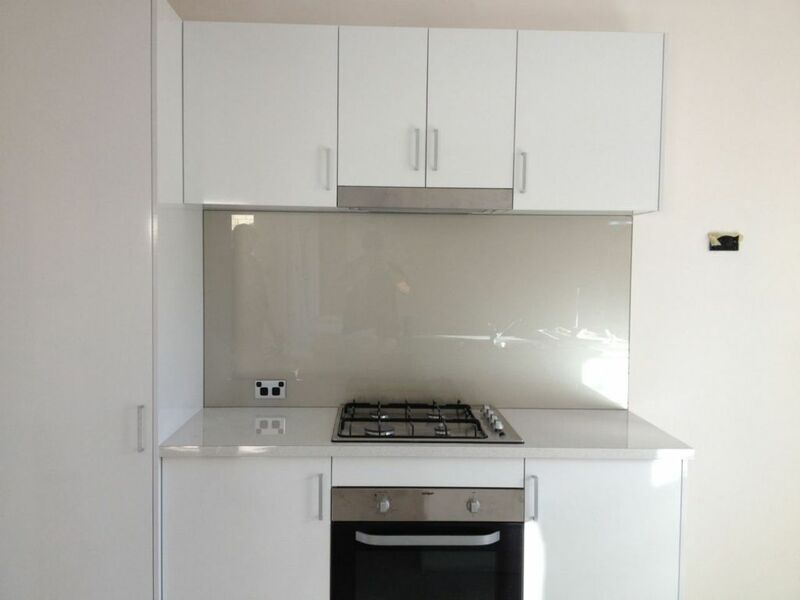 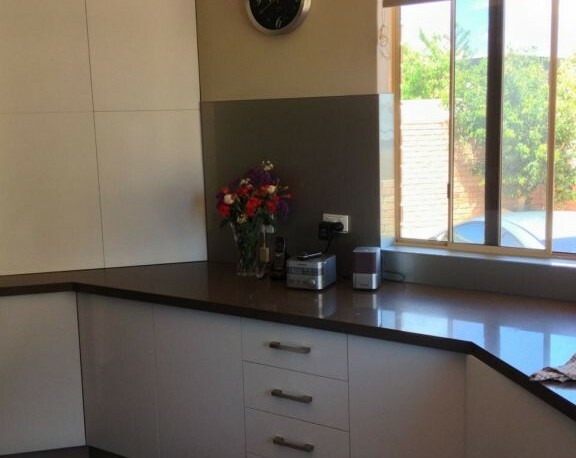 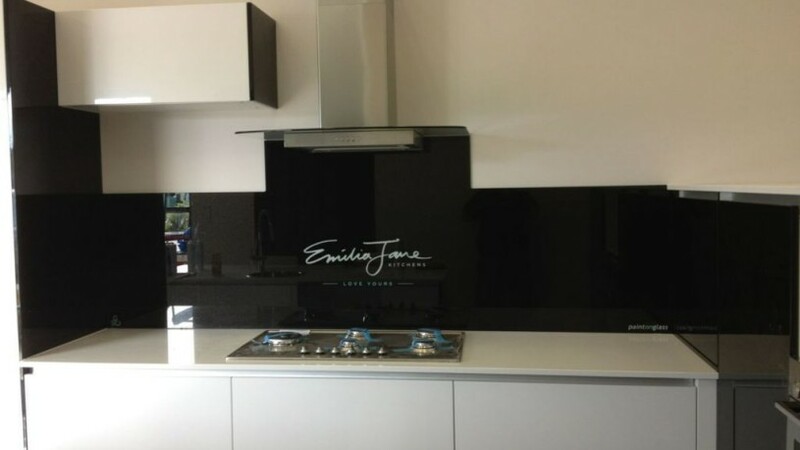 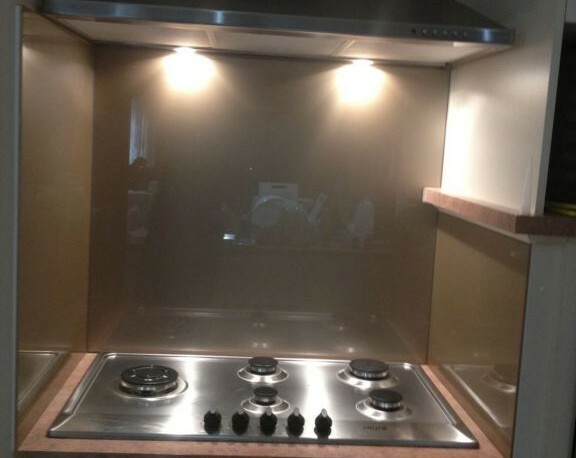 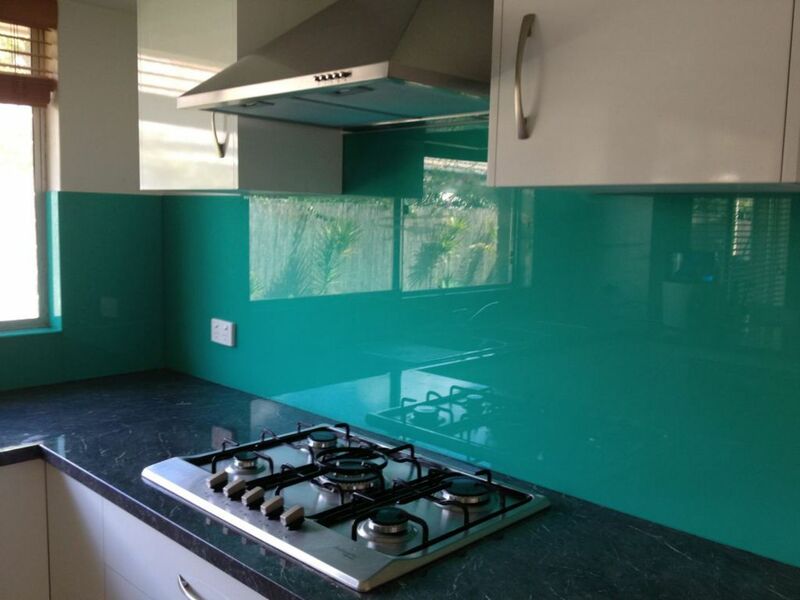 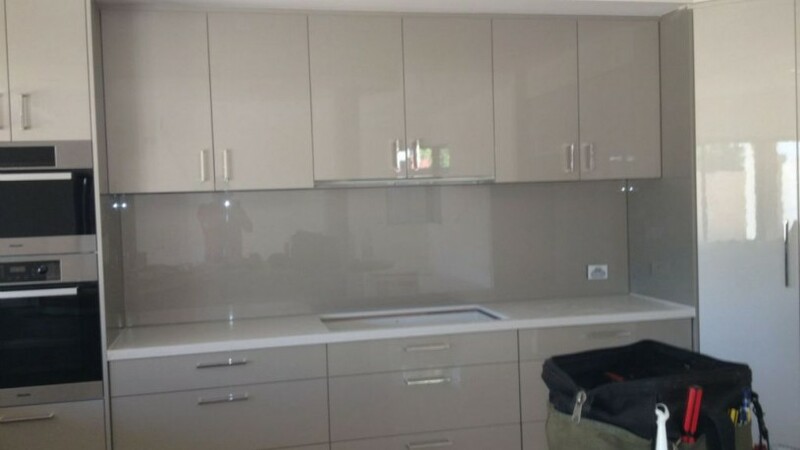 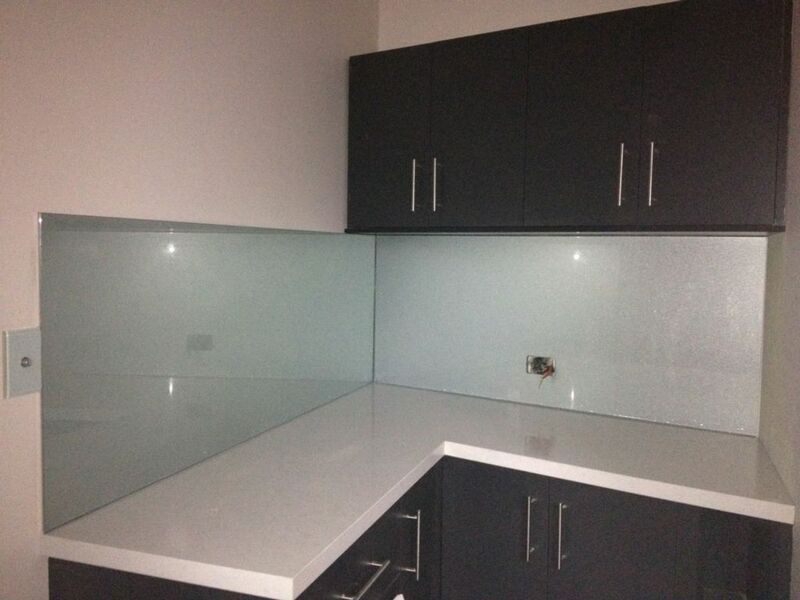 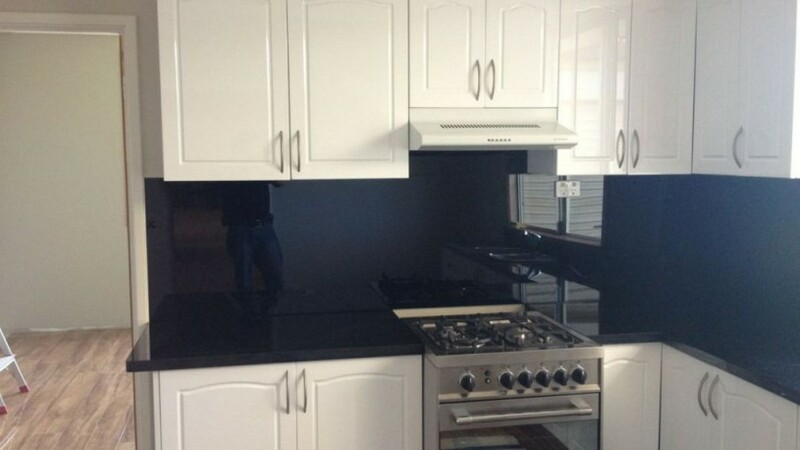 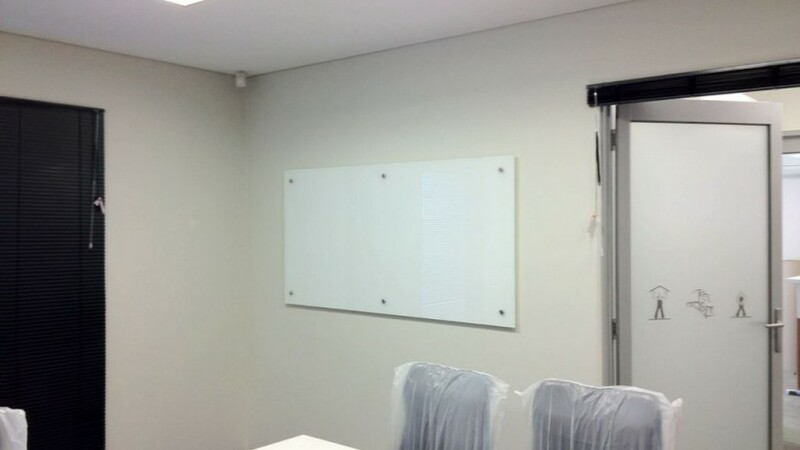 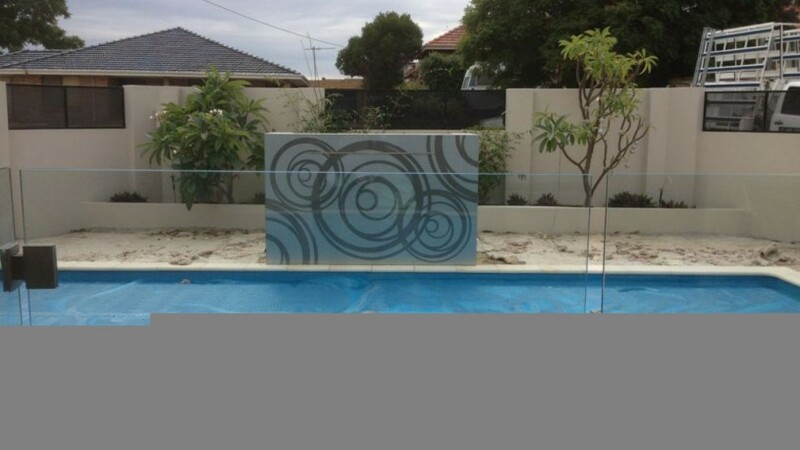 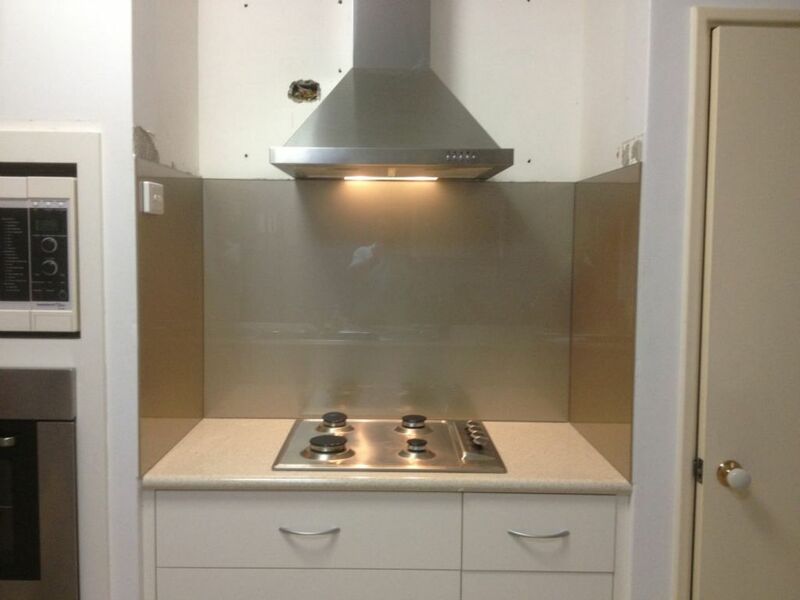 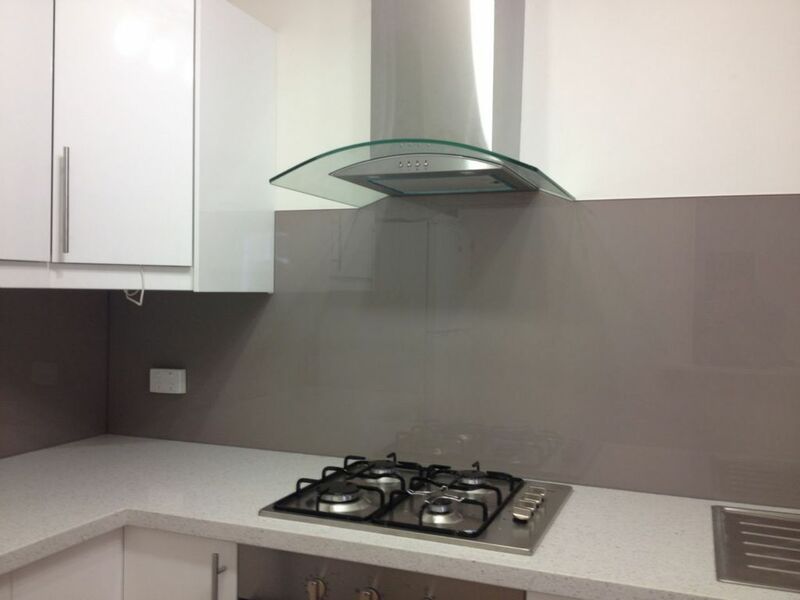 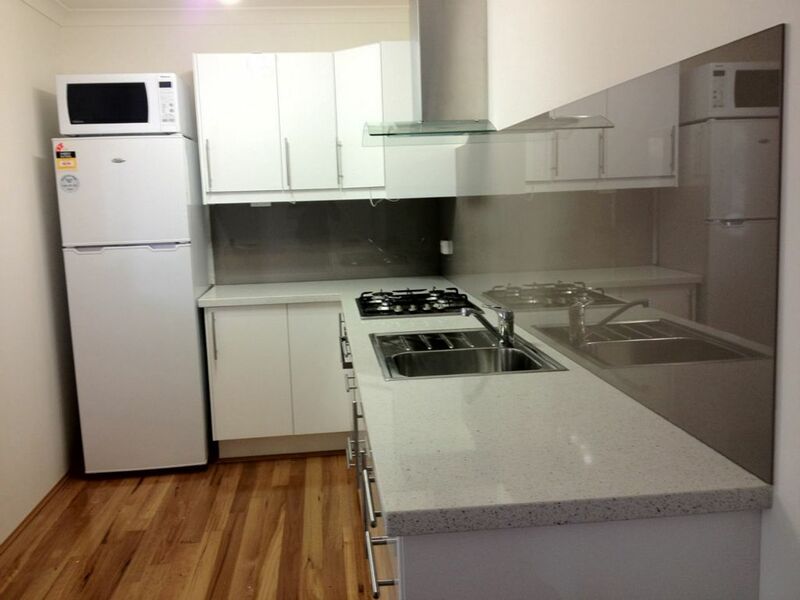 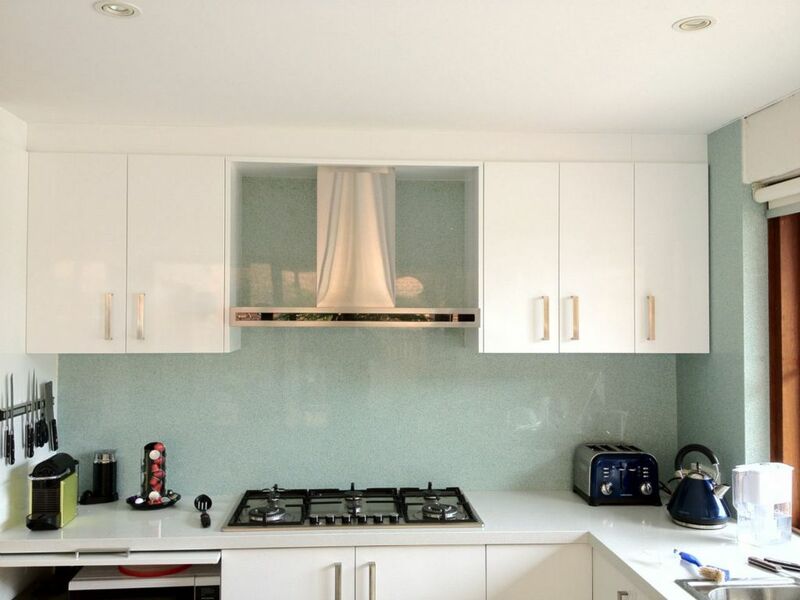 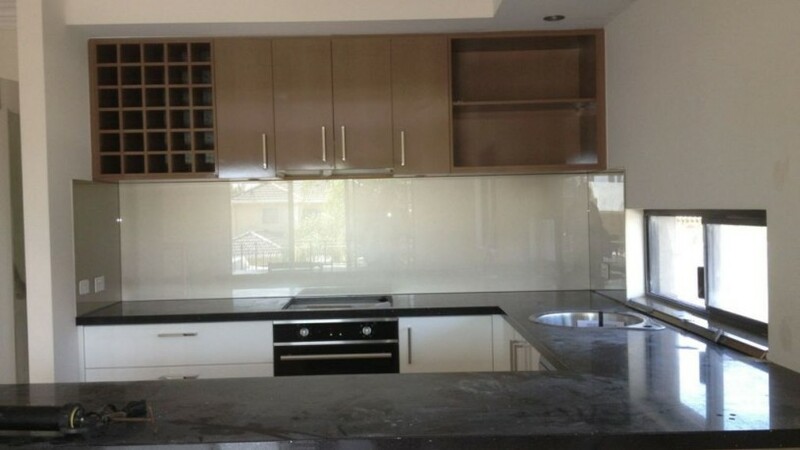 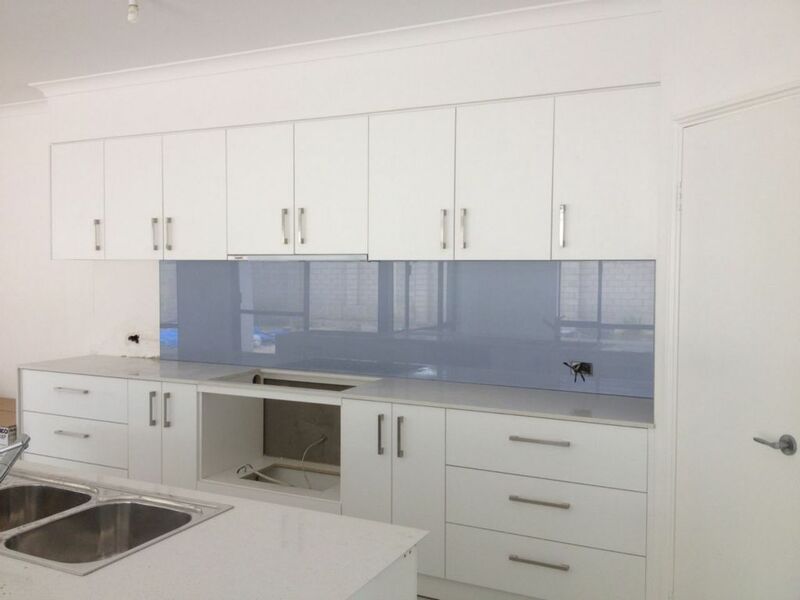 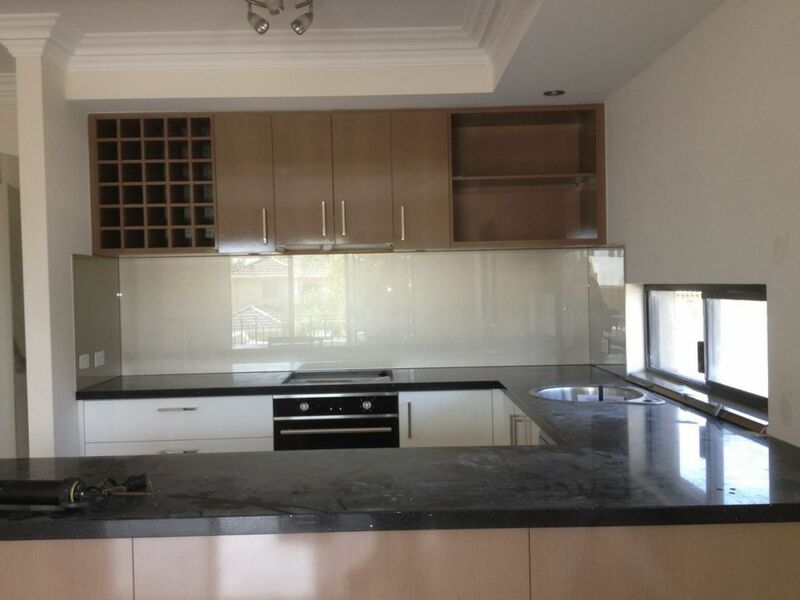 WA Custom Glass Splashbacks are made from either 6mm standard or 6mm ultra clear toughened safety glass to provide a professional look and quality for your new home or renovation. 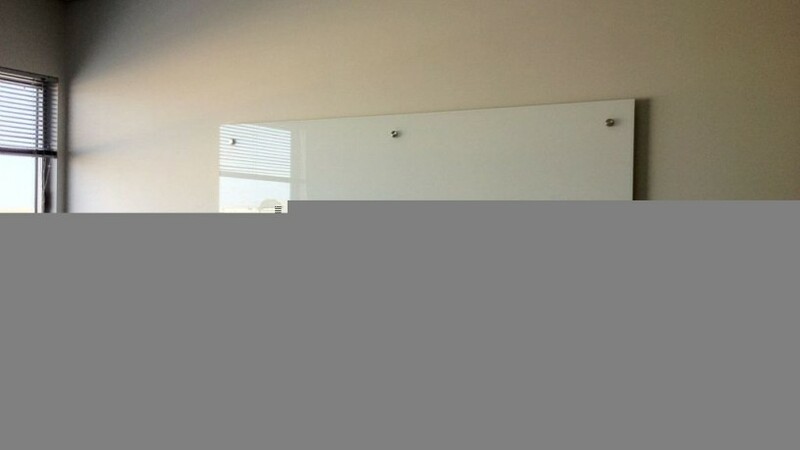 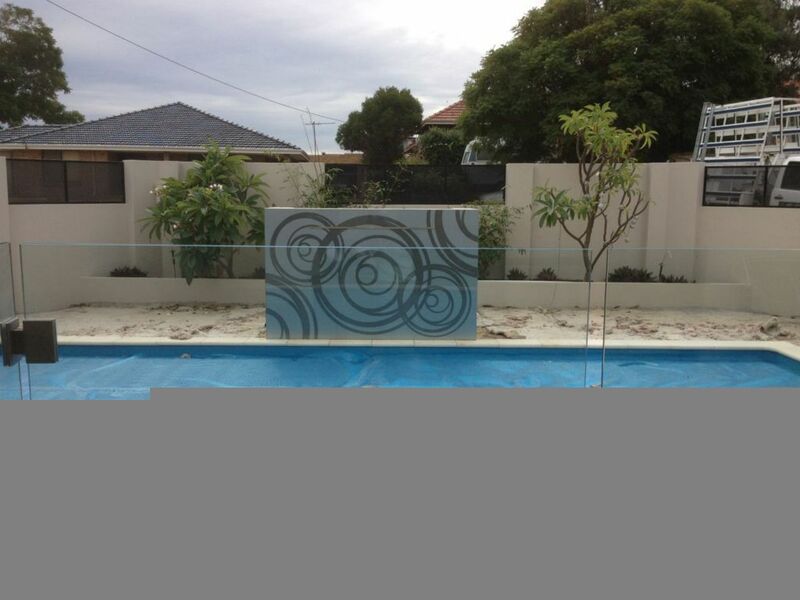 WA Custom Glass Glaziers specialize in the art of instalment, but our new technology has turned that art into a science. 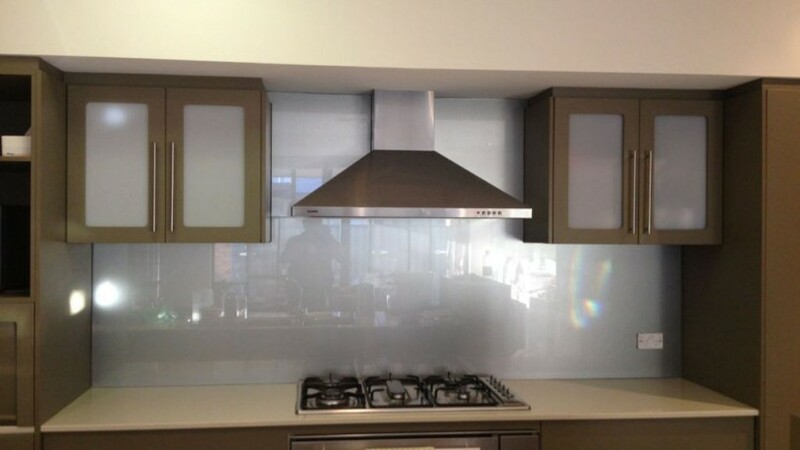 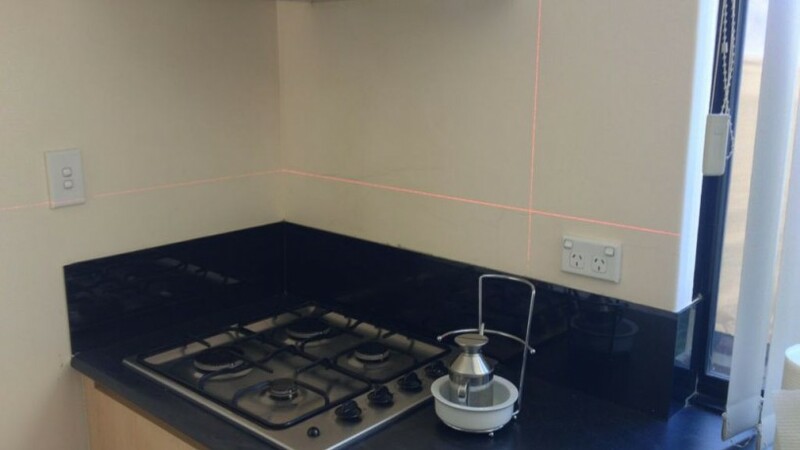 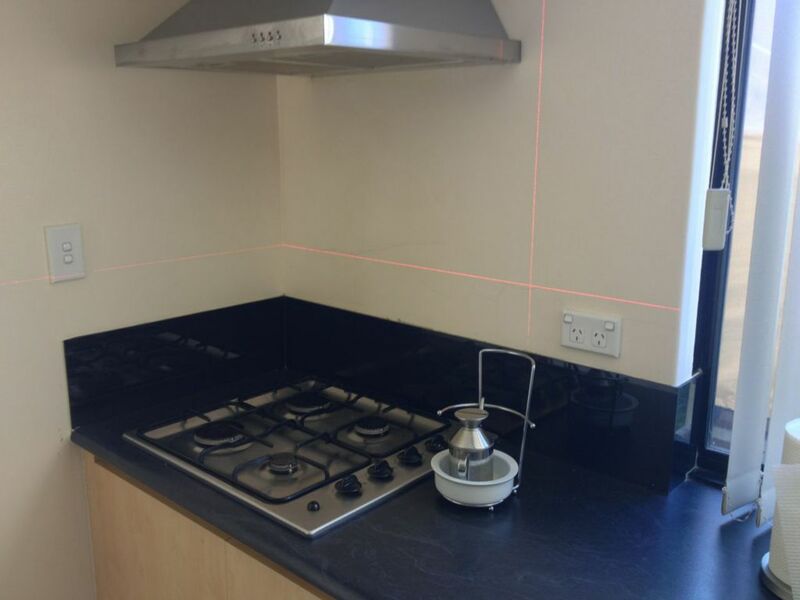 During measurements and installations our Glaziers use a Crosshair Laser system to perfectly fit and place each panel of Splashback that is installed. 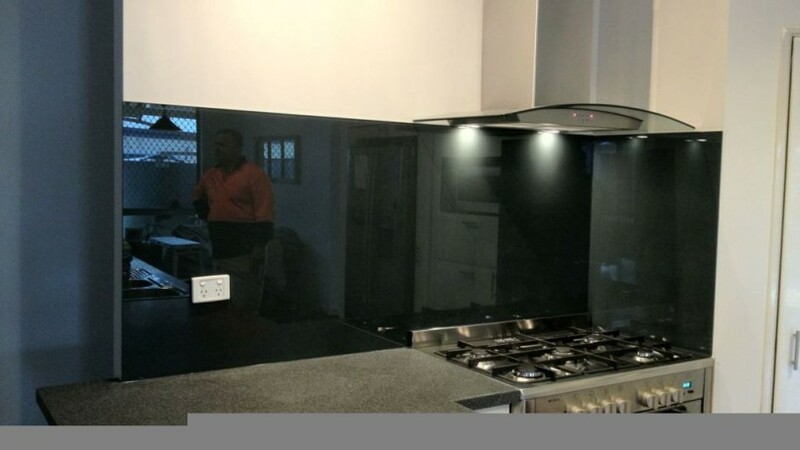 Each piece is carefully laid with silicon which adheres to the wall and prevents any movement once the silicon is allowed to dry. 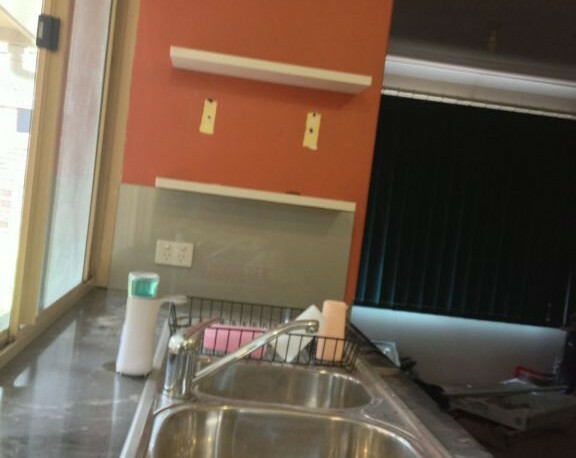 And remember that old saying about practice makes perfect? 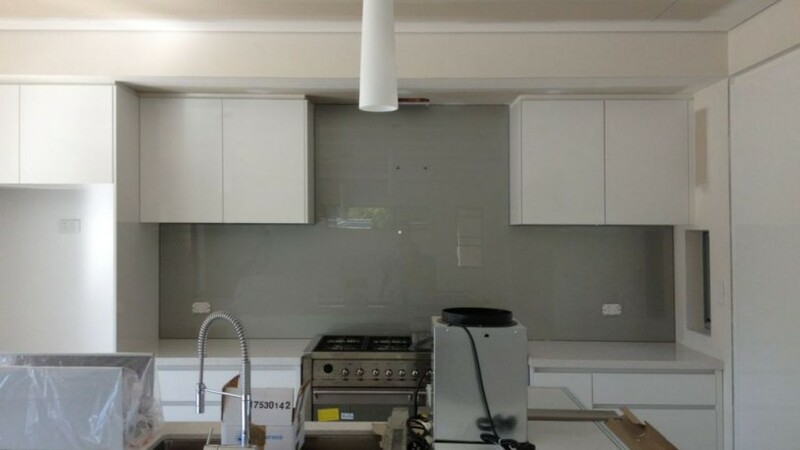 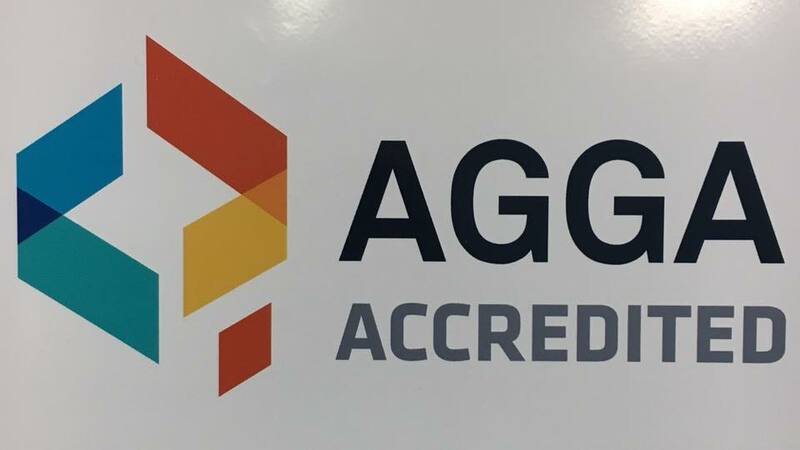 Our Glaziers have some of the most experience in the industry due to the high number of instalments they perform each week. 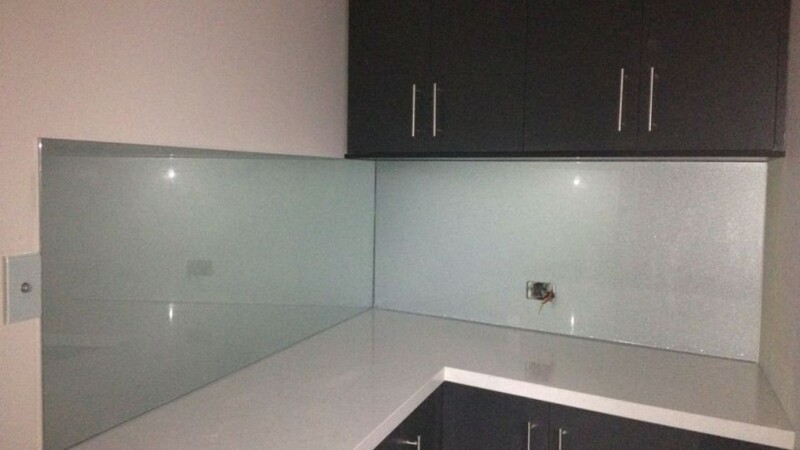 Although mistakes can be made when working with glass products, our team takes every precaution to minimize risks and deliver the highest quality product to your home. 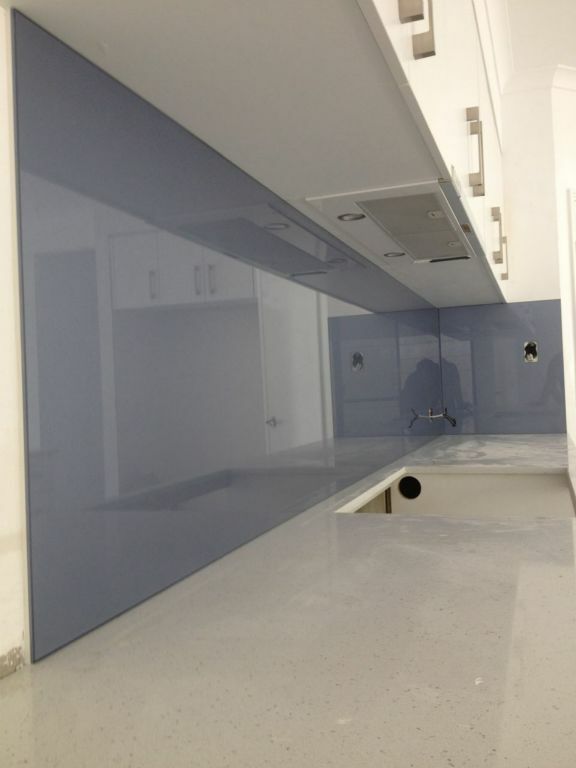 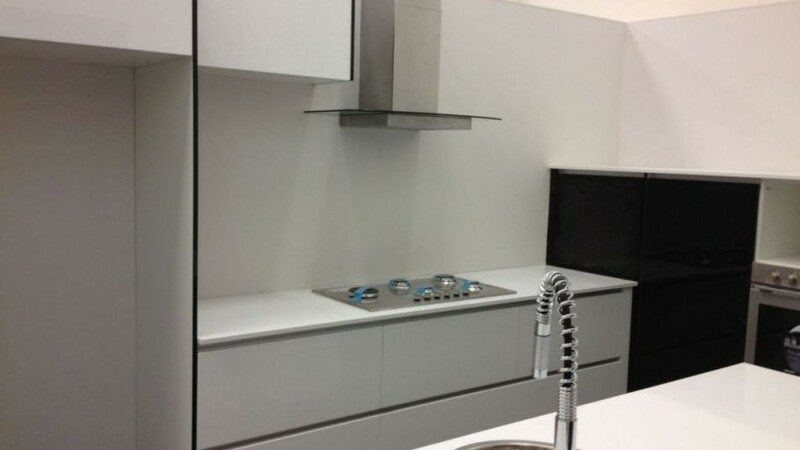 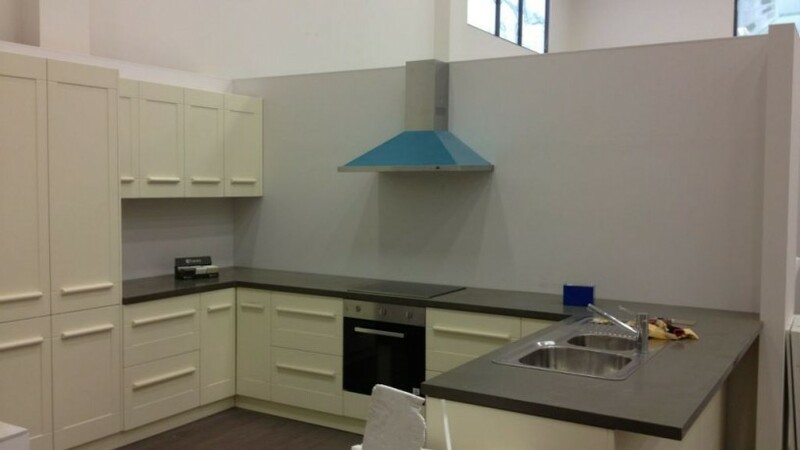 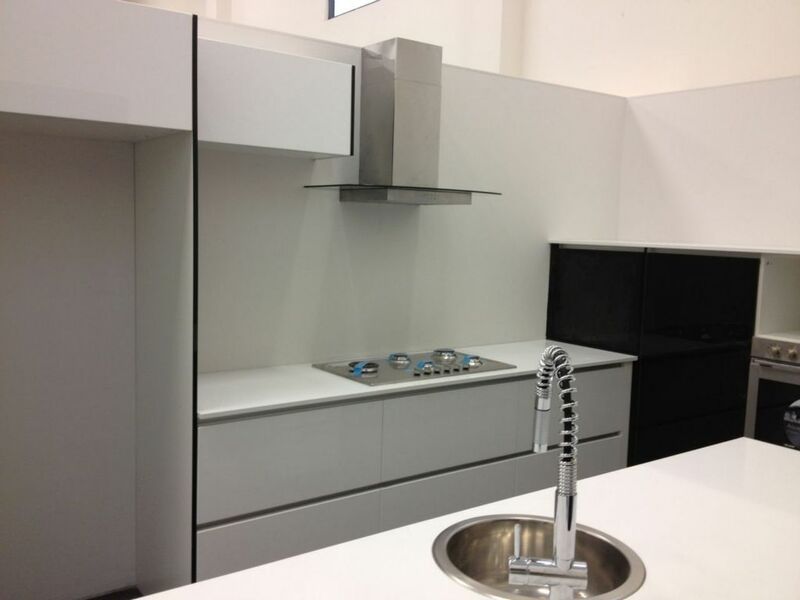 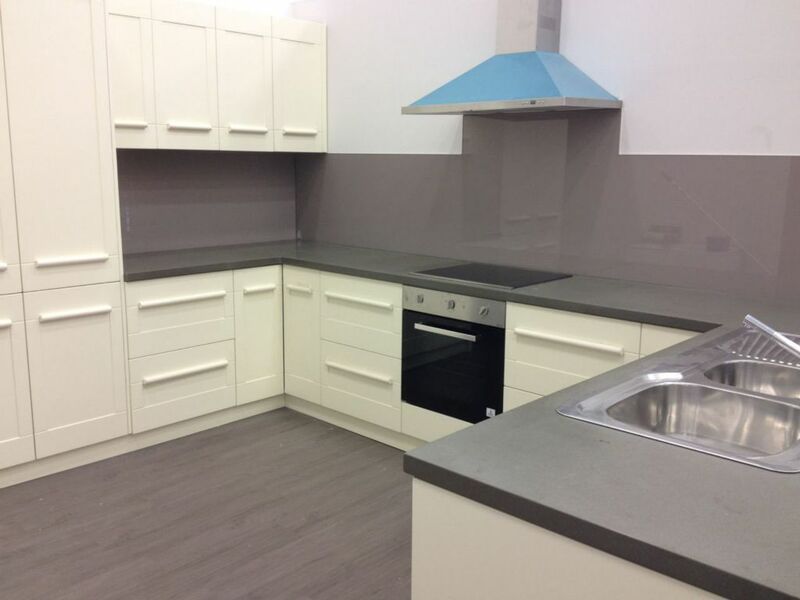 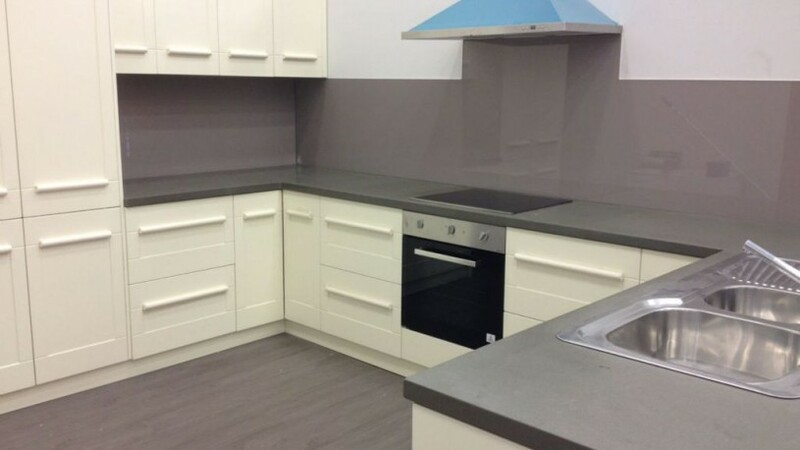 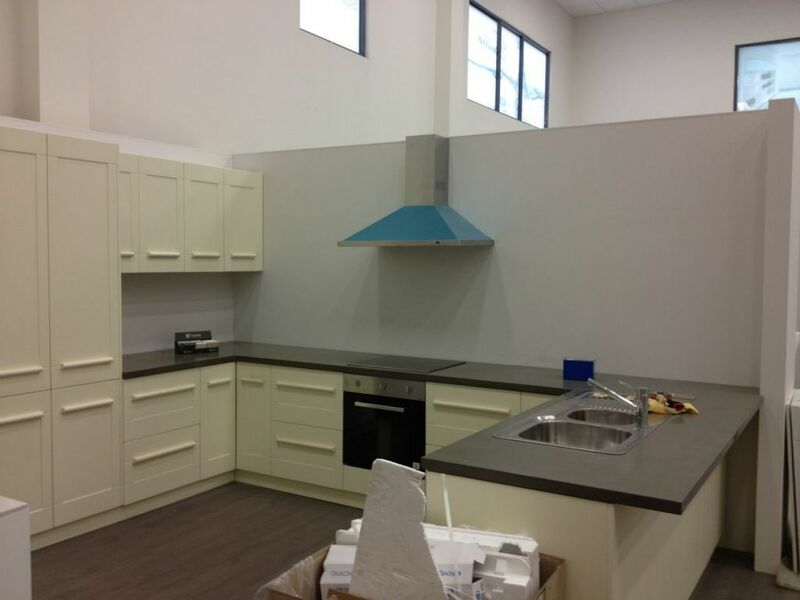 To ensure safety and durability, before installation all of our Splashbacks go through the toughening process after being cut to perfectly match your space within our tolerance limit of 4mm of uneven gap. 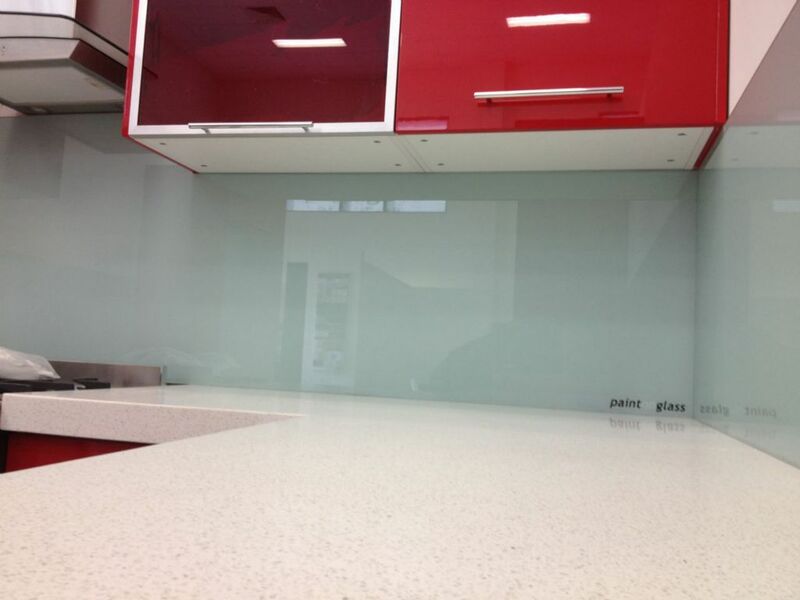 This process hardens the glass making it much more resistant to chipping or cracks. 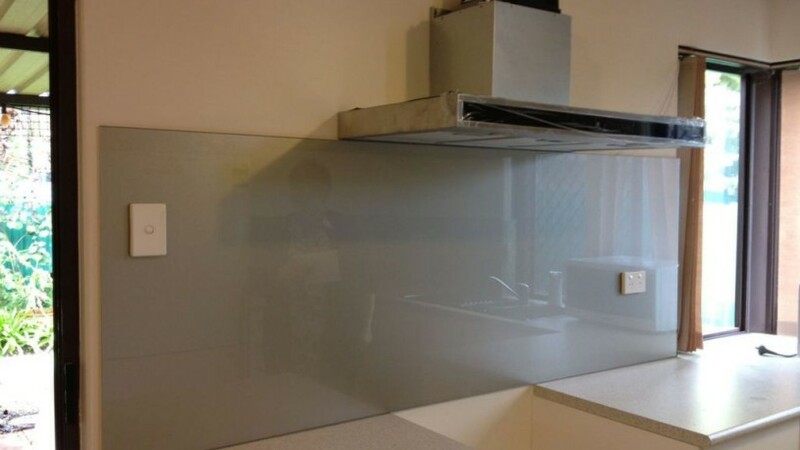 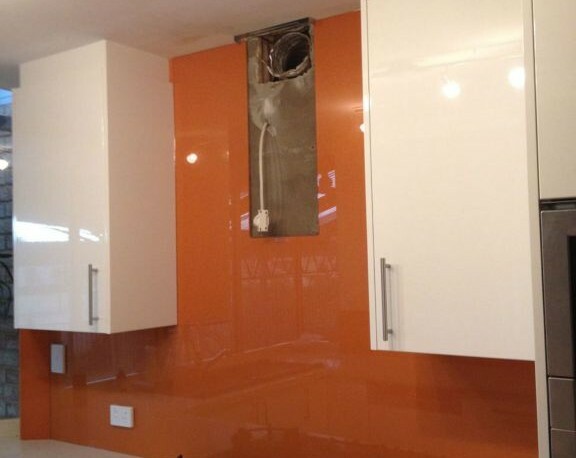 Toughened safety glass also enables us to place Splashbacks near any surface, including stove tops, because it enables the Splashback to withstand much more heat than normal glass. 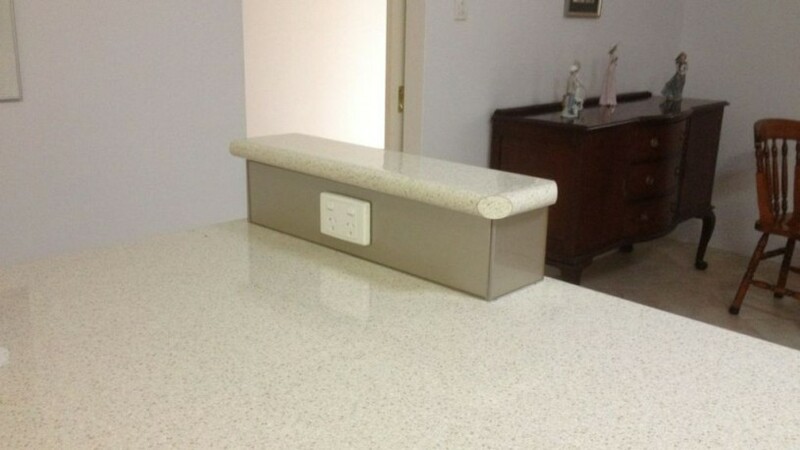 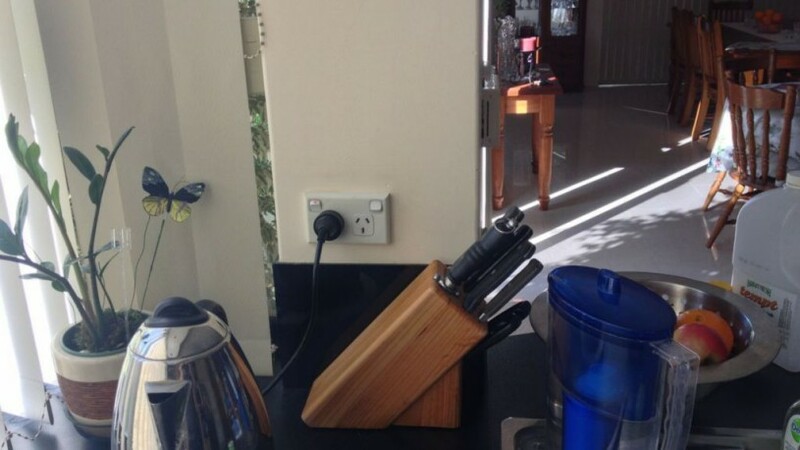 unique to the customer. 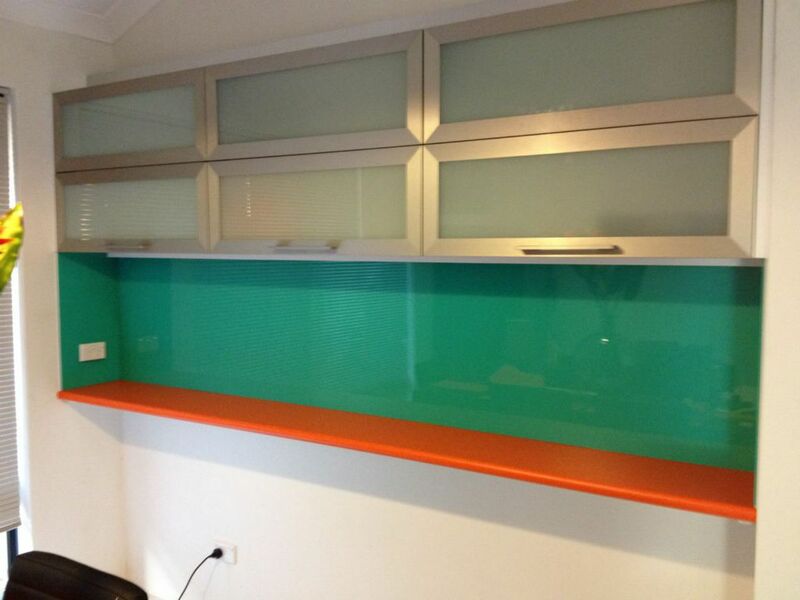 Our specially formulated paint is designed to blend with the glass to prevent discoloration or fade. 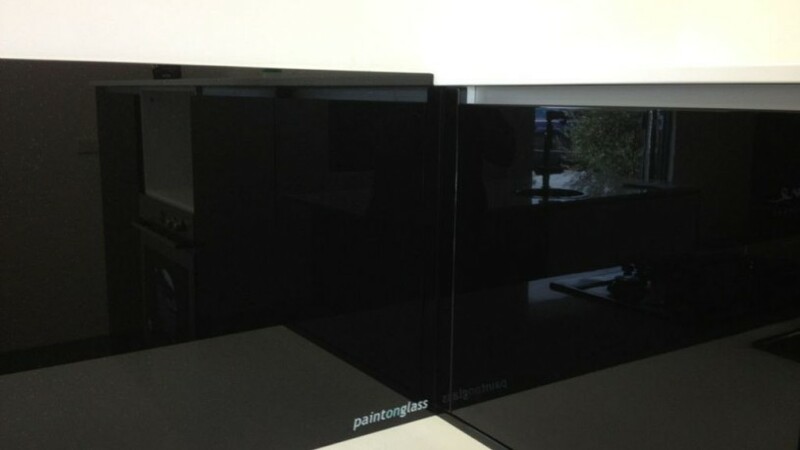 We even have a 2 year warranty on our paint, ensuring it to last as long as the glass itself. 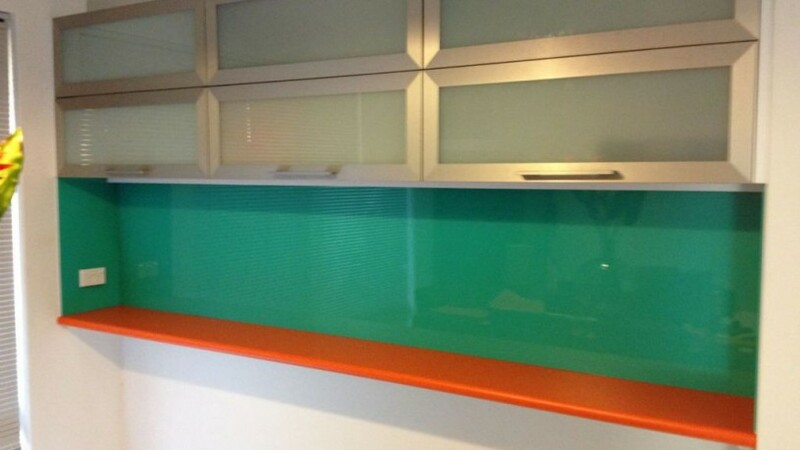 In addition to a high range of colours we also offer three variations in glass type to best fit your colour selection. 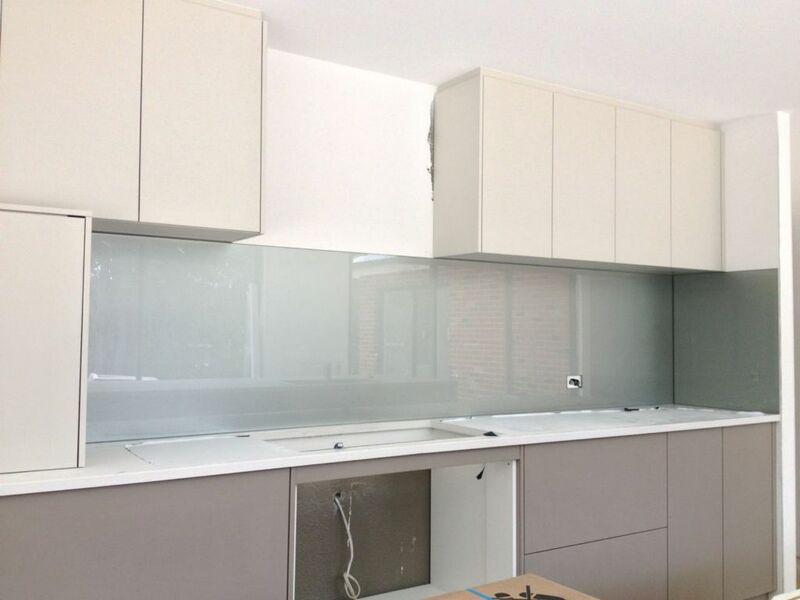 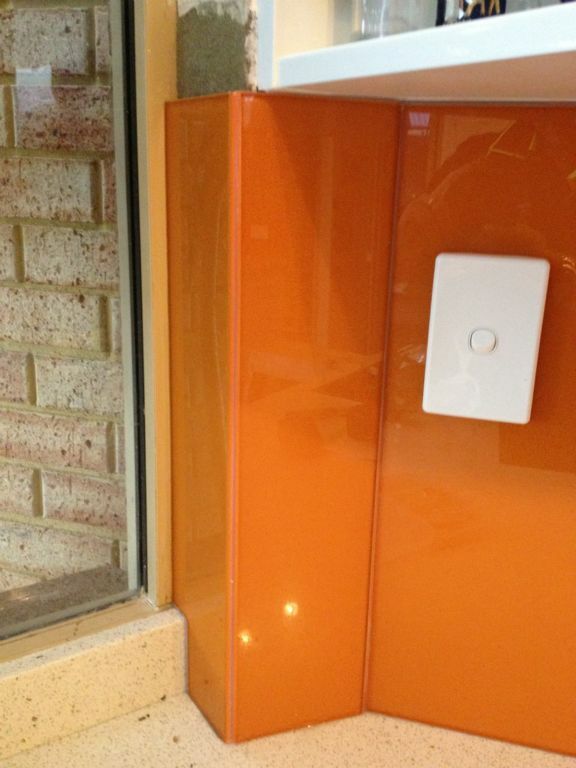 All three options will be Toughened Safety Glass before installation. 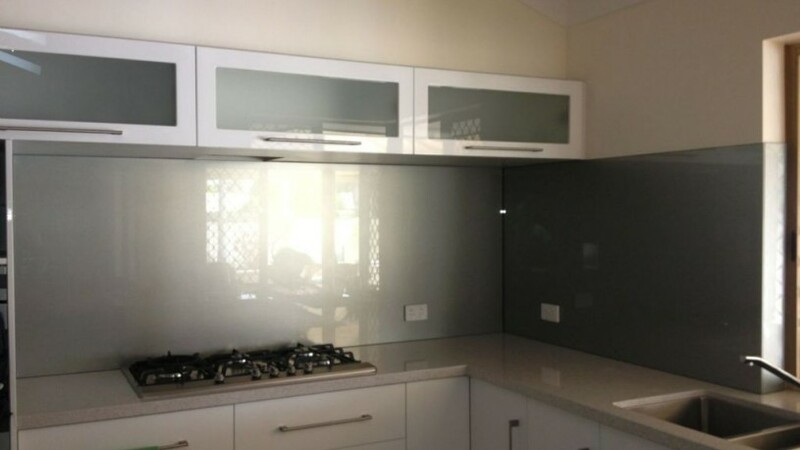 The three options for glass selection provided by WA Custom Glass are Standard, Ultra Clear and Mirrored. 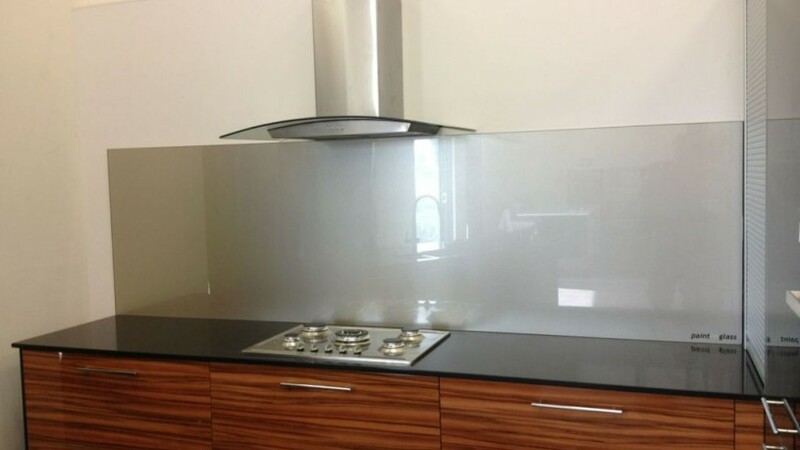 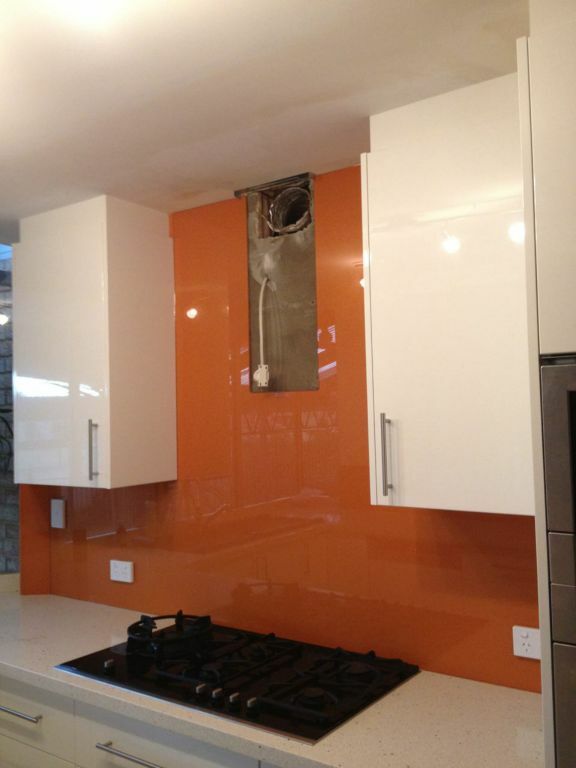 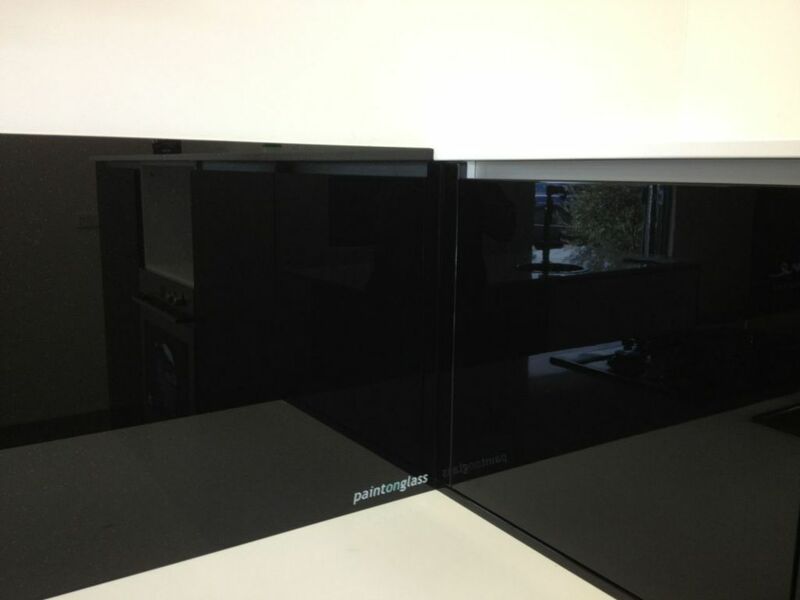 Q: What type of glass is used for your splashbacks? 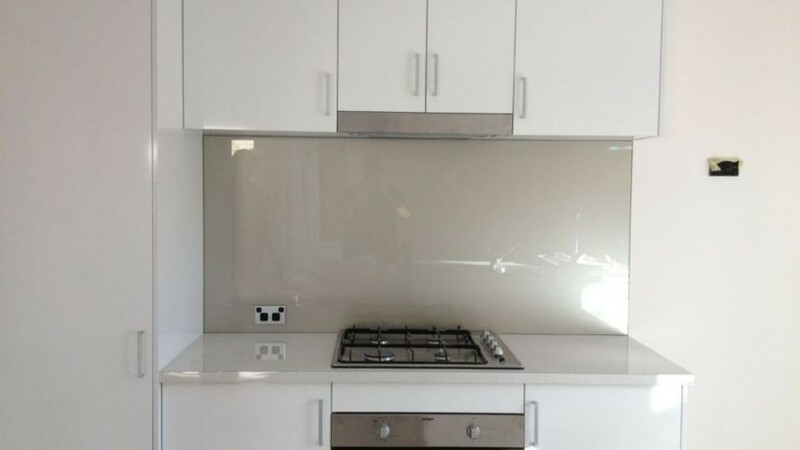 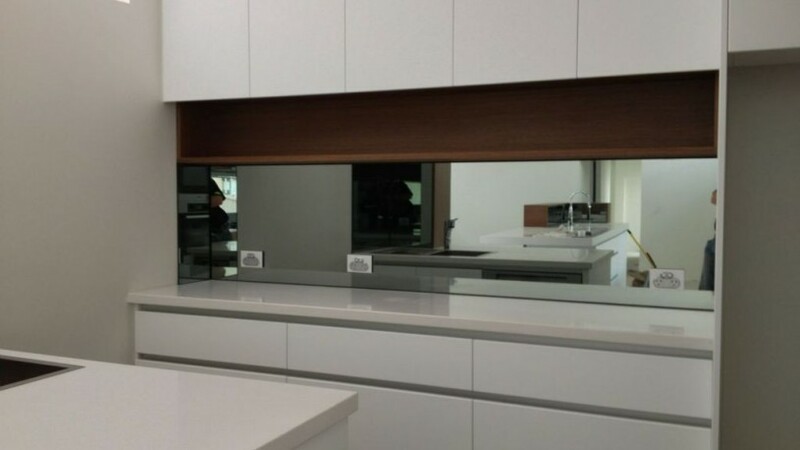 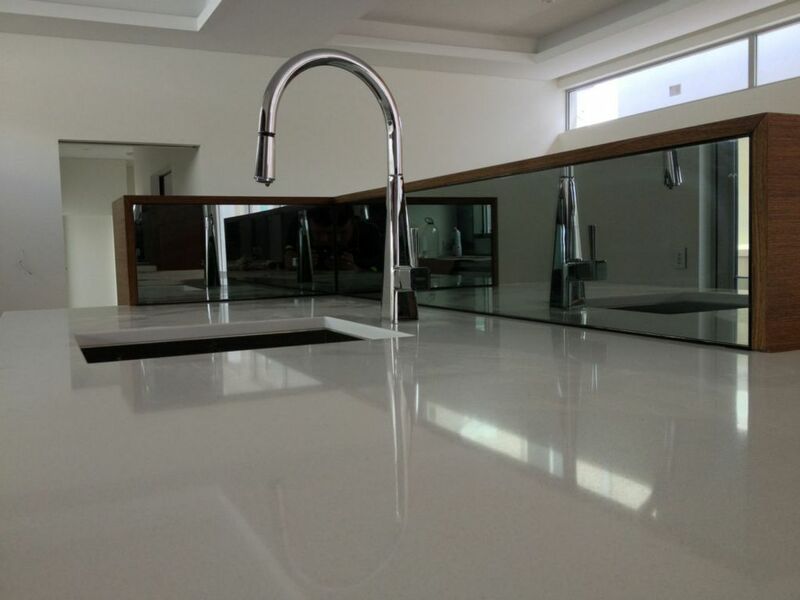 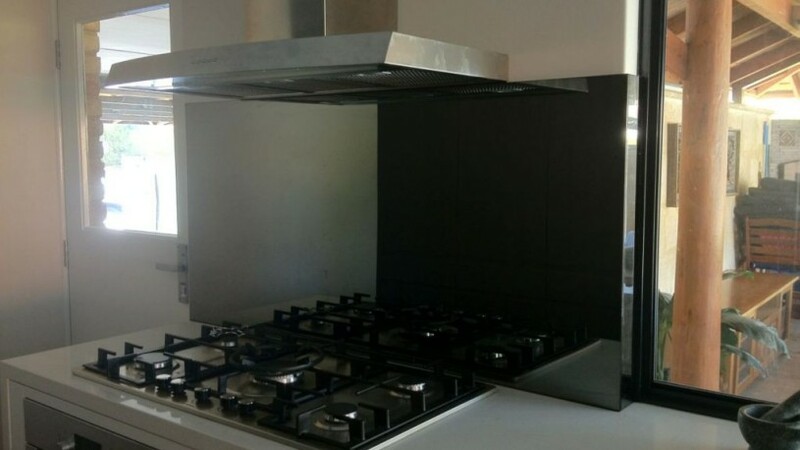 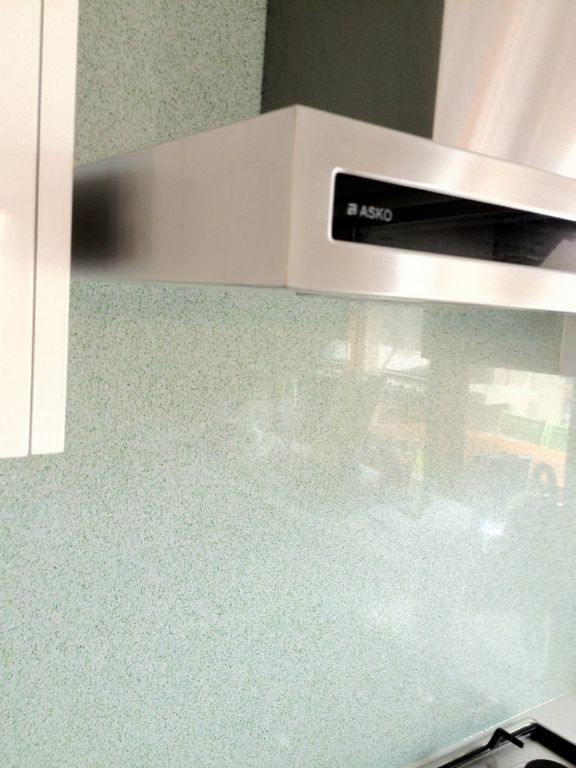 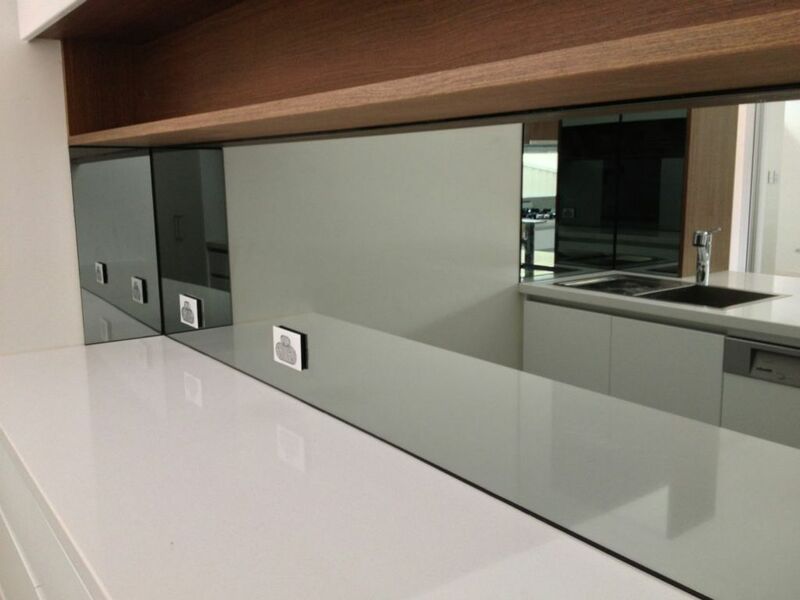 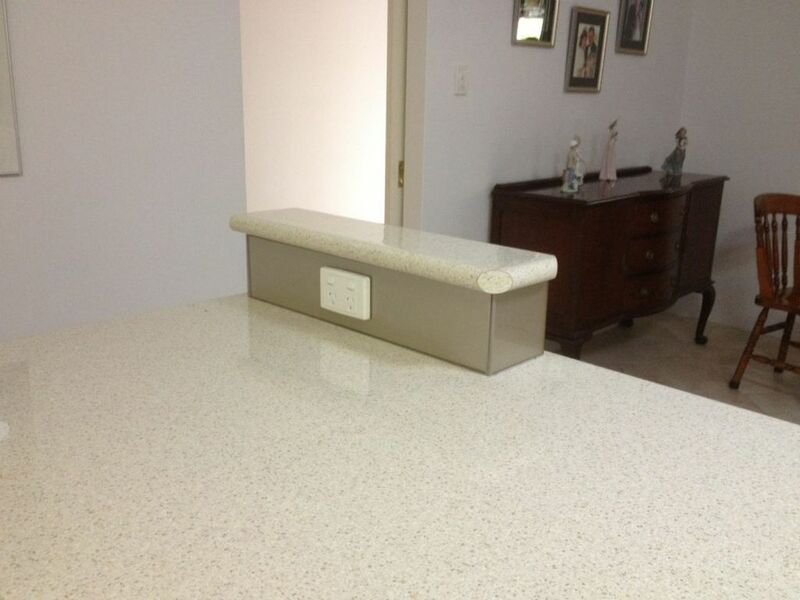 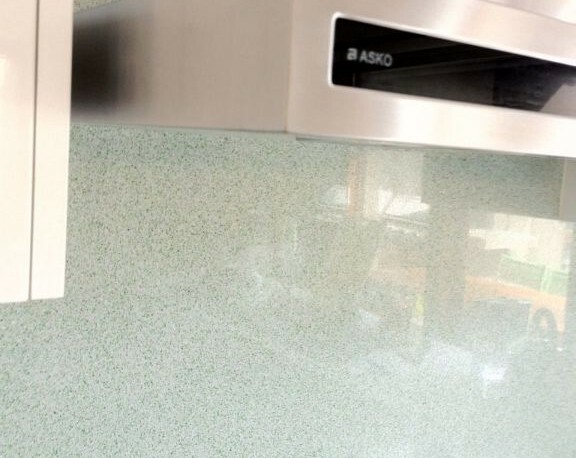 A: WA Custom Glass Splashbacks are made from 6mm toughened safety glass to provide a professional look and quality for your new home or renovation. 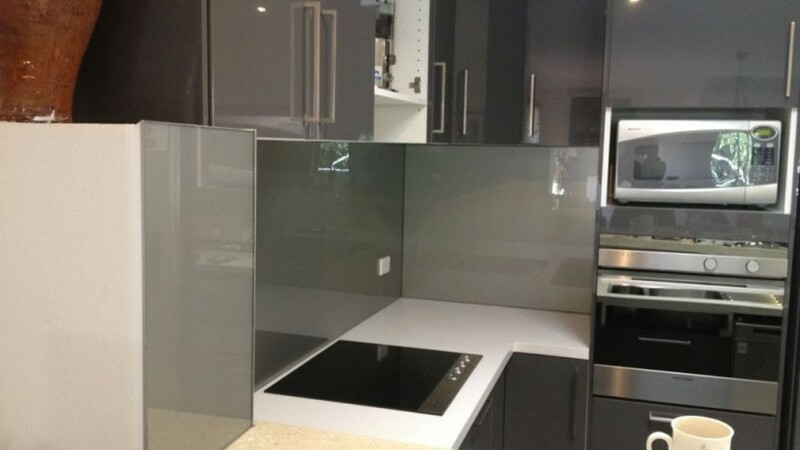 The three options for glass selection provided by WA Custom Glass are Standard, Ultra Clear and Mirrored. 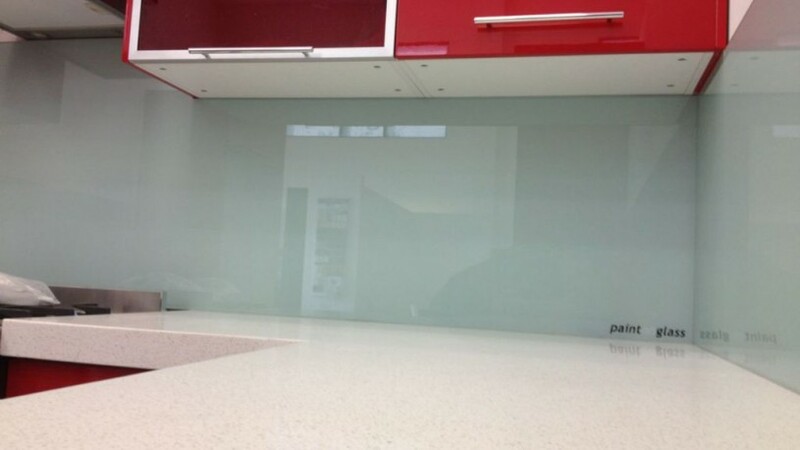 Q: What is the difference between Standard and Ultra Clear Glass? 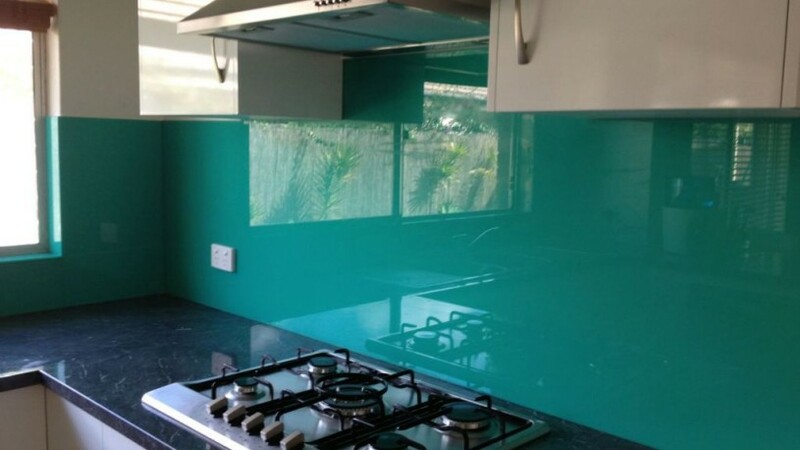 A: When glass is made, certain chemicals are used that give the glass a greenish hue. 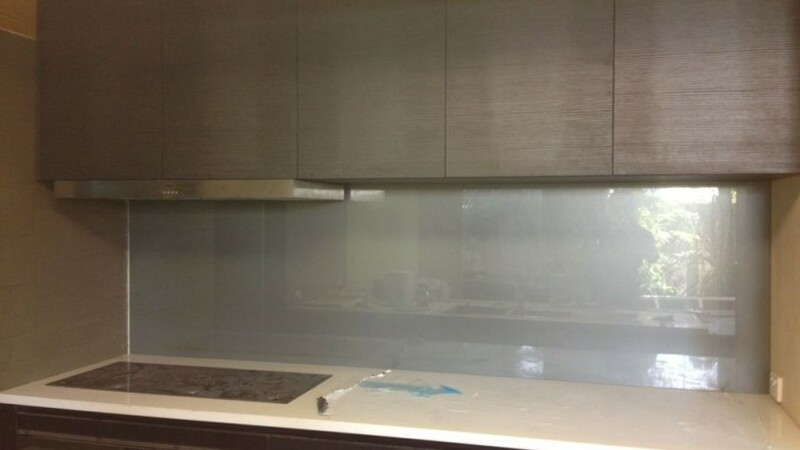 Ultra Clear glass goes through a secondary refining process that removes about 80% of these chemicals. 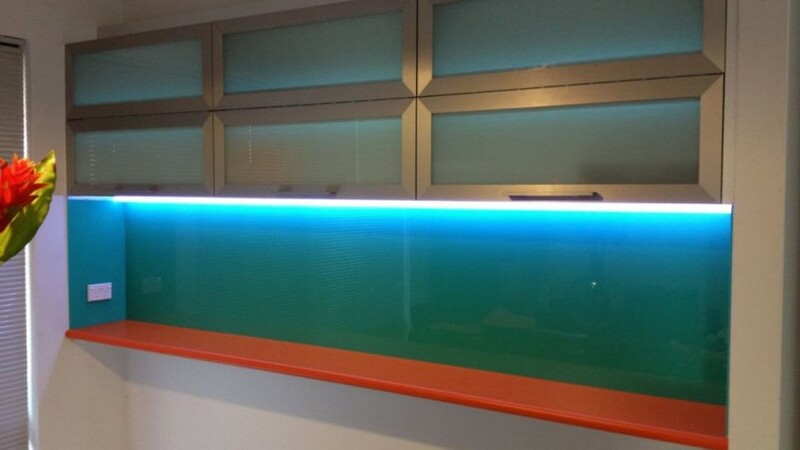 This give the paint a much truer representation of colour when viewed through the glass. 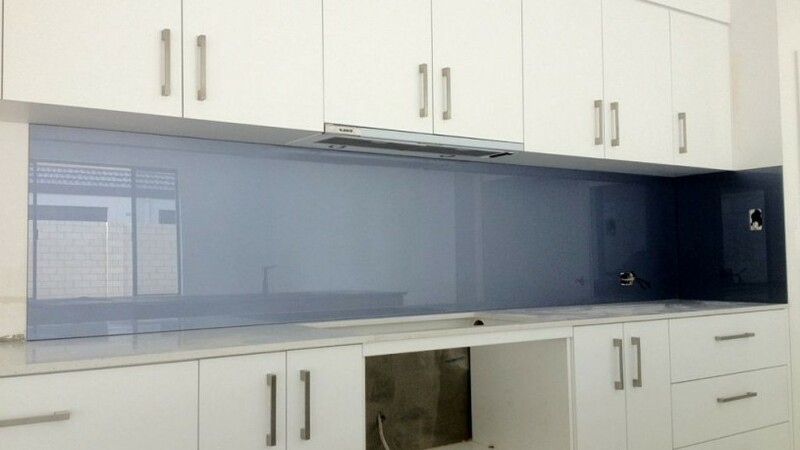 Q: How is the glass measured to fit into my home? 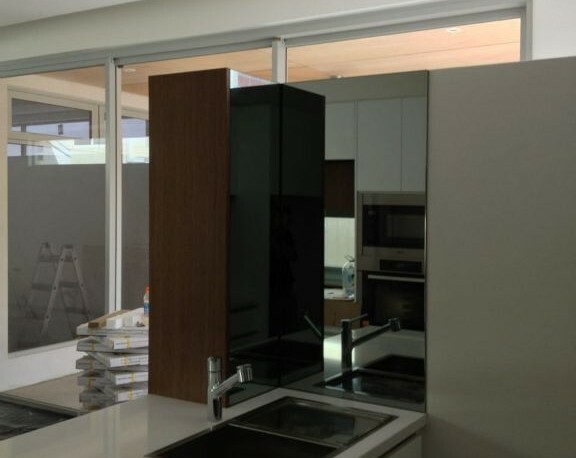 A: During measurements and installations our Glaziers use a Crosshair Laser system to perfectly fit and place each panel of Splashback that is installed. 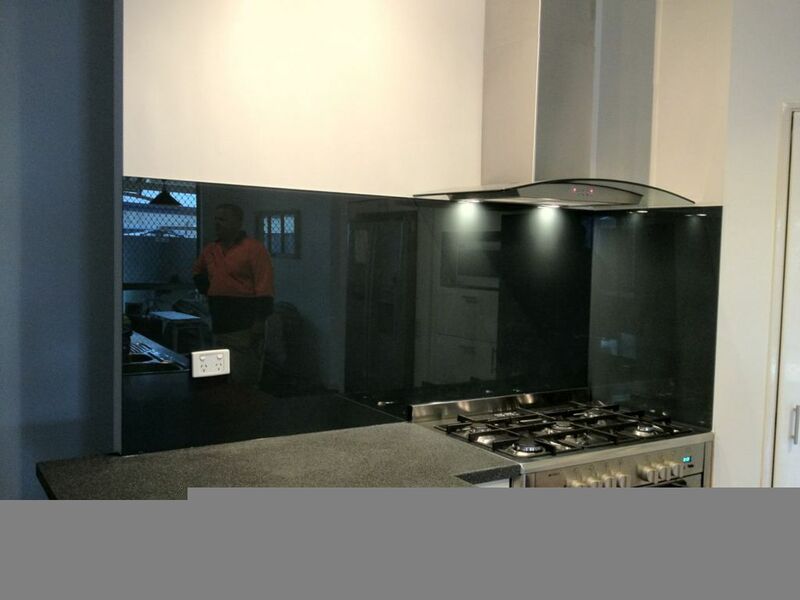 Each piece is carefully laid with silicon which adheres to the wall and prevents any movement once the silicon can dry after 24 hours. 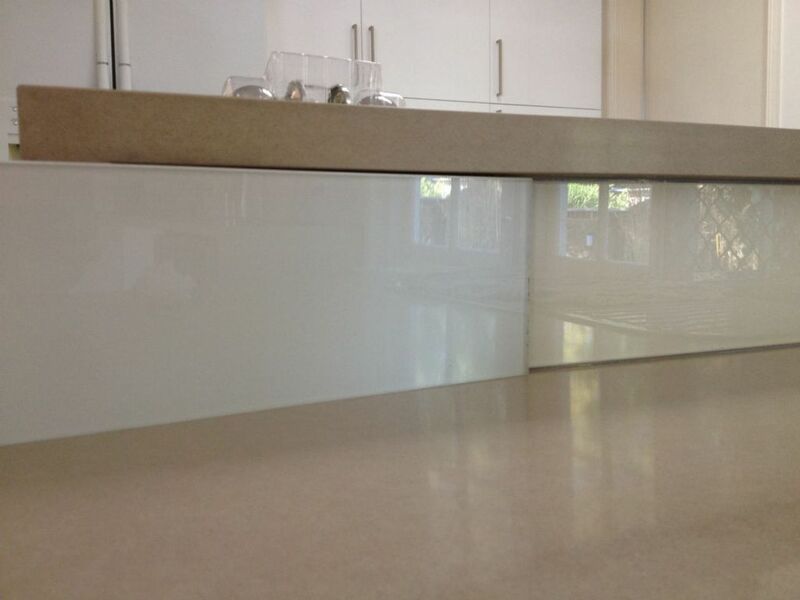 We will fit your space within our industry tolerance limit of 3-5mm to allow for uneven gaps. 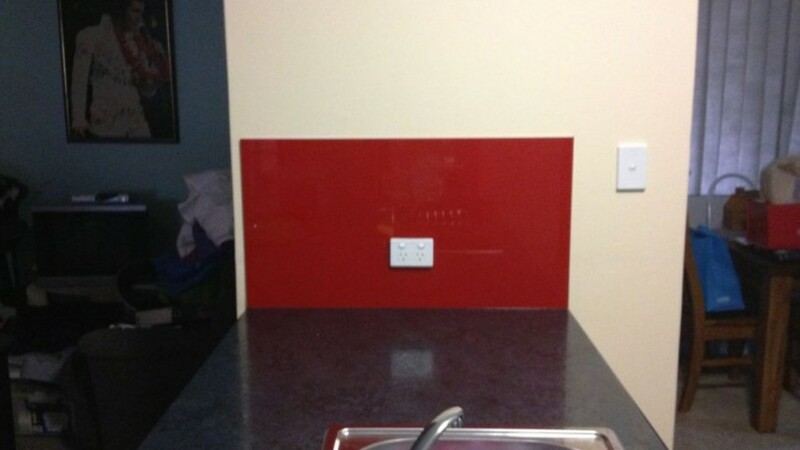 Q: Is the glass coloured or is it painted? 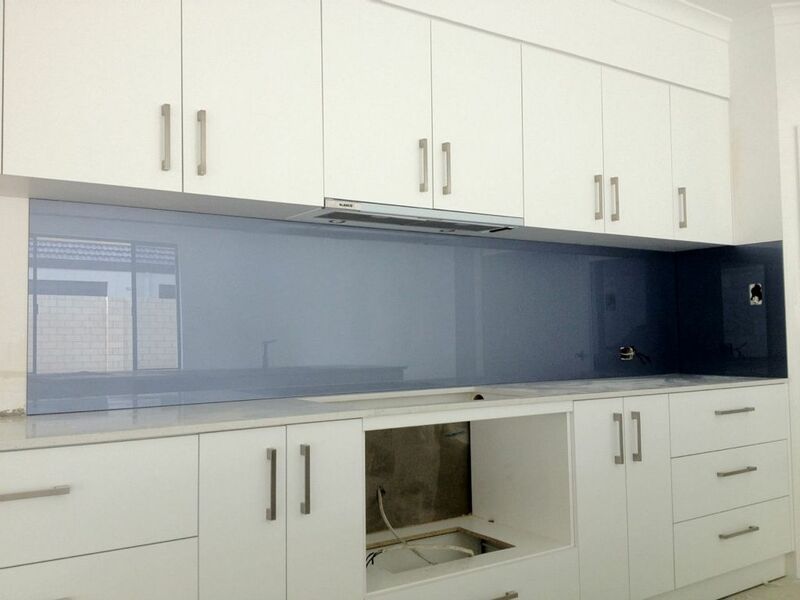 A: We offer specially formulated paint, designed to blend with the glass to prevent discoloration or fade. 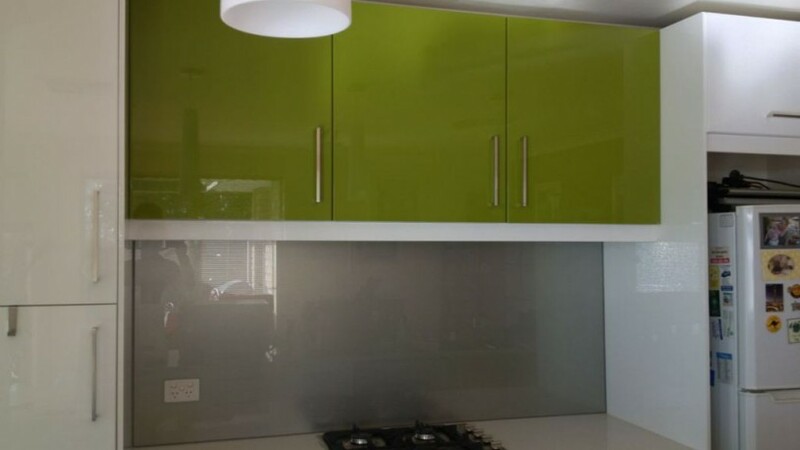 We provide a two year warranty on our paint, ensuring it to last as long as the glass itself. 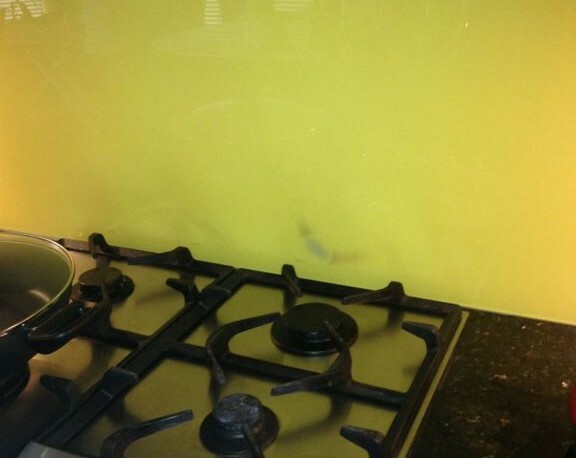 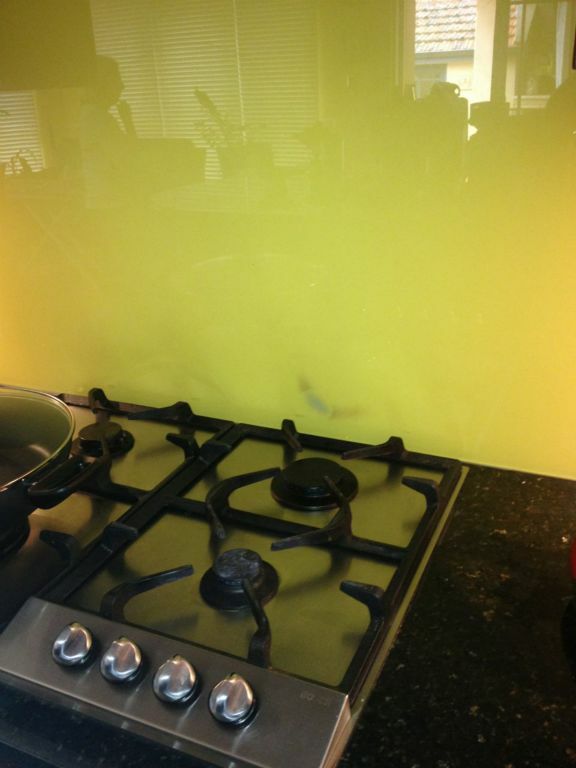 Q: Why does my splashback have marks or discolouration? 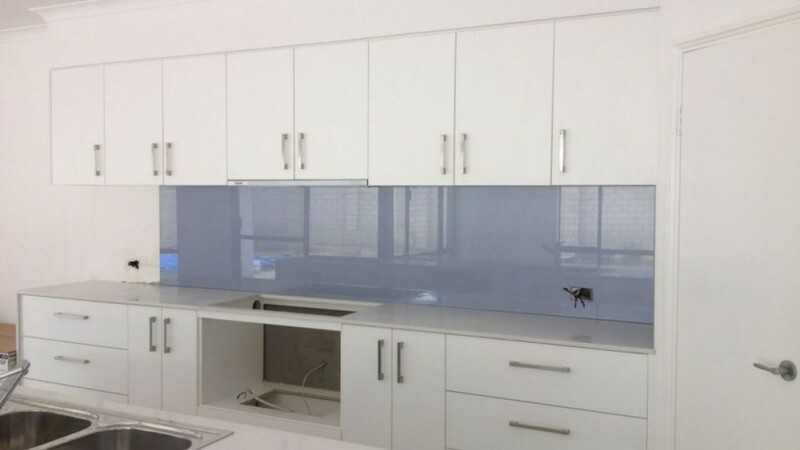 A: On some colours, especially white or grey based colours, the silicone used to install the Splashback may show through the glass until it is completely dry. 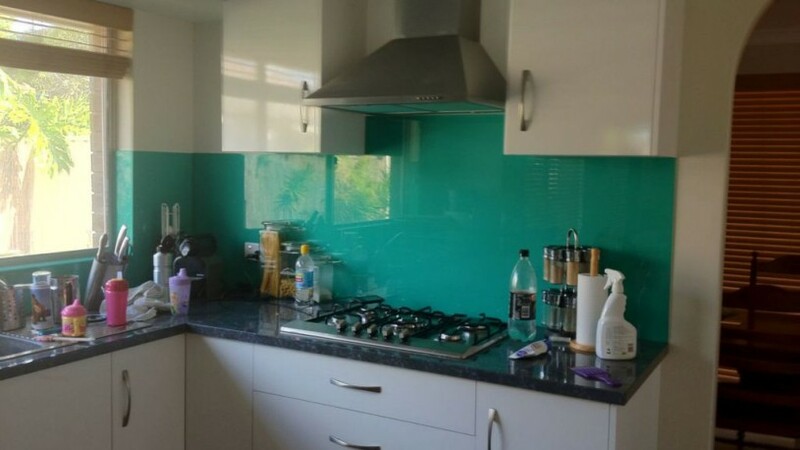 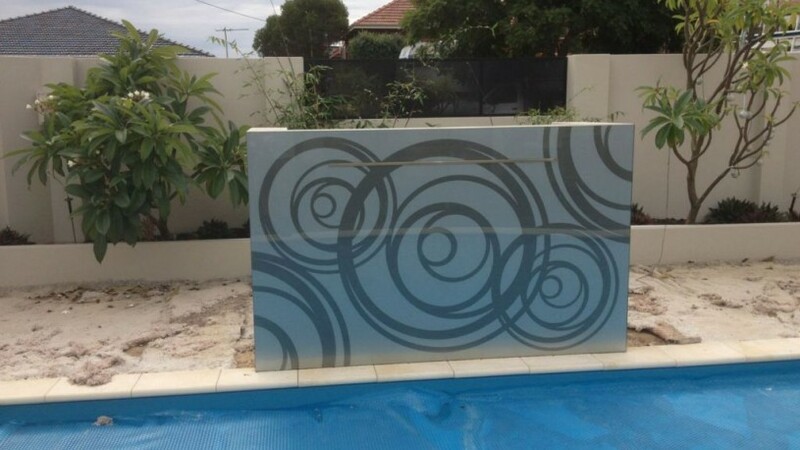 This process can take anywhere from a few hours to a few days based on the size of the splashback and how much silicone was required to install each specific piece. 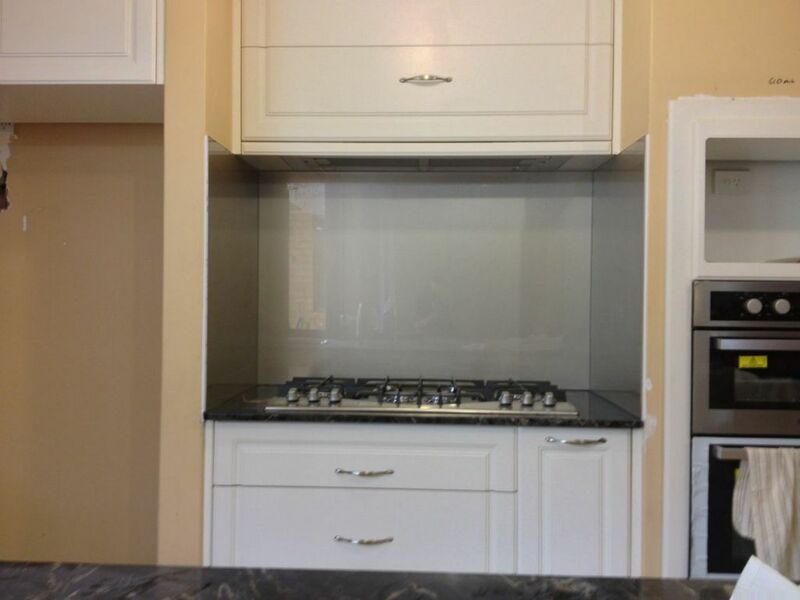 Please note that each litre of paint is custom mixed, we will do our best to colour match your selection. 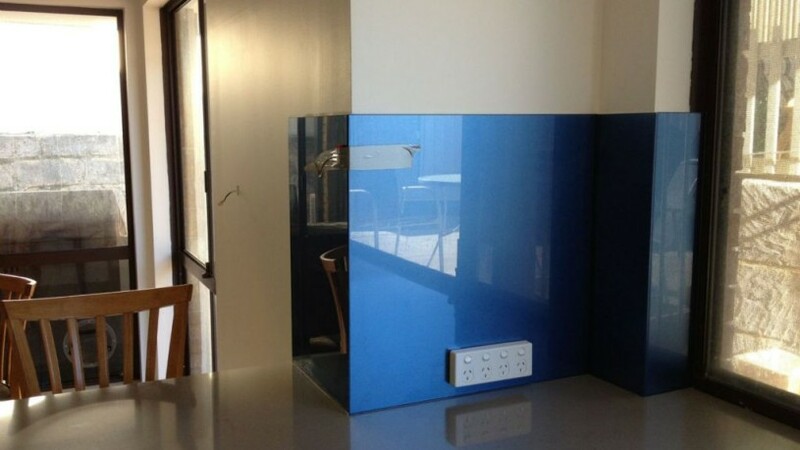 Small variation is to be expected between each custom paint job. 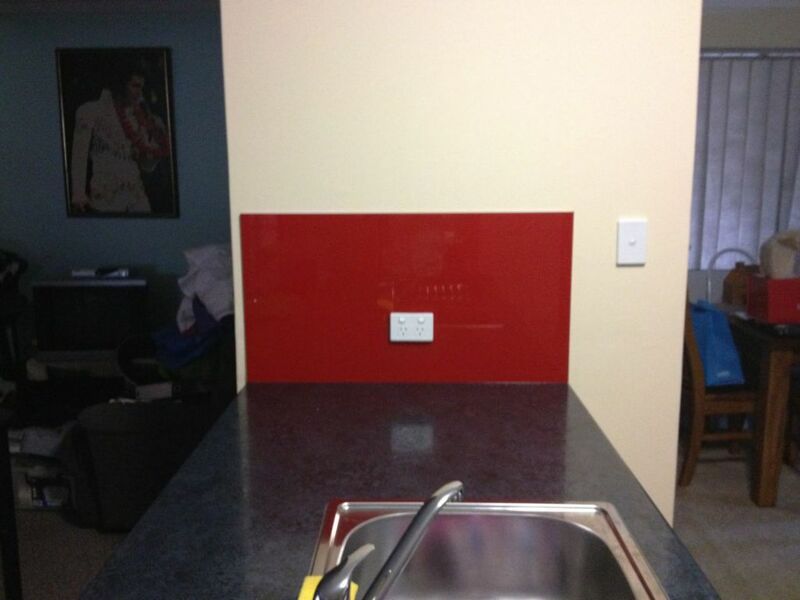 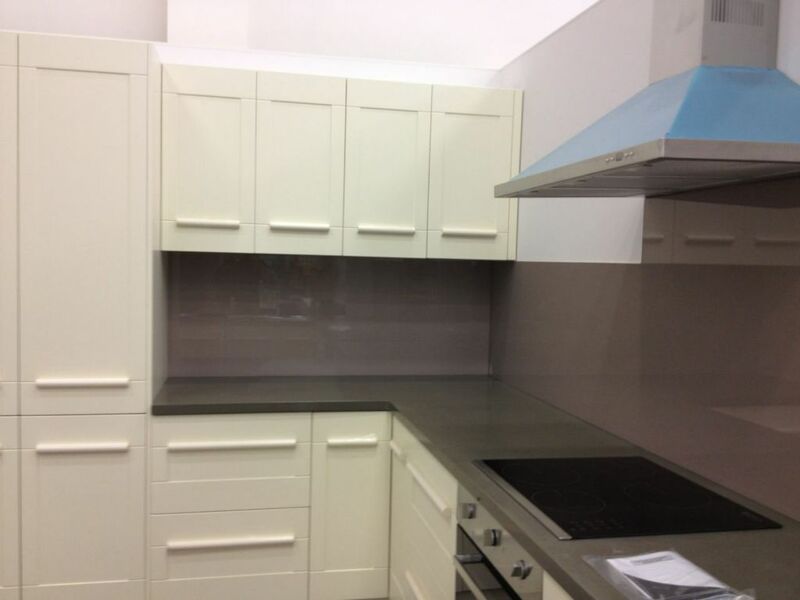 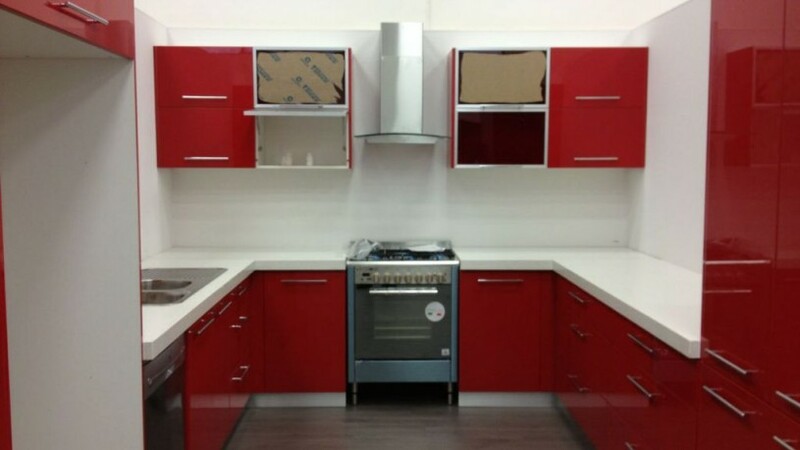 Q: What colours can I chose for my splashback? 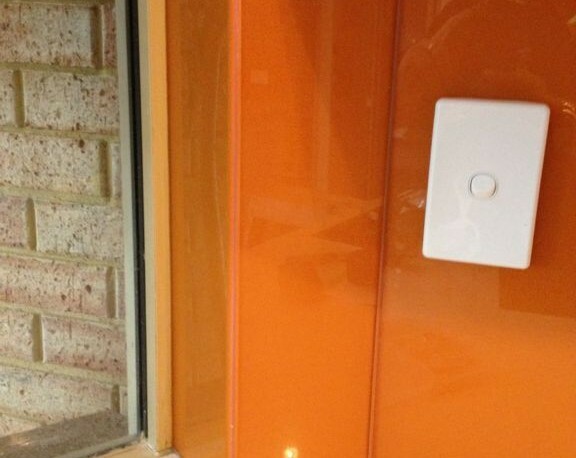 A: Thanks to our custom paint supplier we are able to match 95% of all colours from the DULUX colour range. 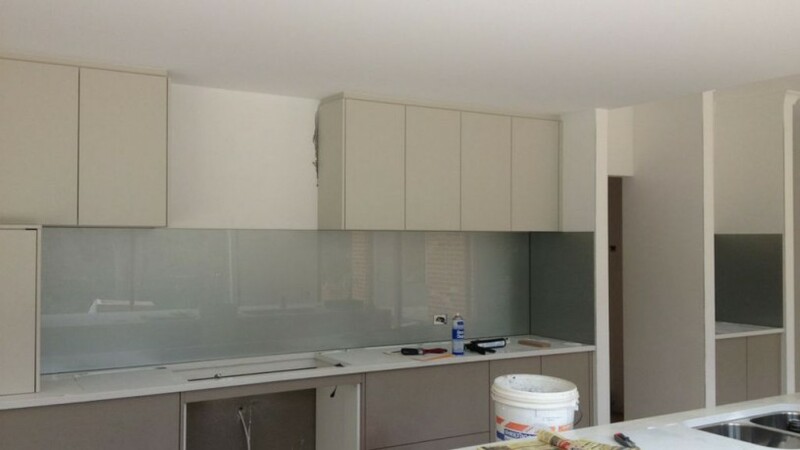 When selecting a custom colour please remember that standard and ultra clear glass will create a different colour of paint. 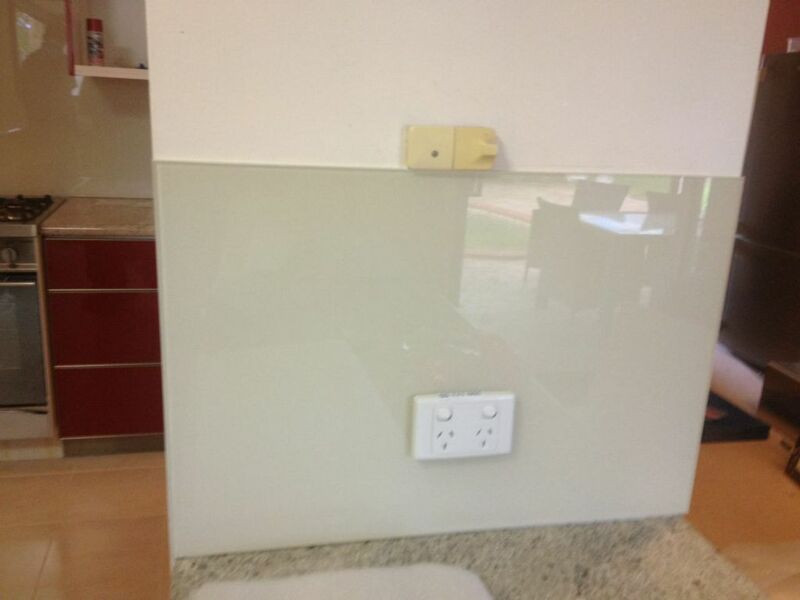 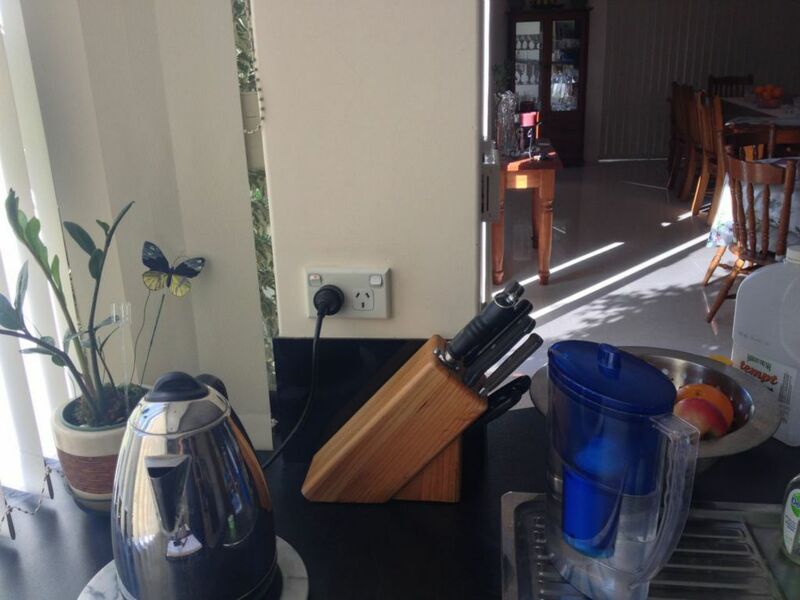 Q: What is this tiny block under my splashback?